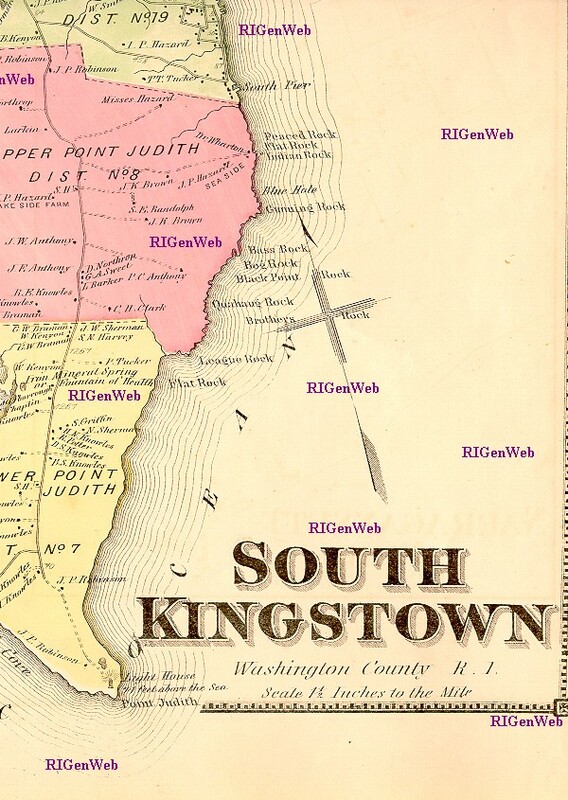 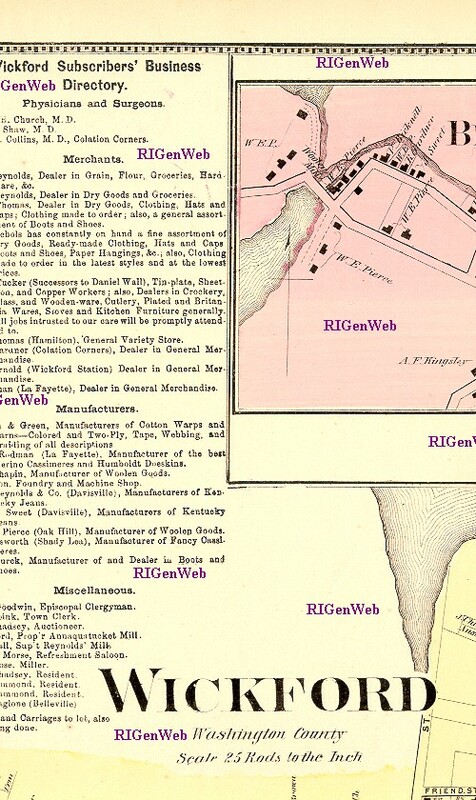 An Enlarged (289 KB) Map of the Yearly Meeting of Friends for New England, 1833. 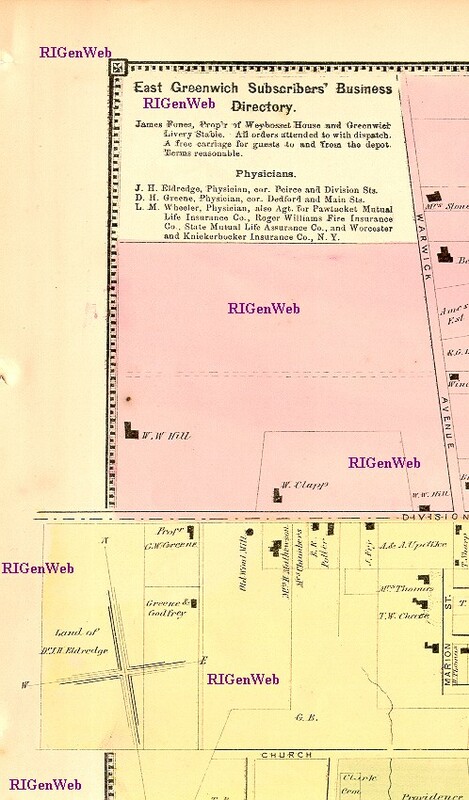 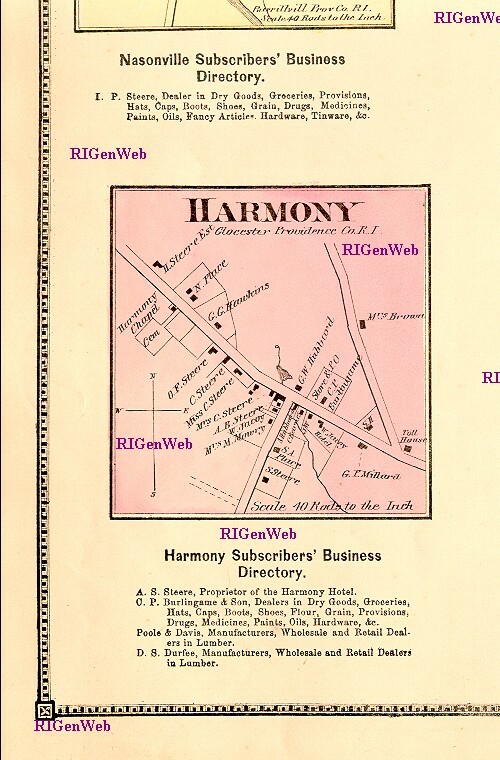 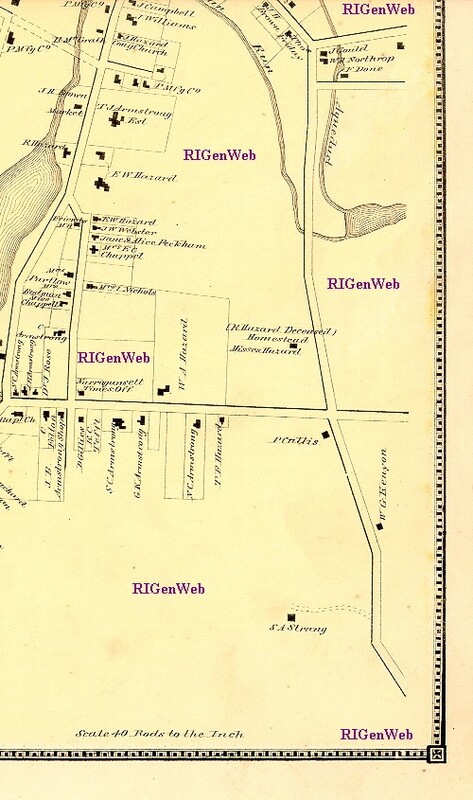 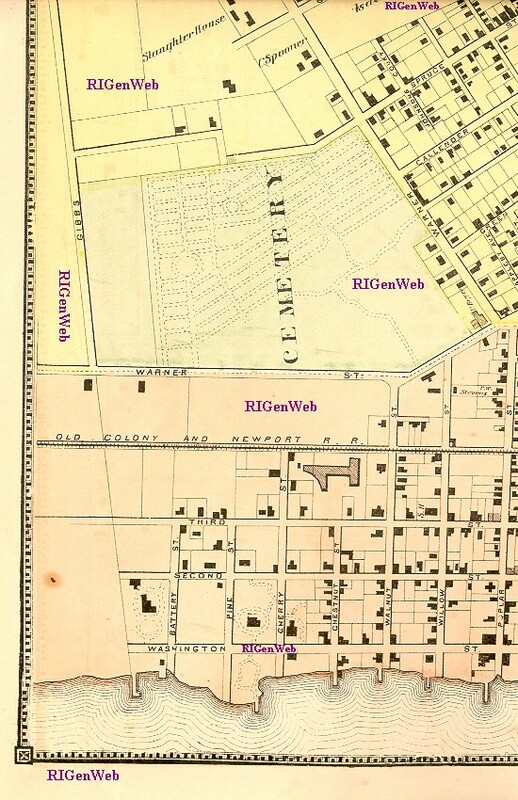 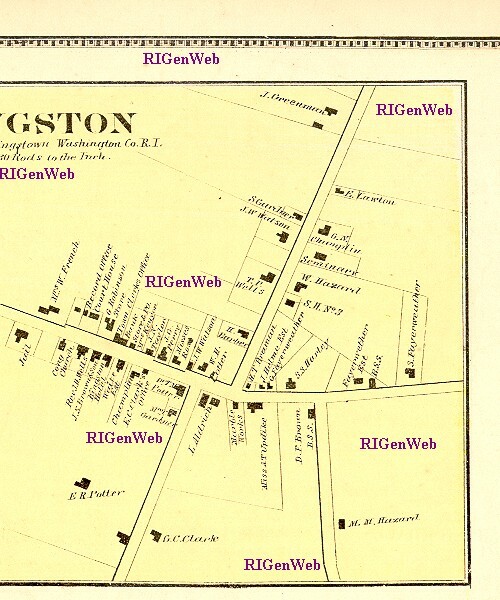 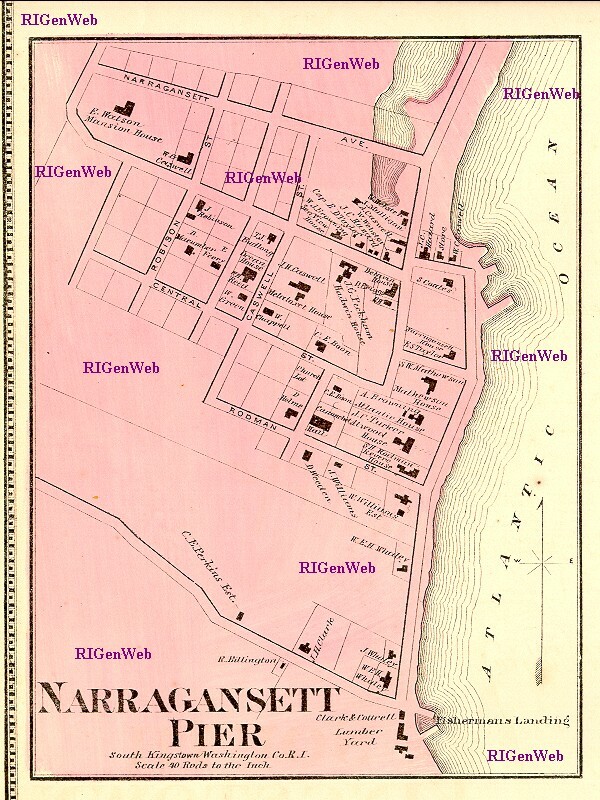 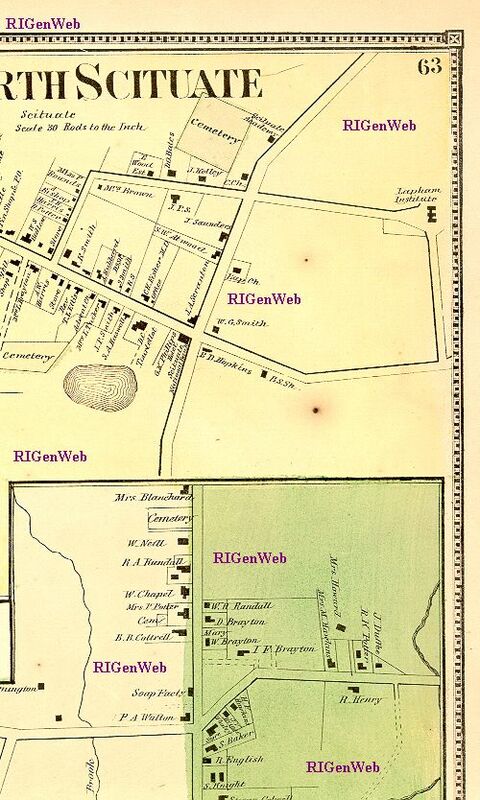 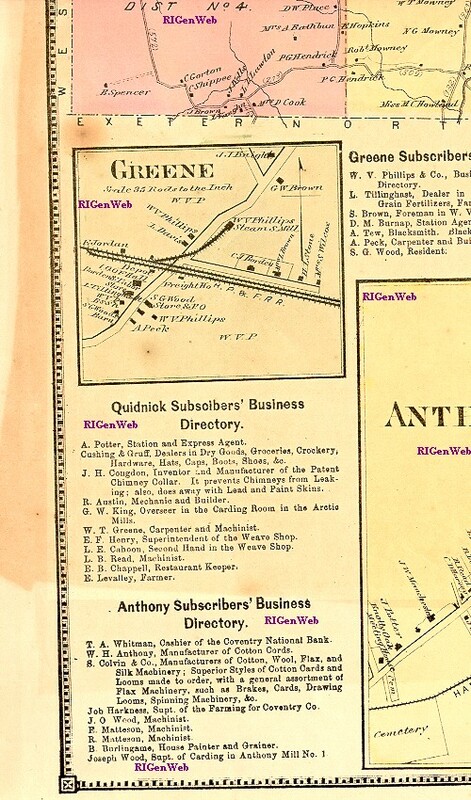 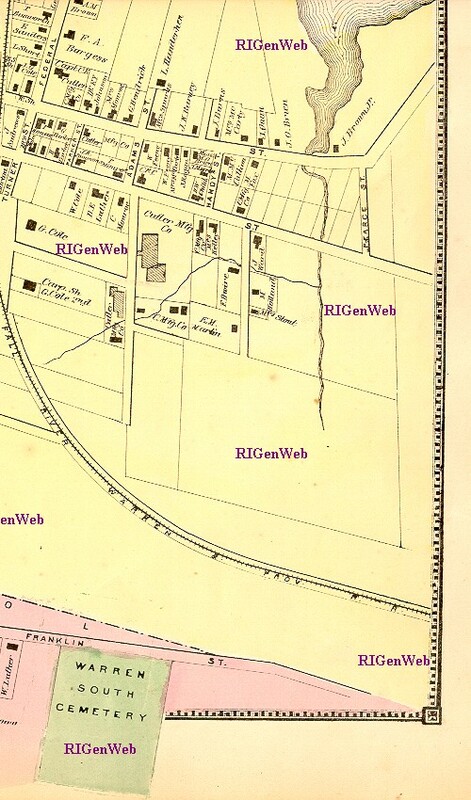 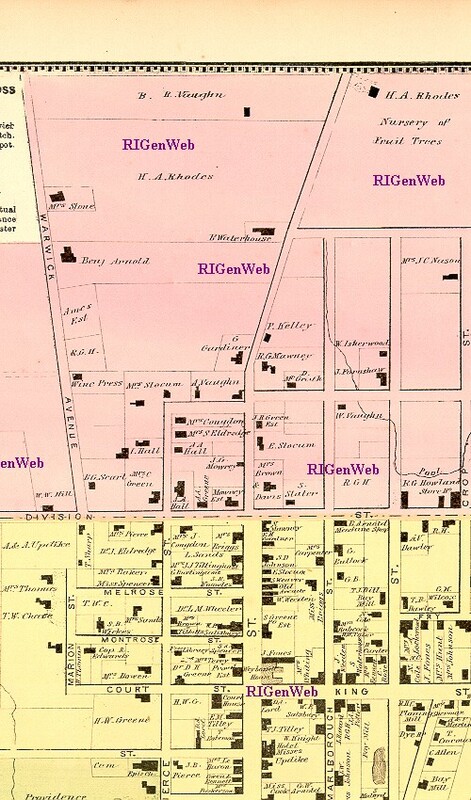 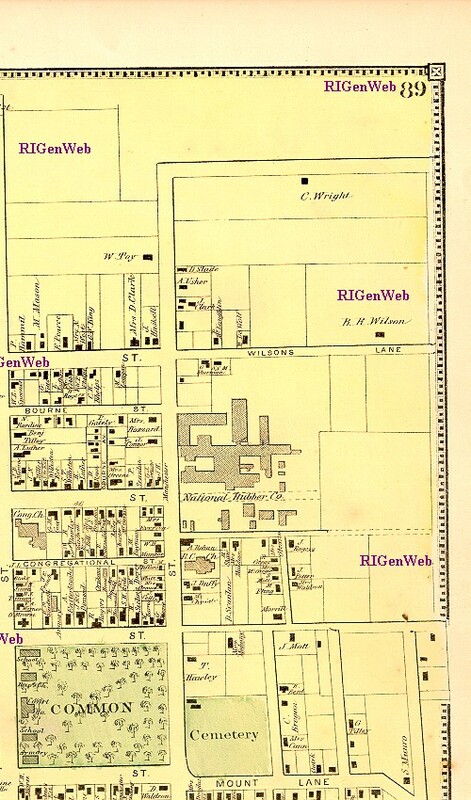 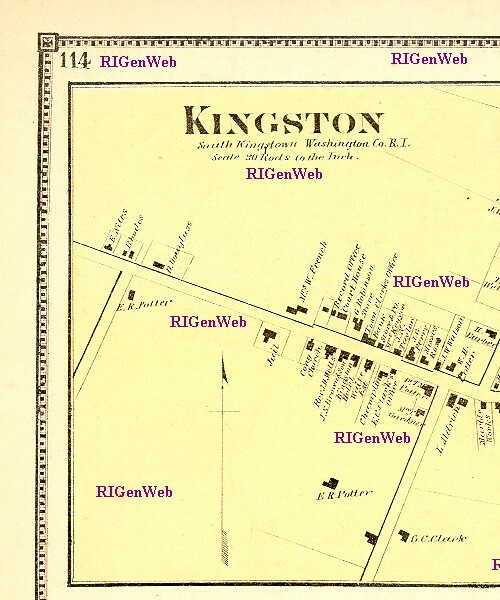 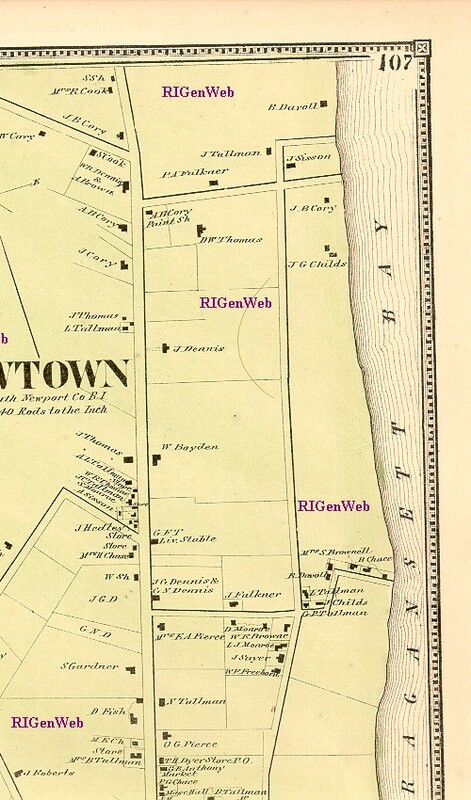 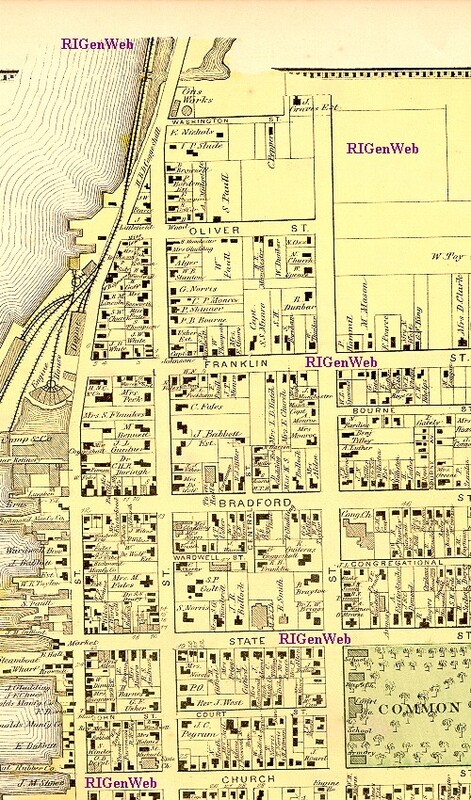 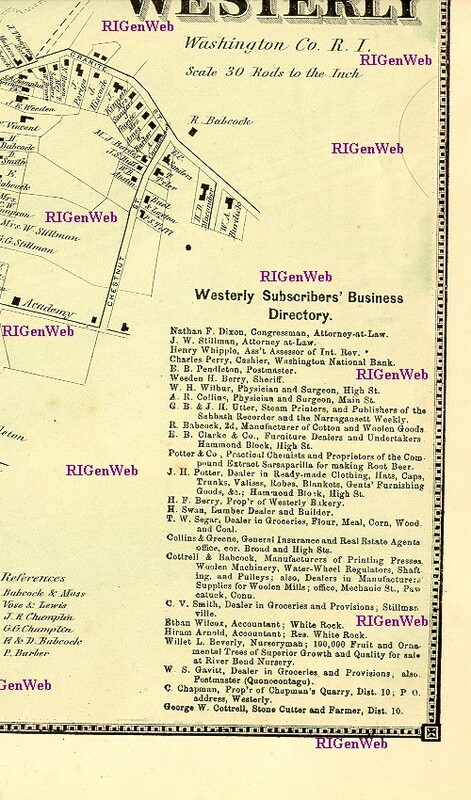 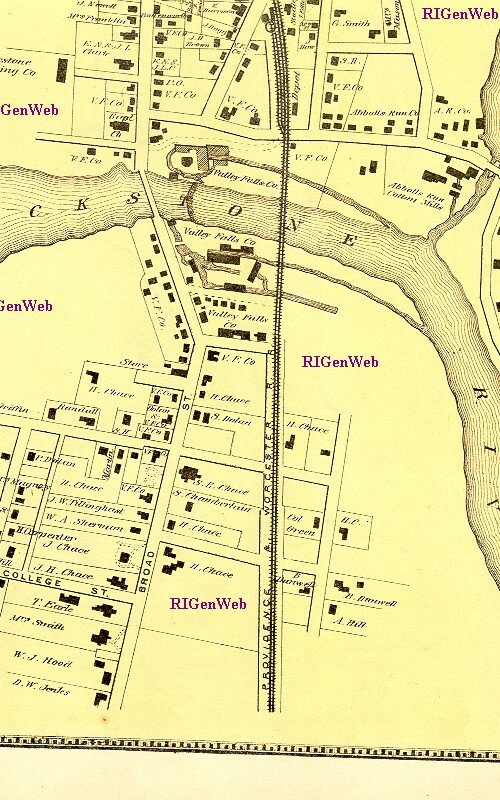 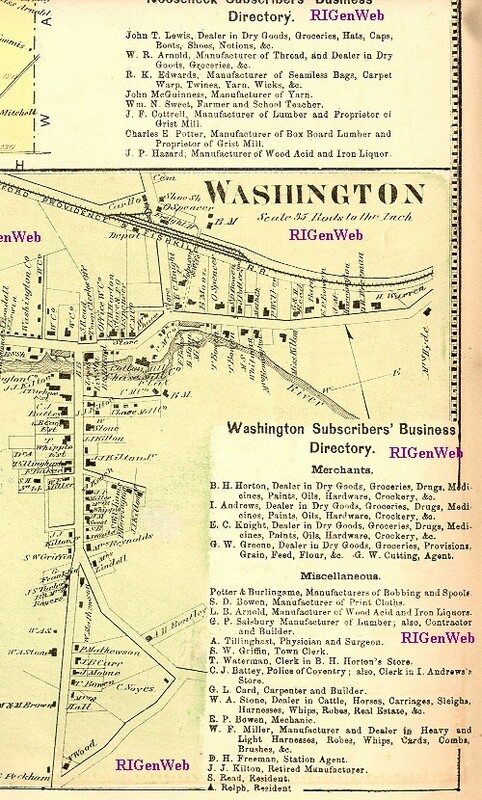 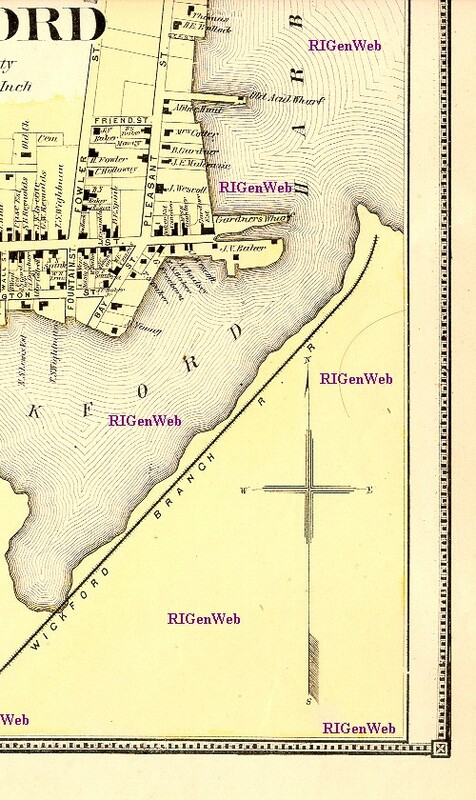 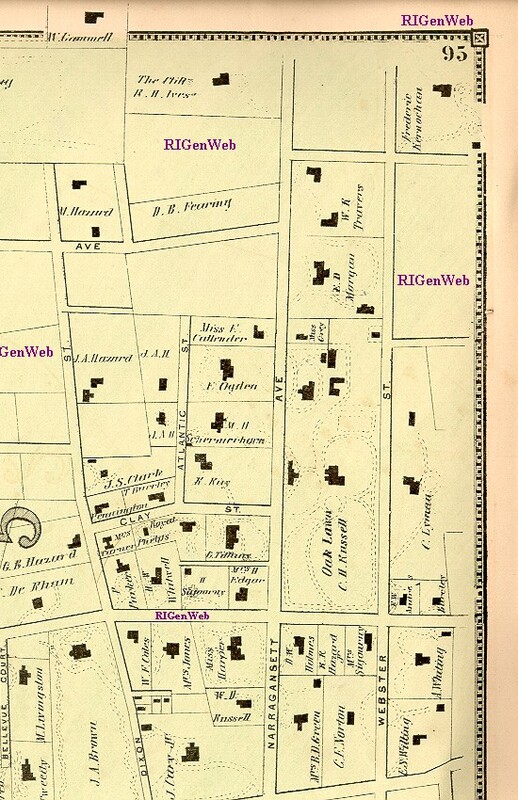 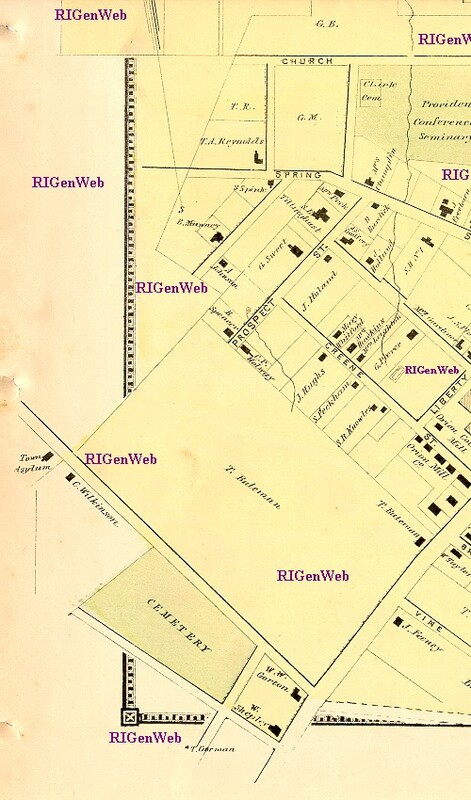 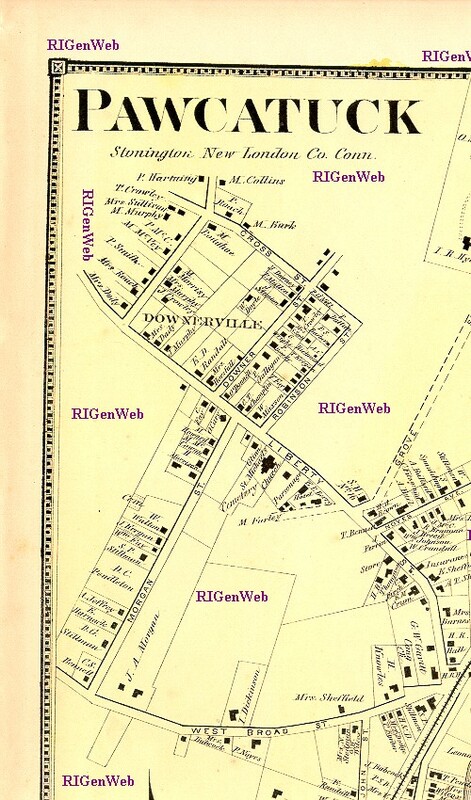 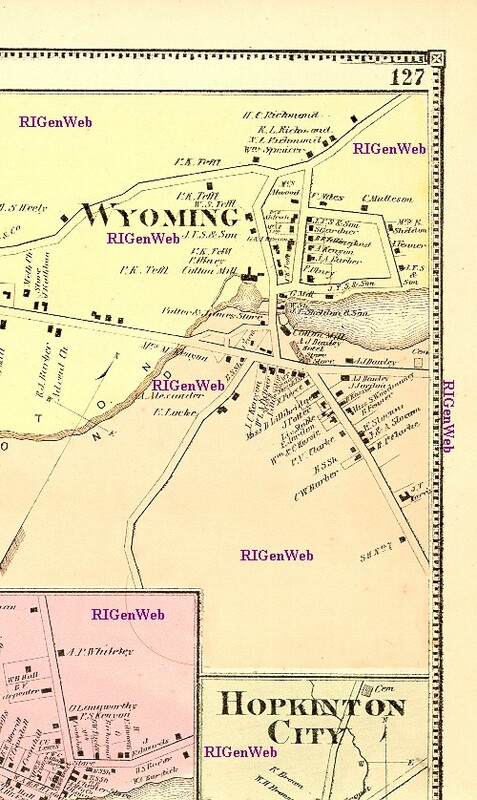 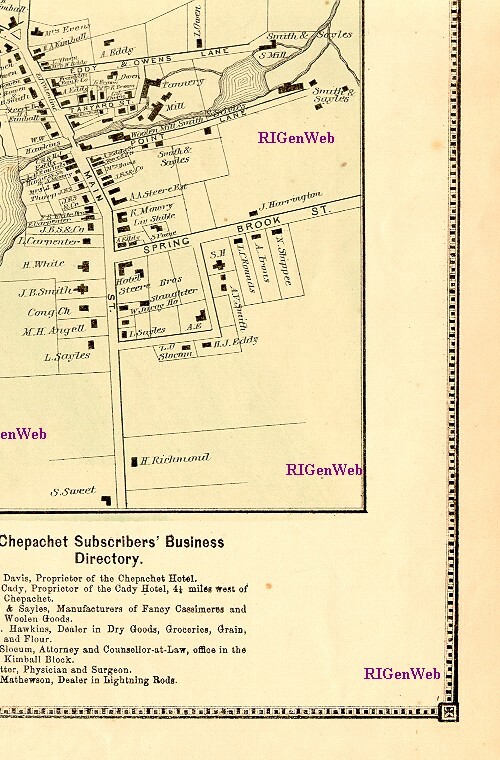 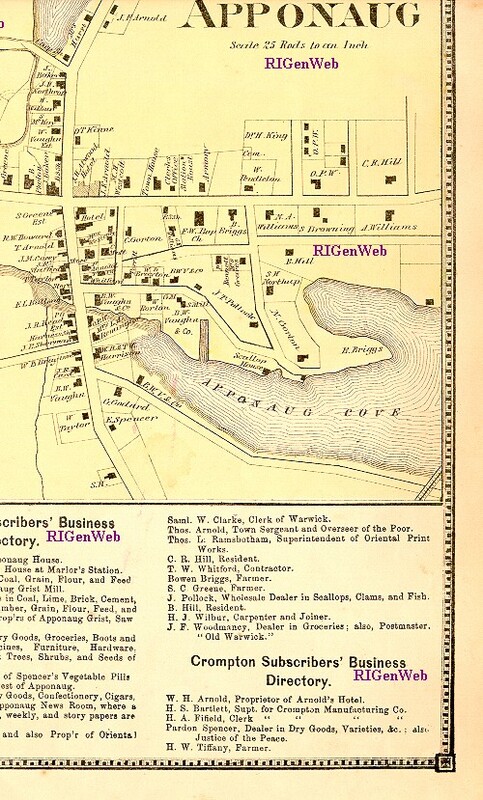 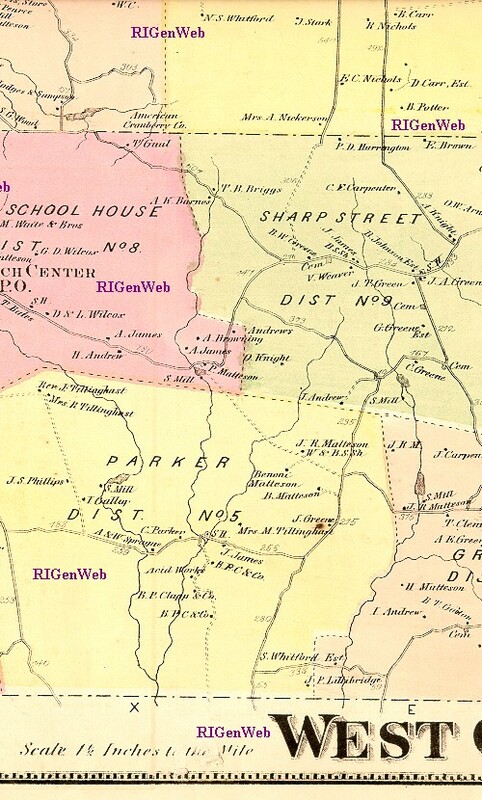 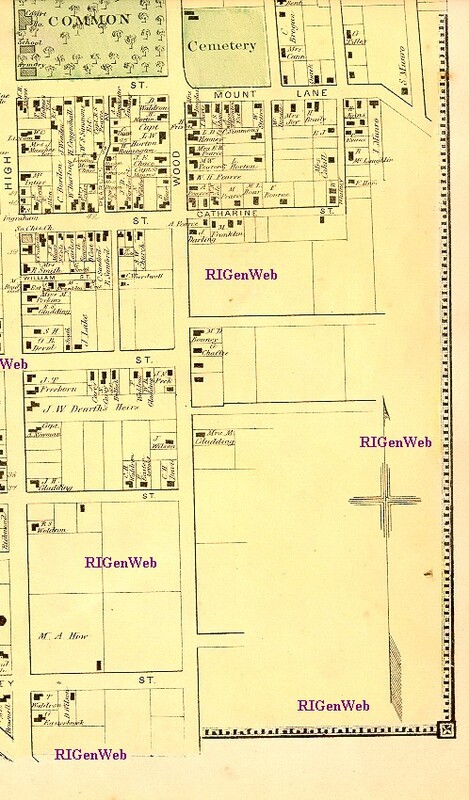 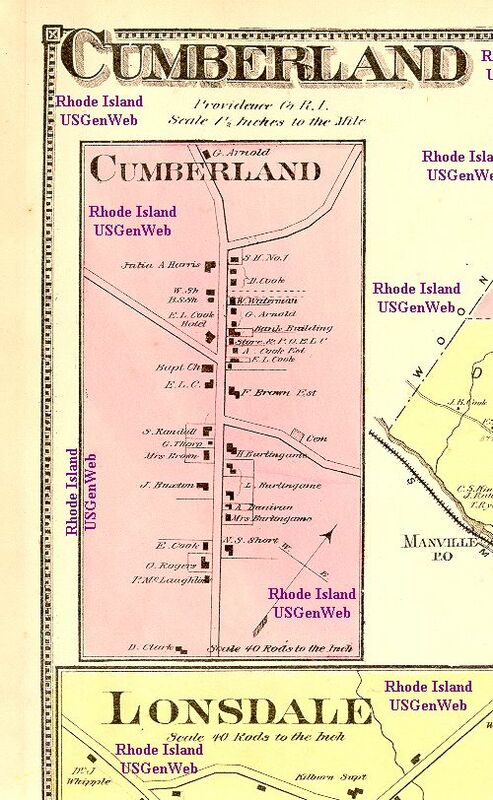 This map is next to page 55 in Centennial History of Moses Brown School, 1819-1919, by Rayner Wickersham Kelsey, published by the Moses Brown School, Providence, Rhode Island, 1919. 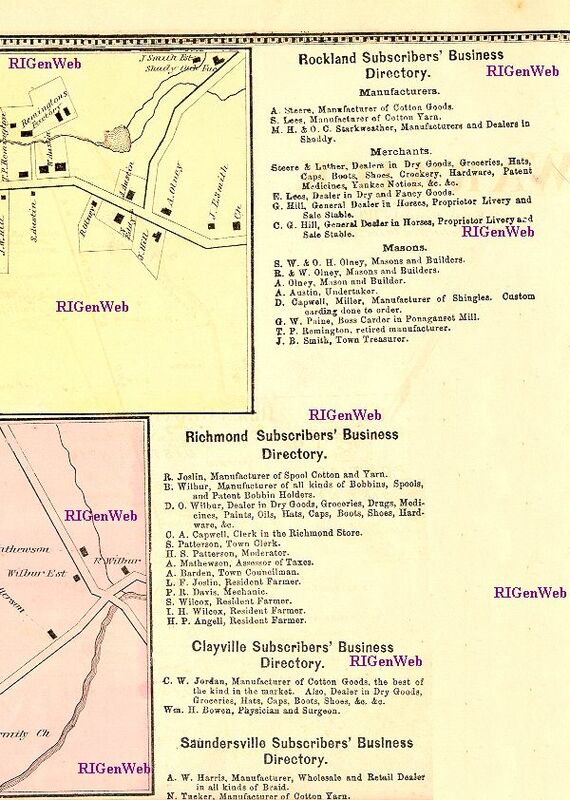 The locations of Weekly, Monthly and Quarterly Meetings are also shown. 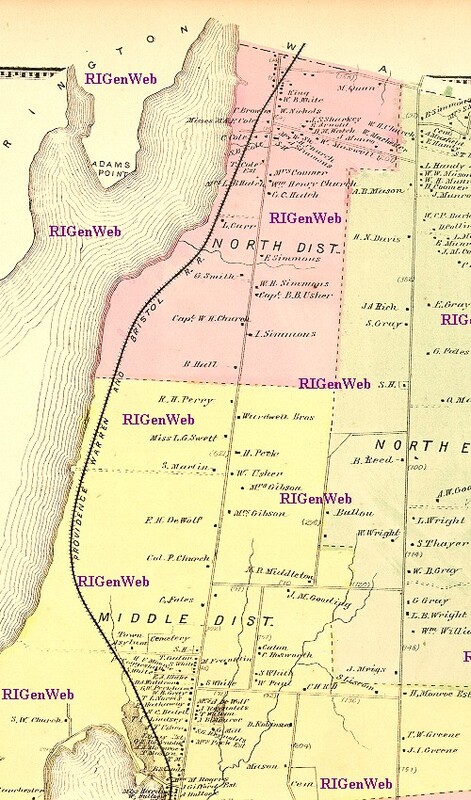 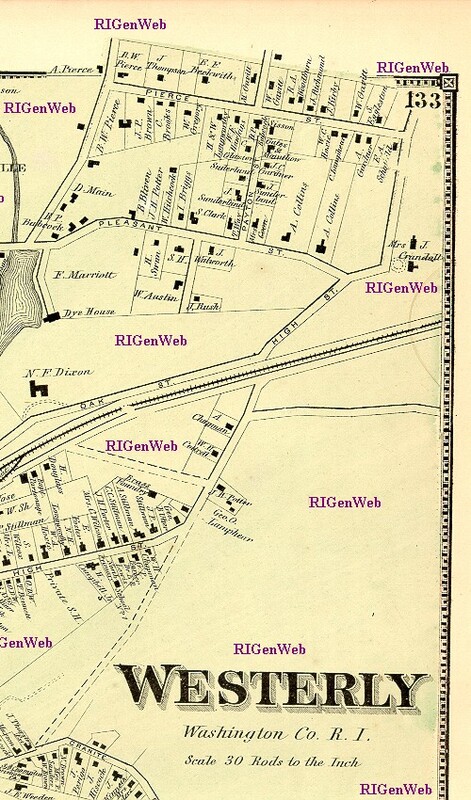 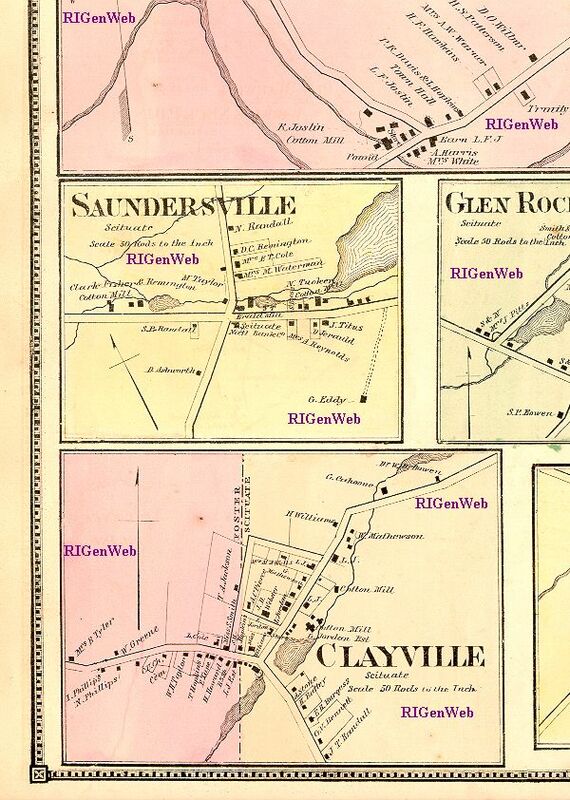 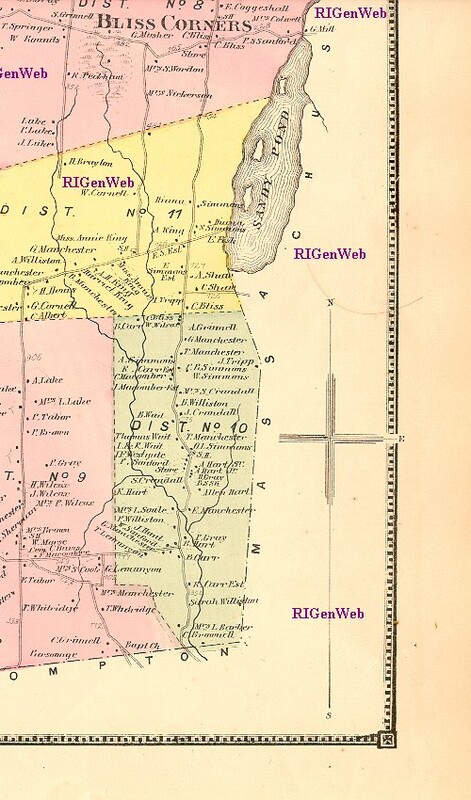 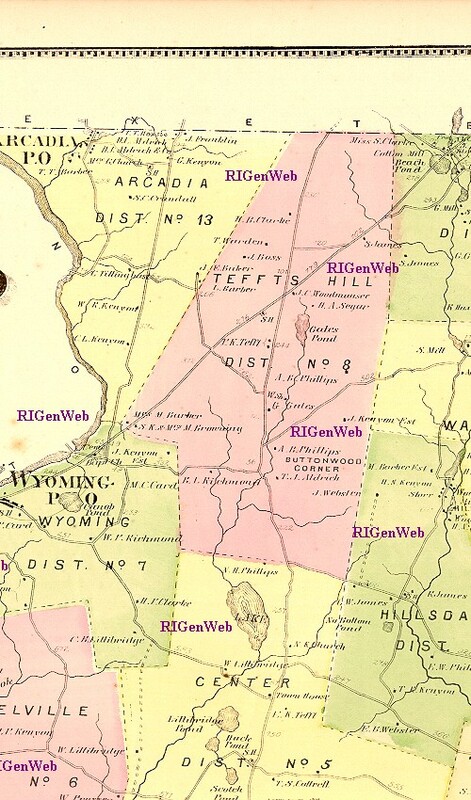 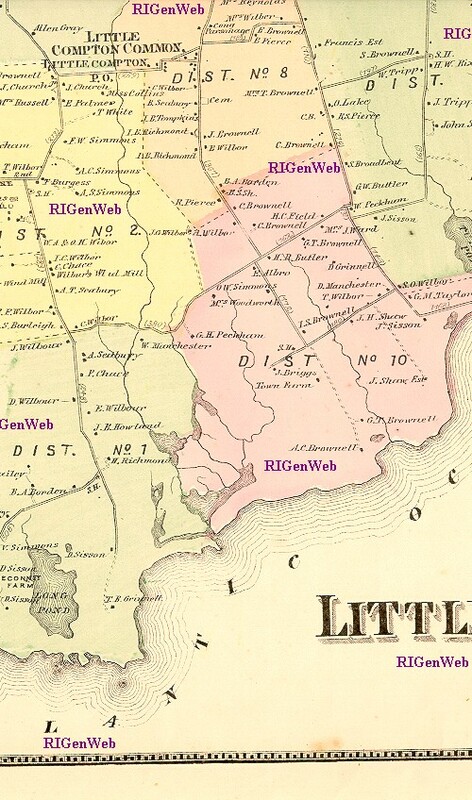 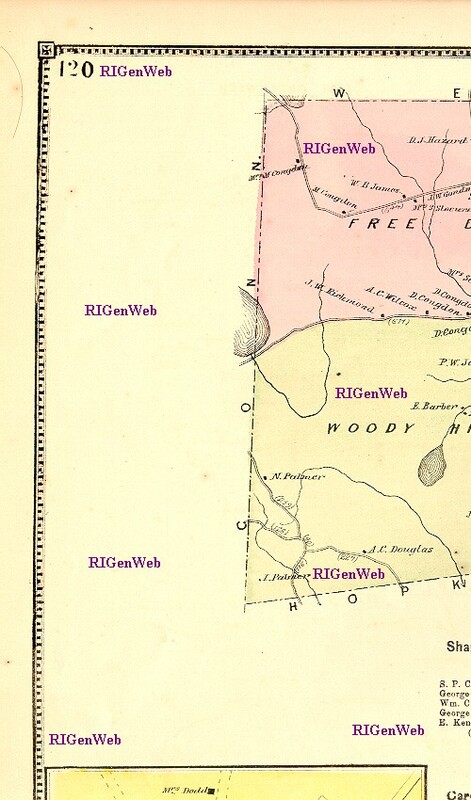 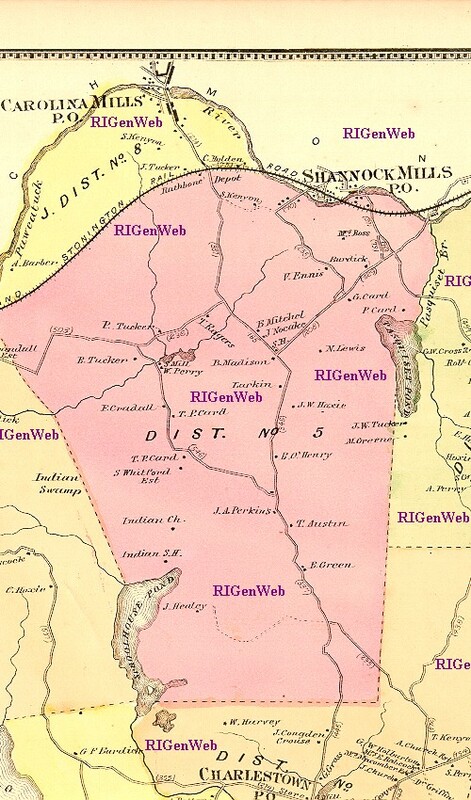 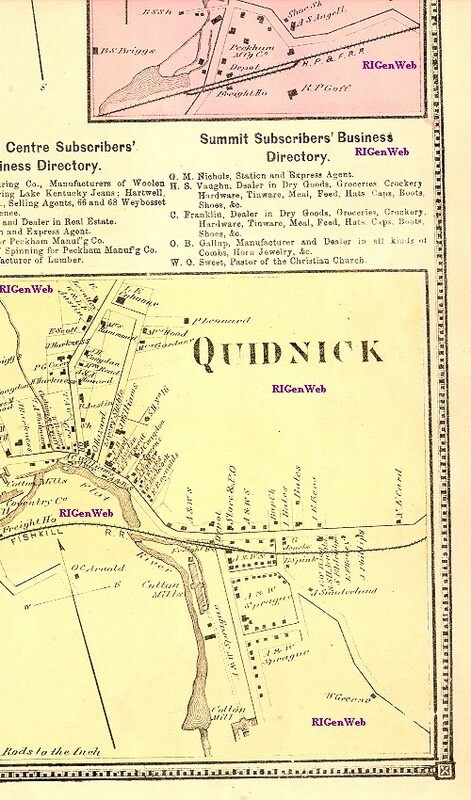 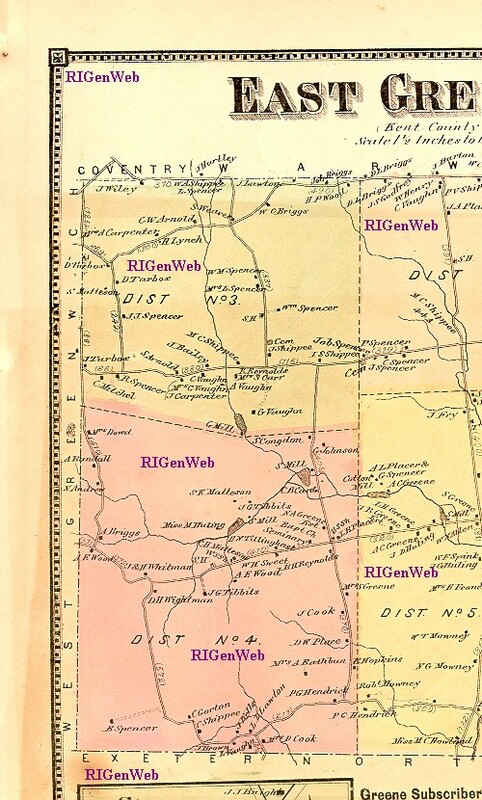 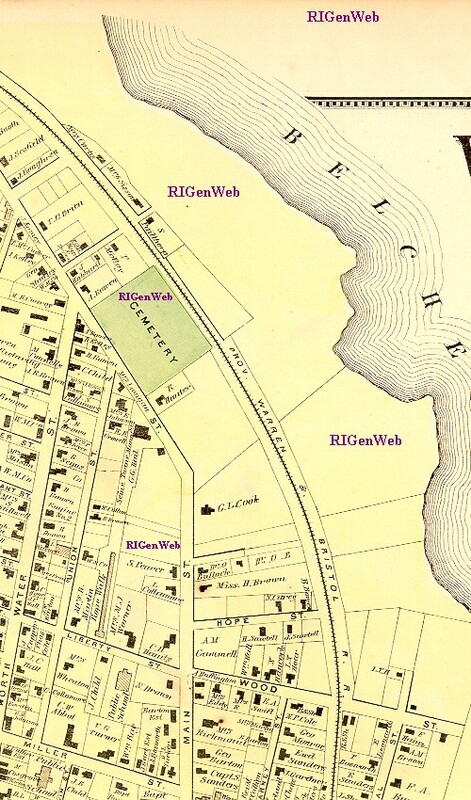 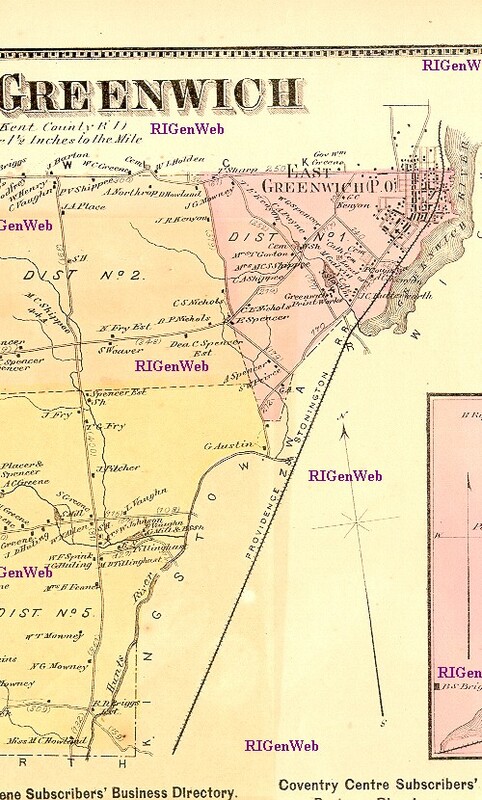 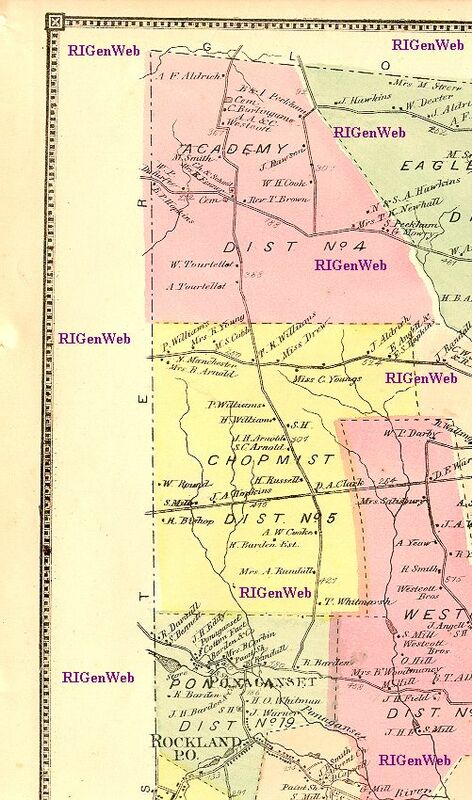 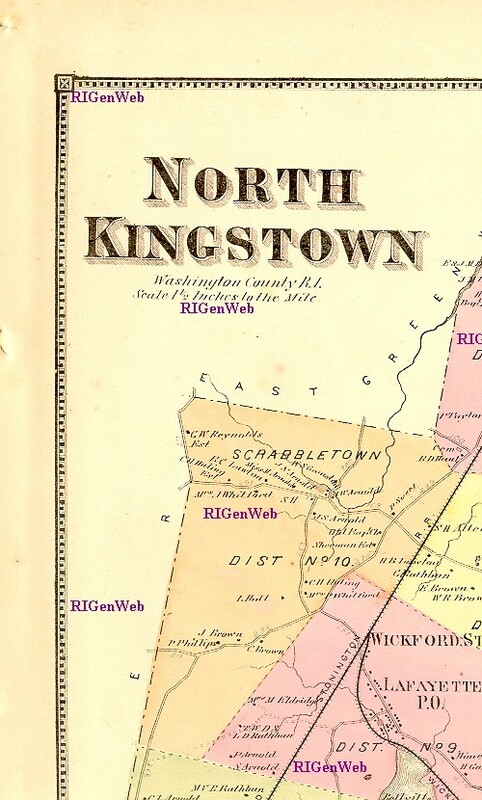 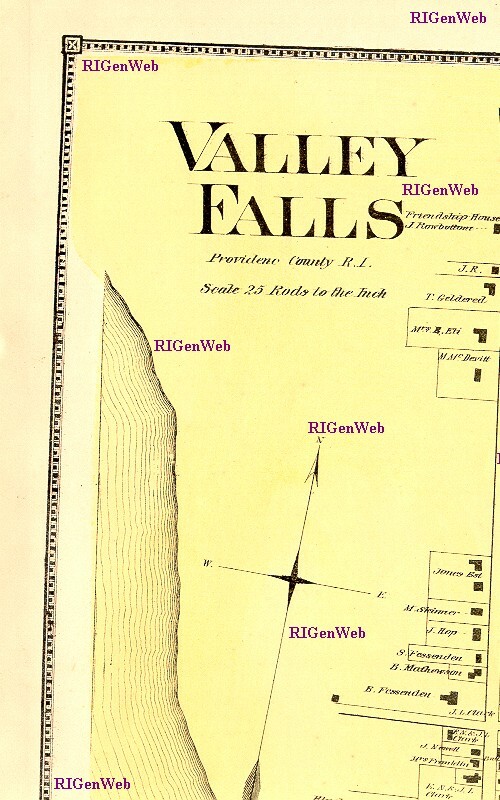 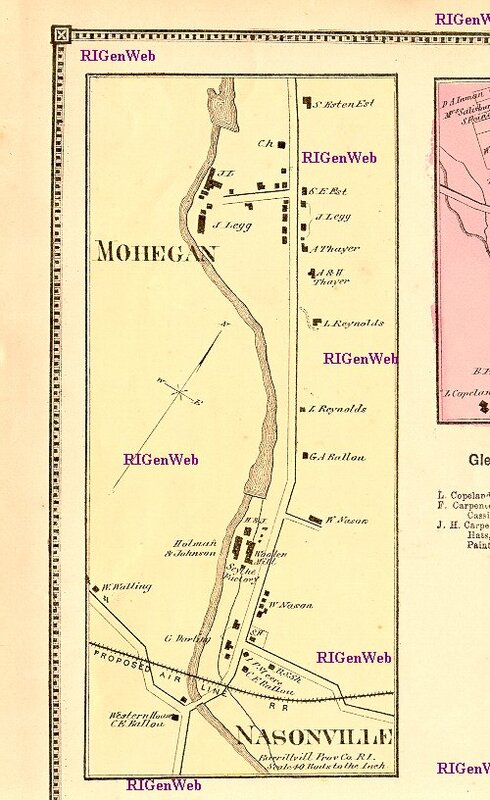 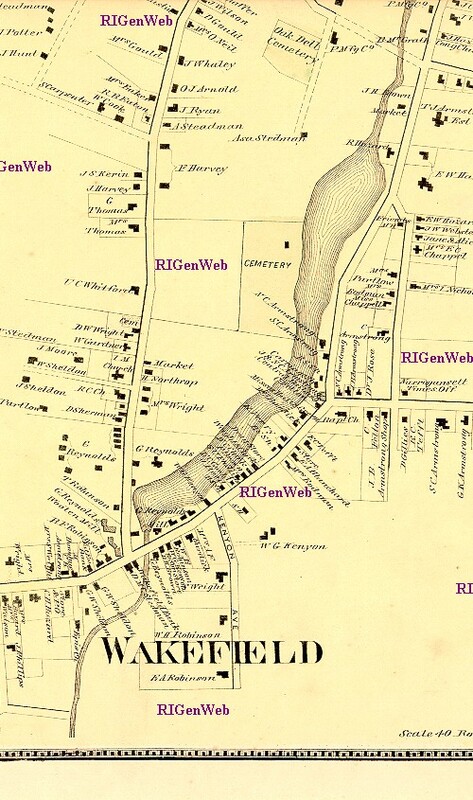 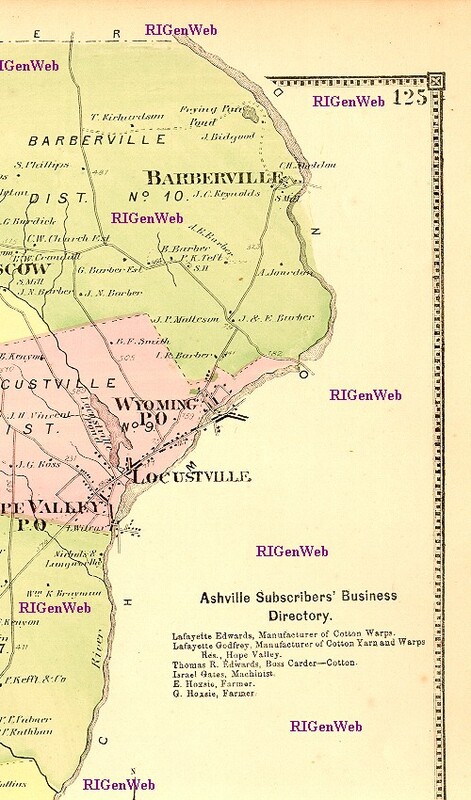 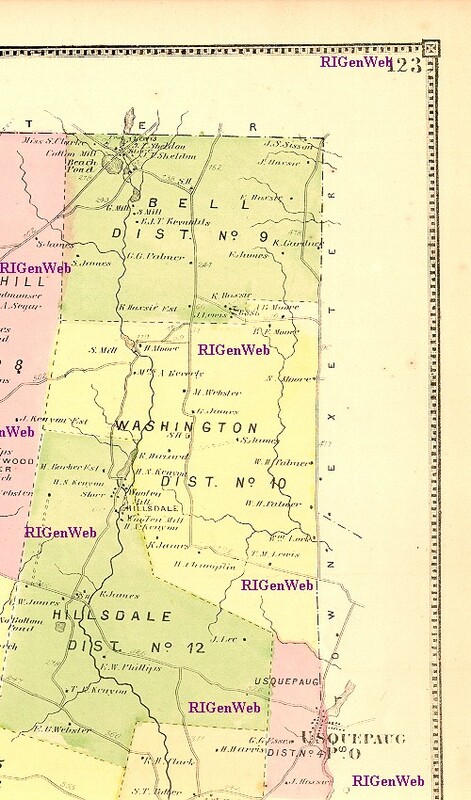 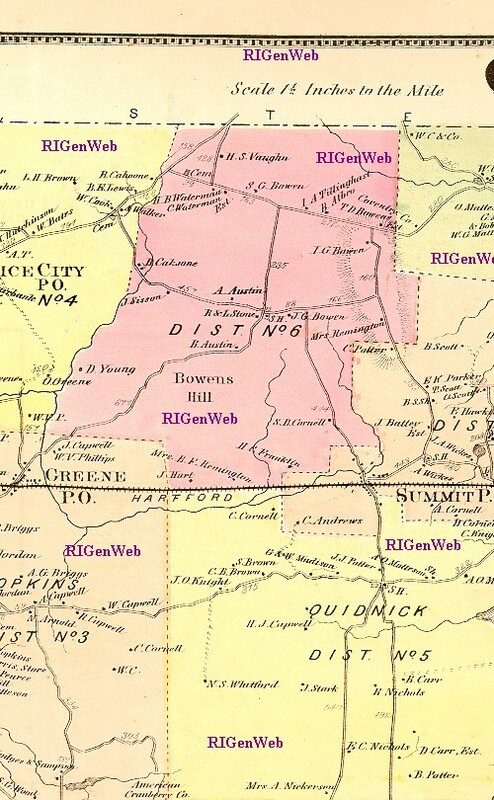 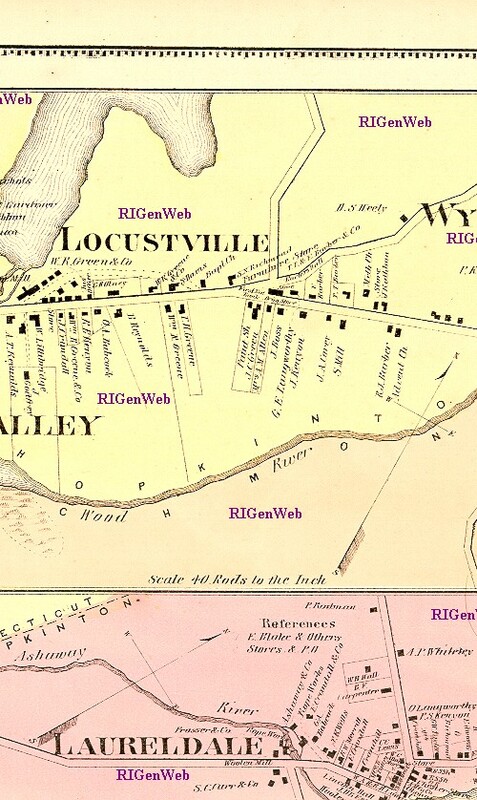 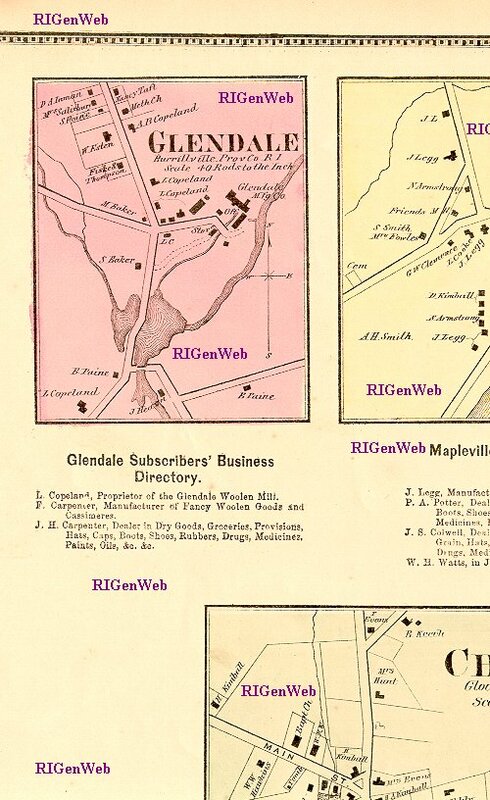 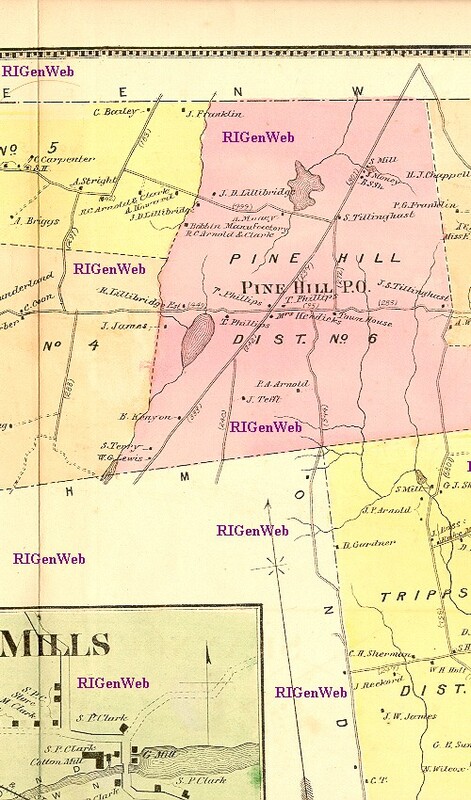 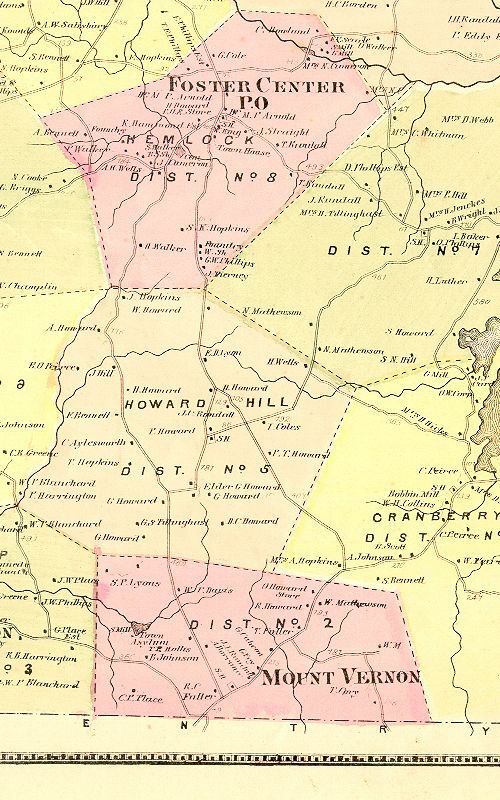 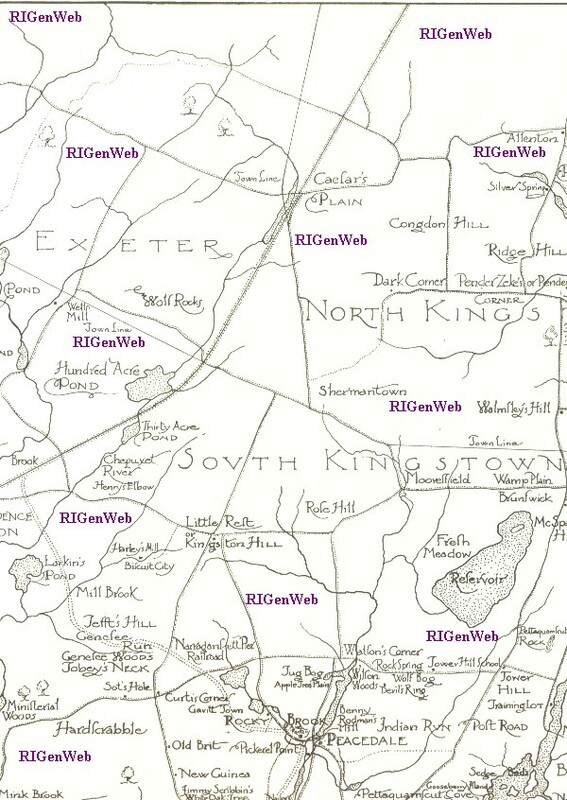 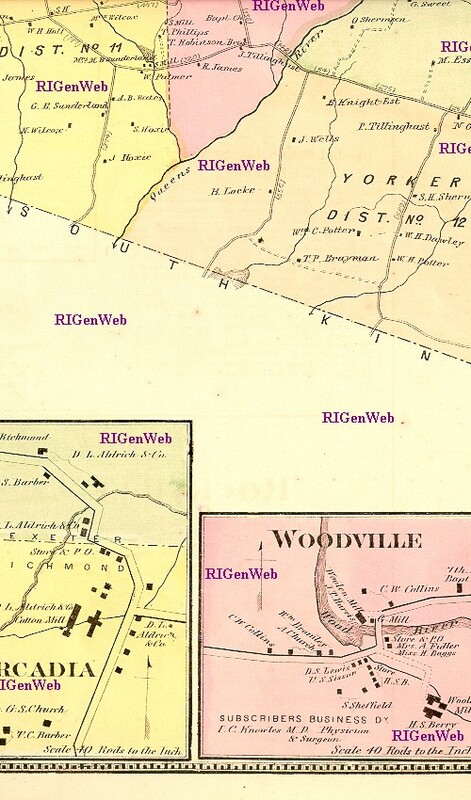 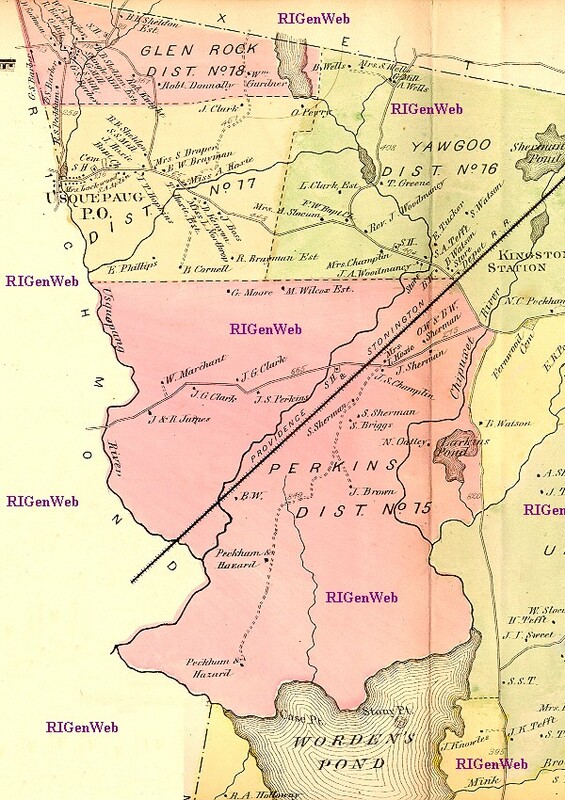 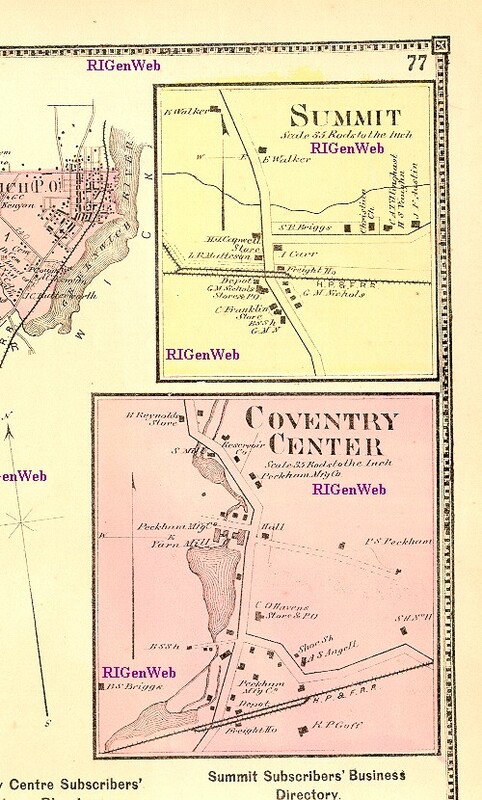 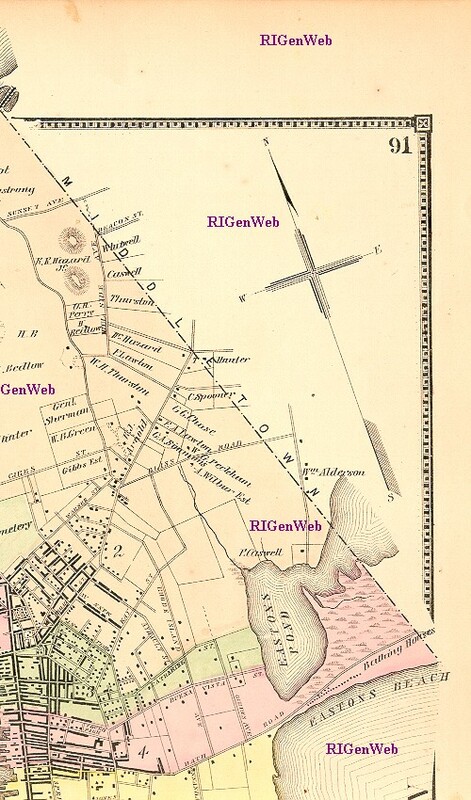 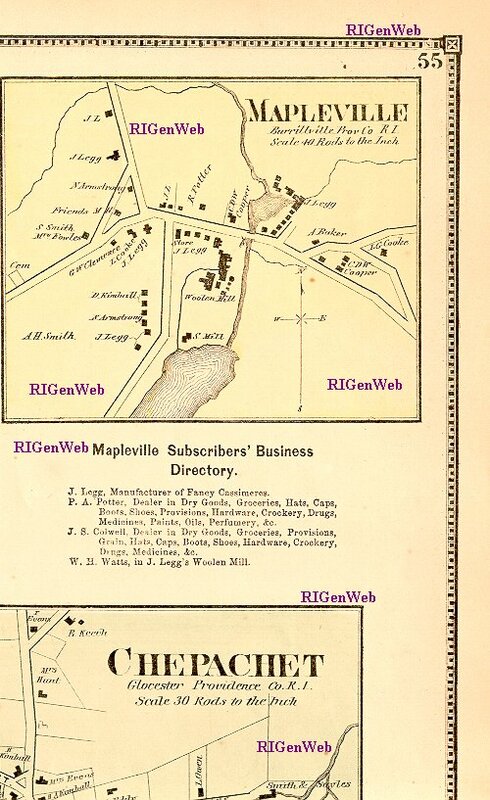 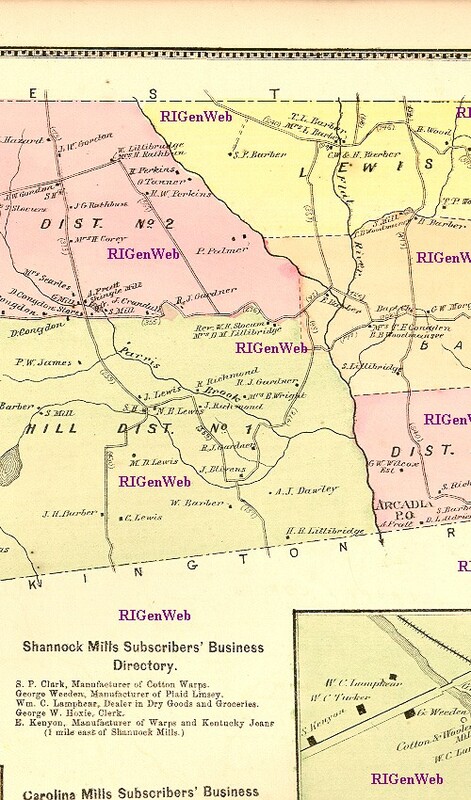 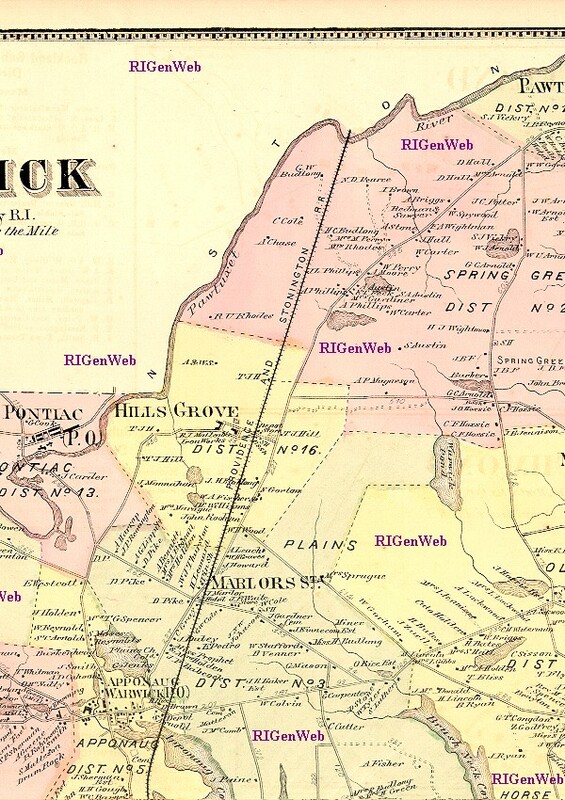 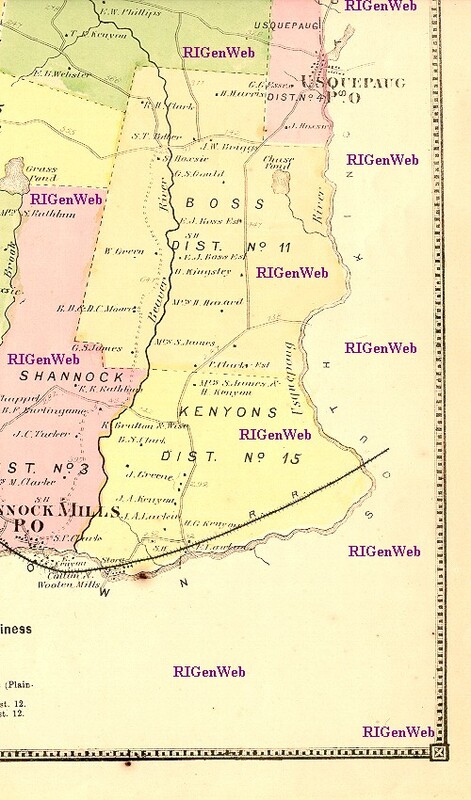 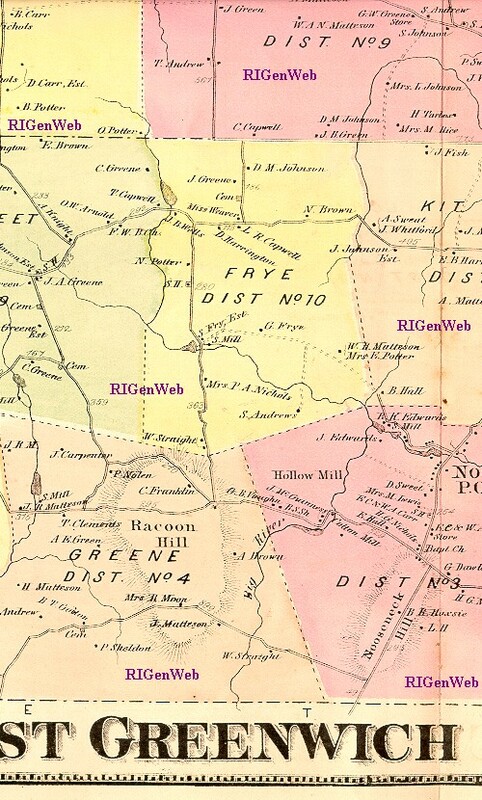 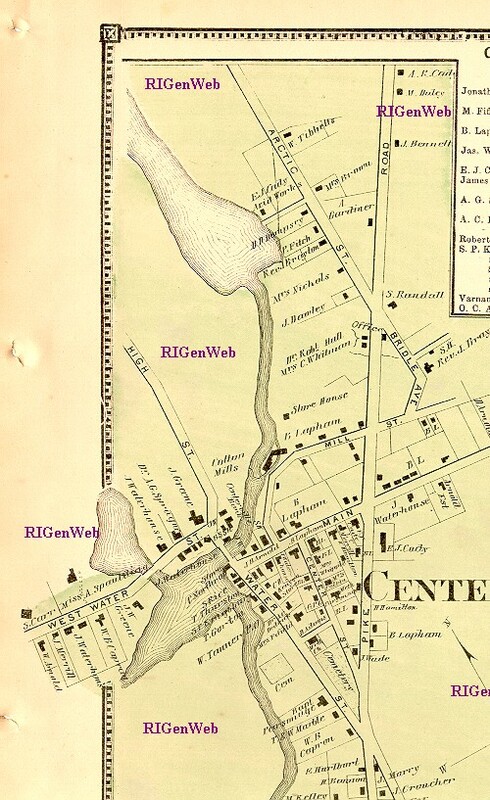 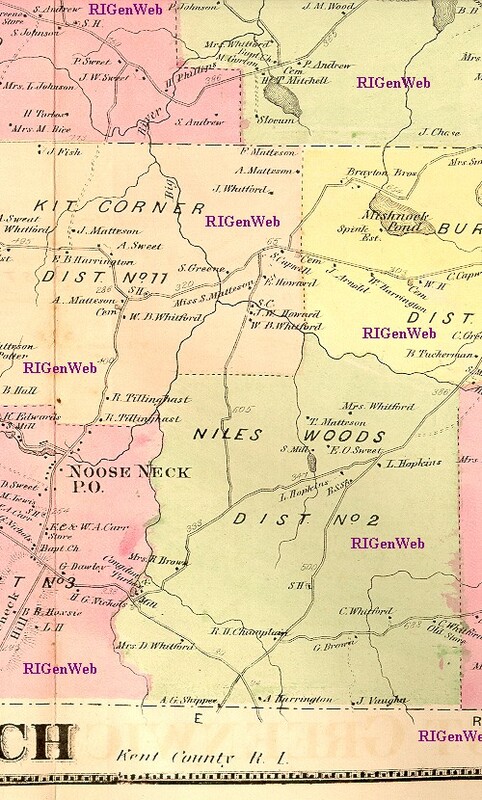 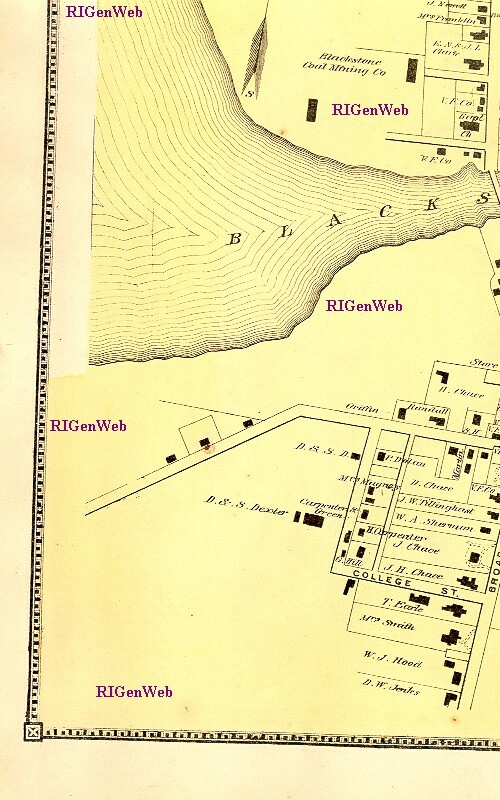 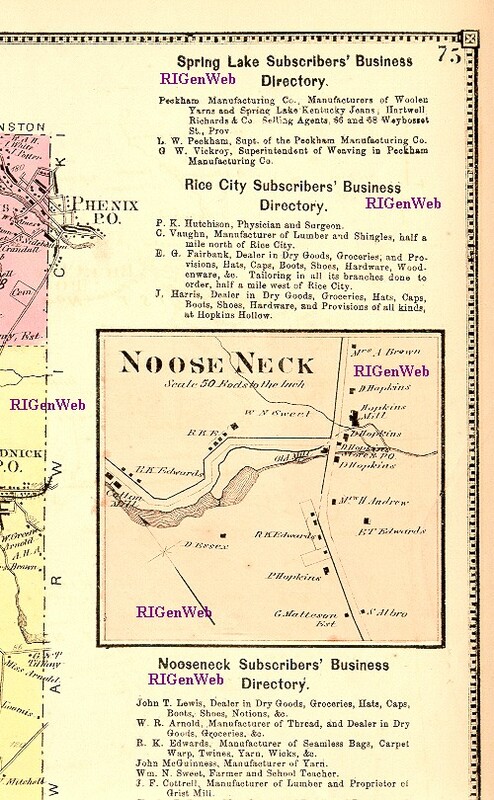 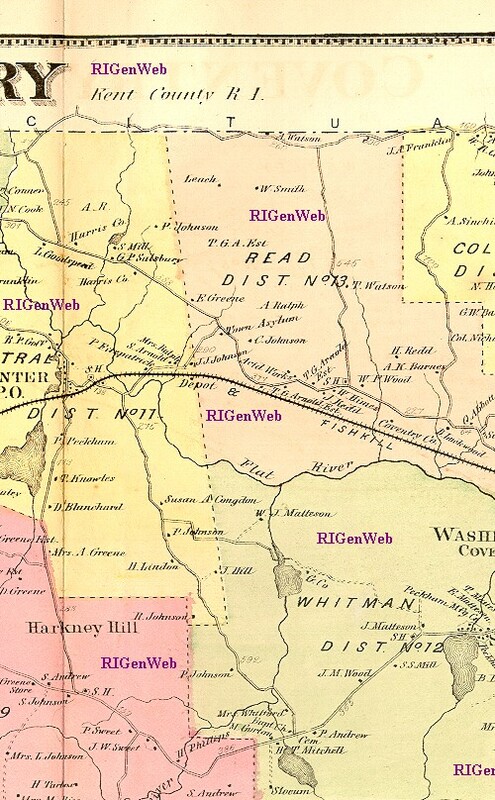 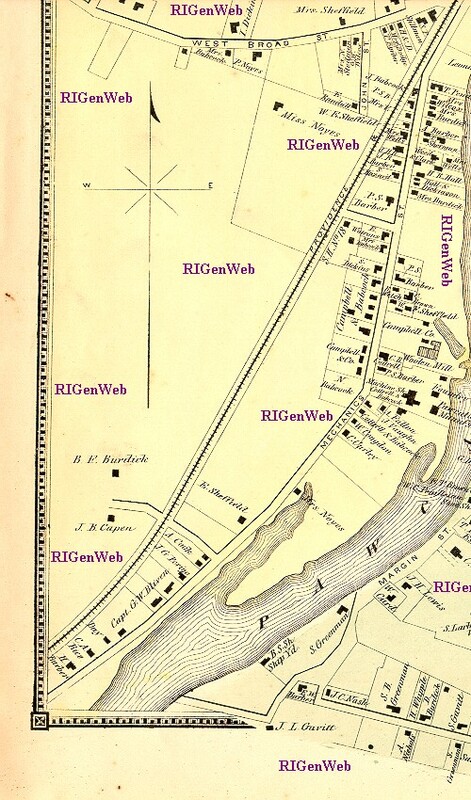 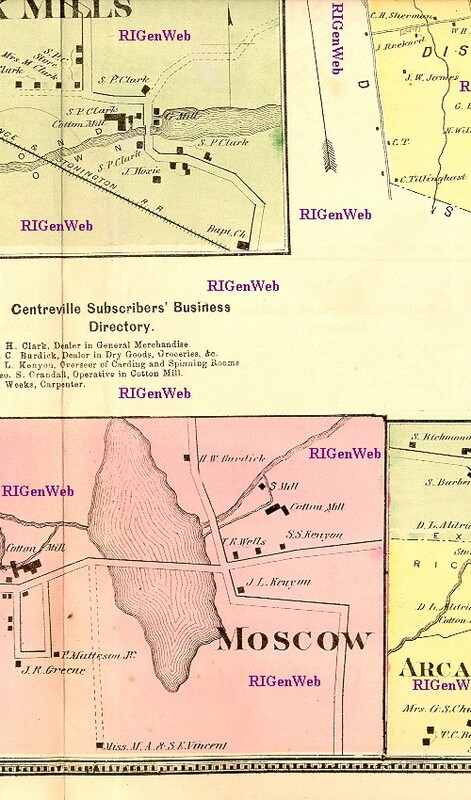 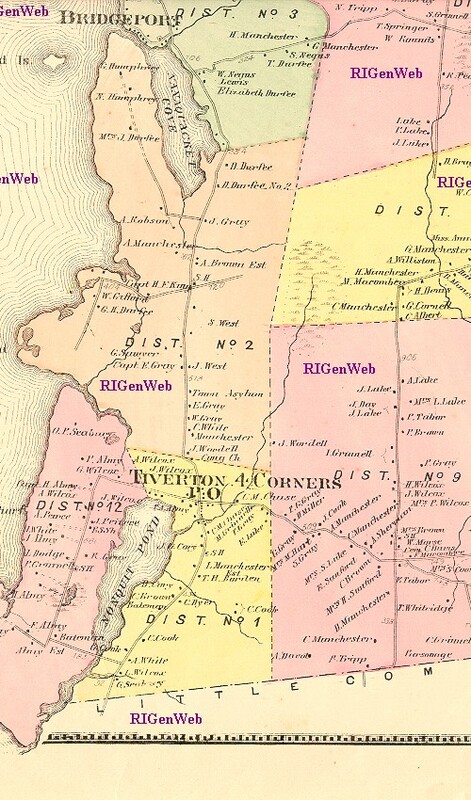 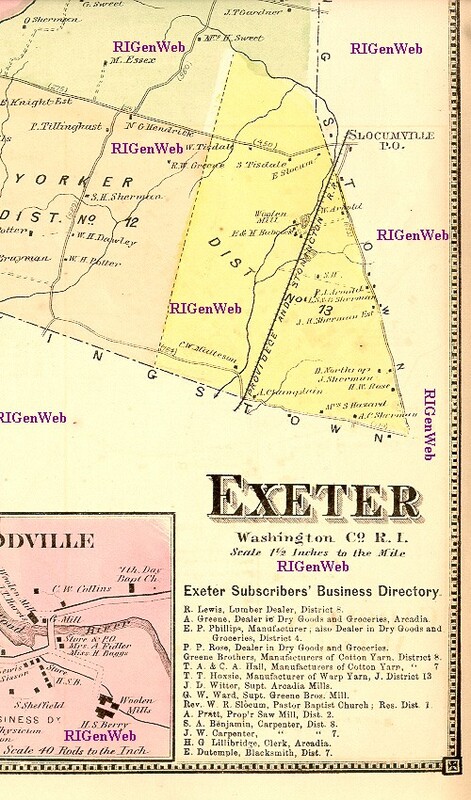 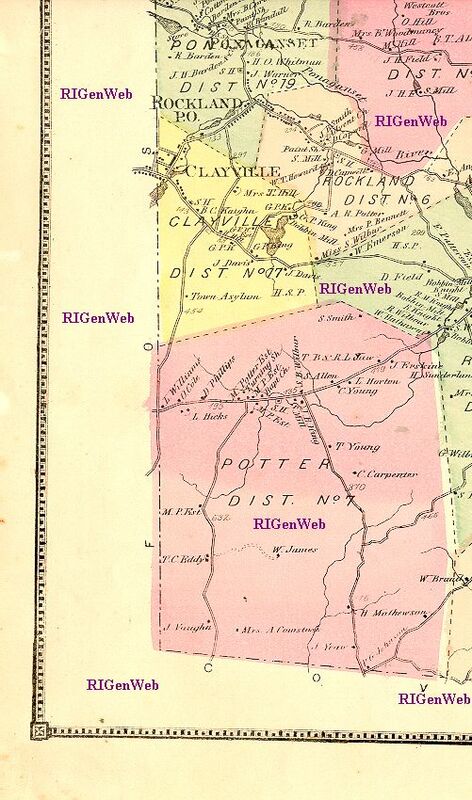 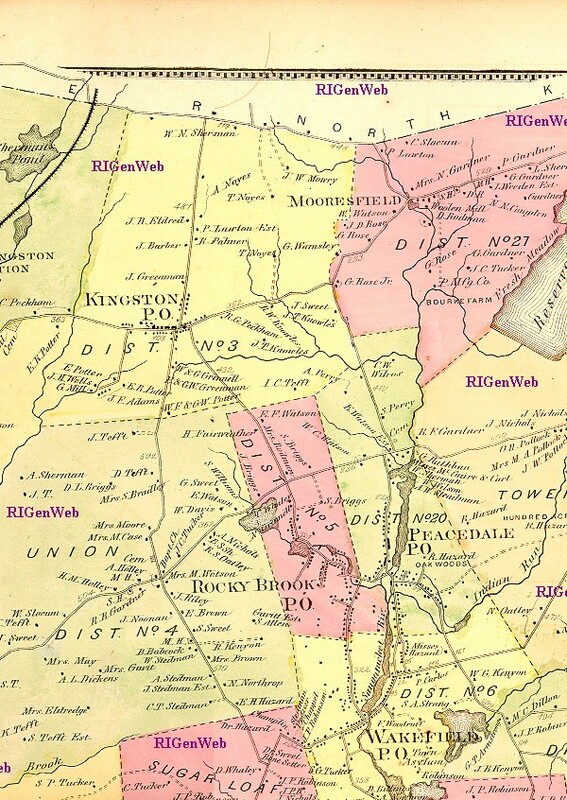 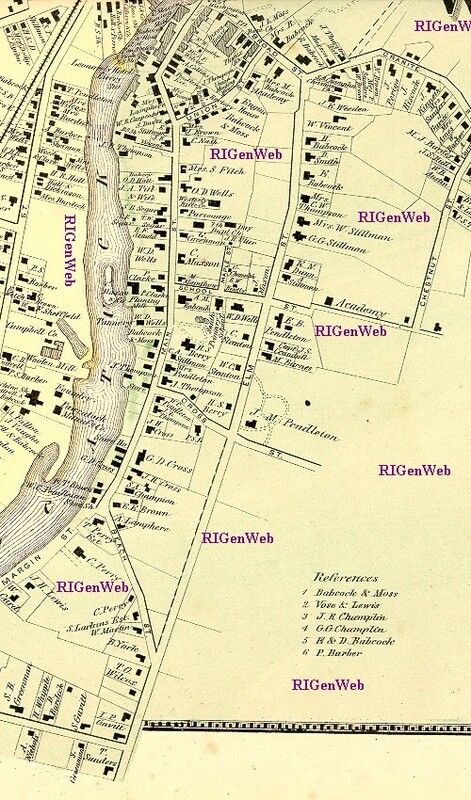 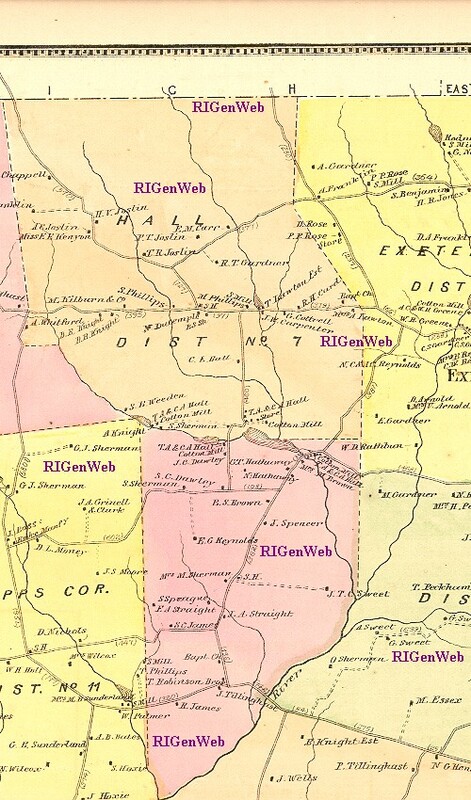 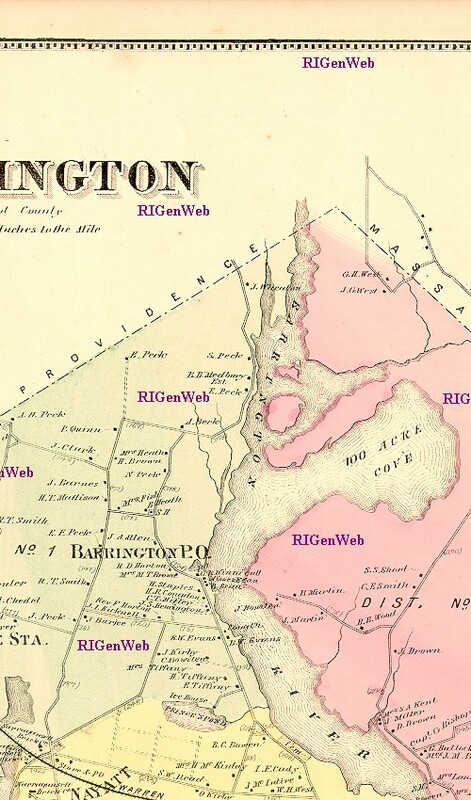 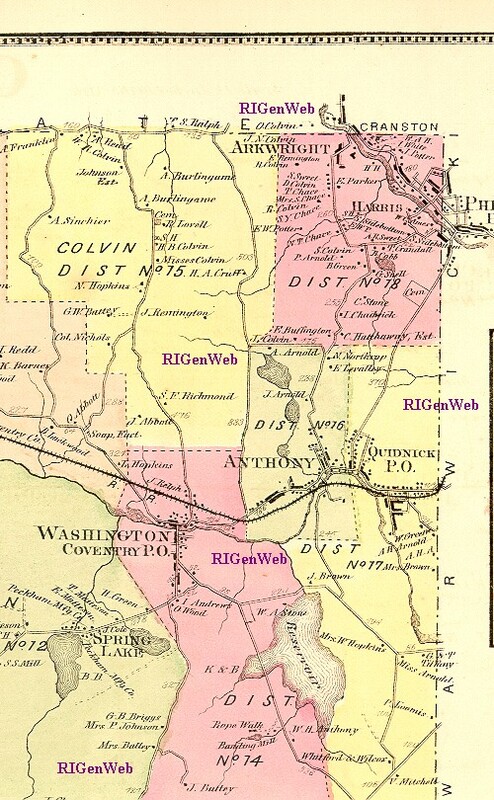 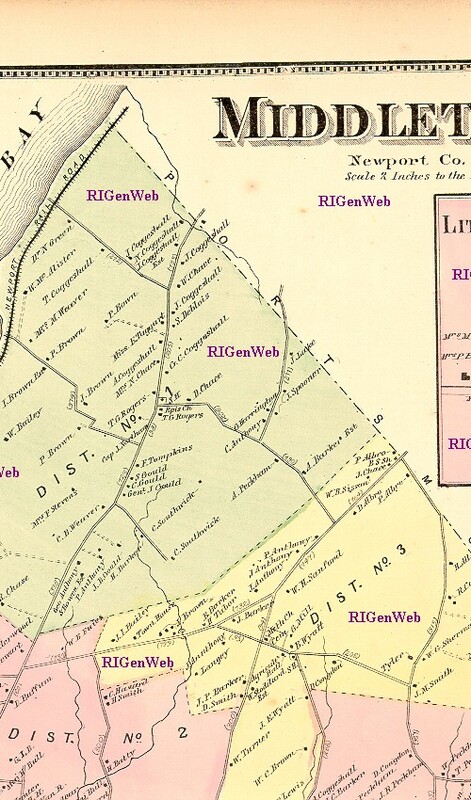 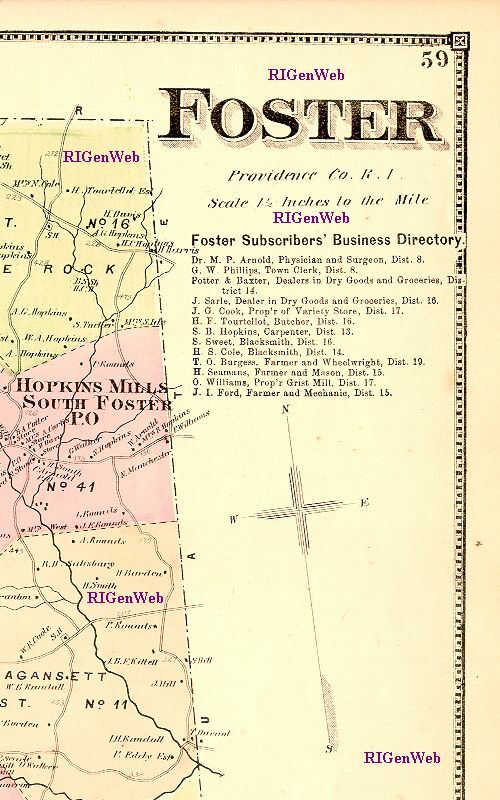 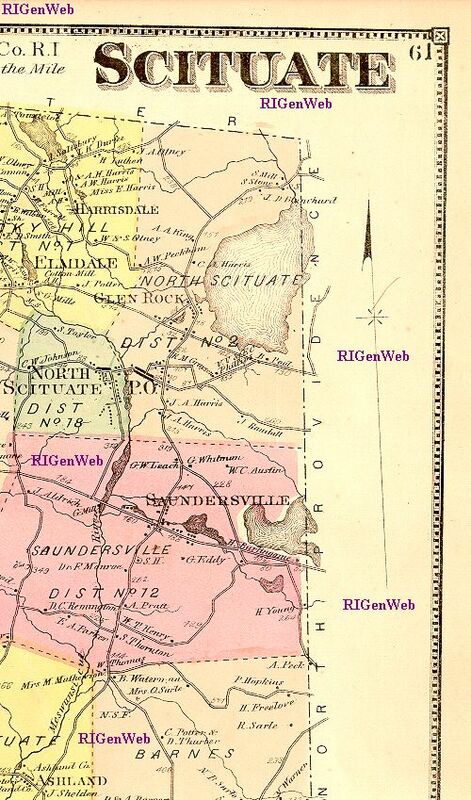 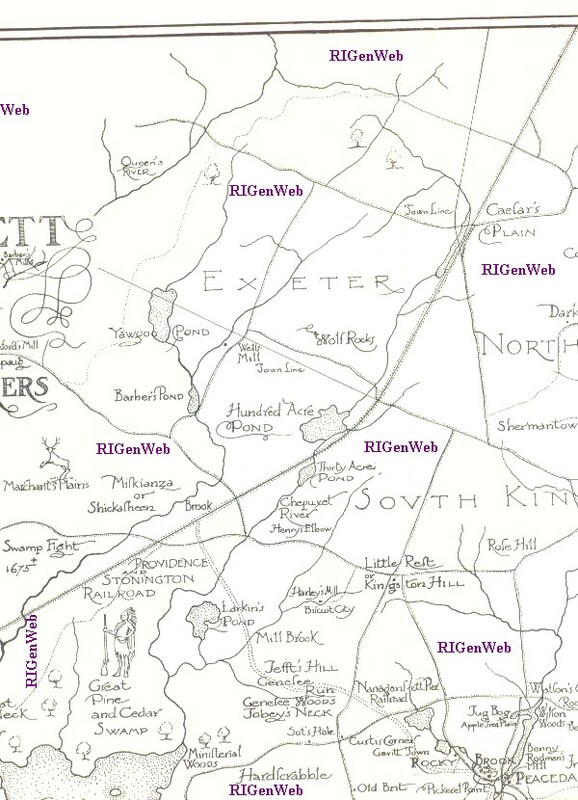 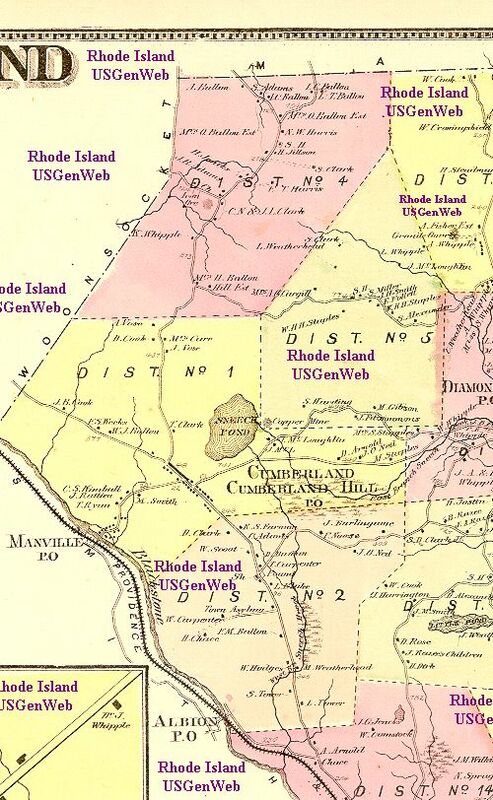 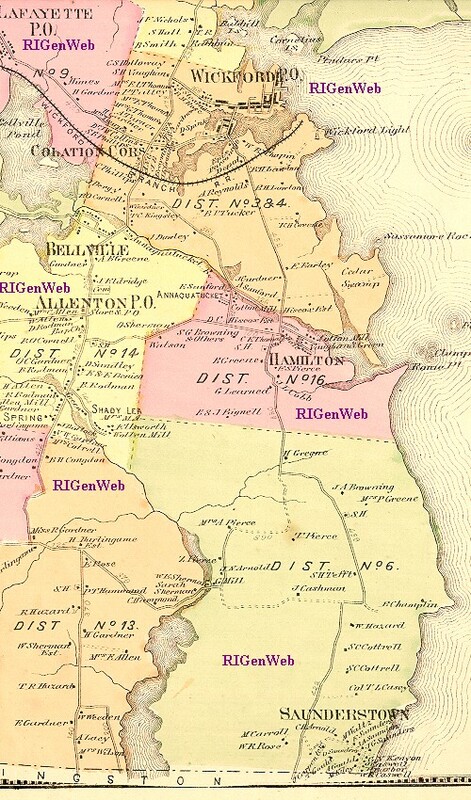 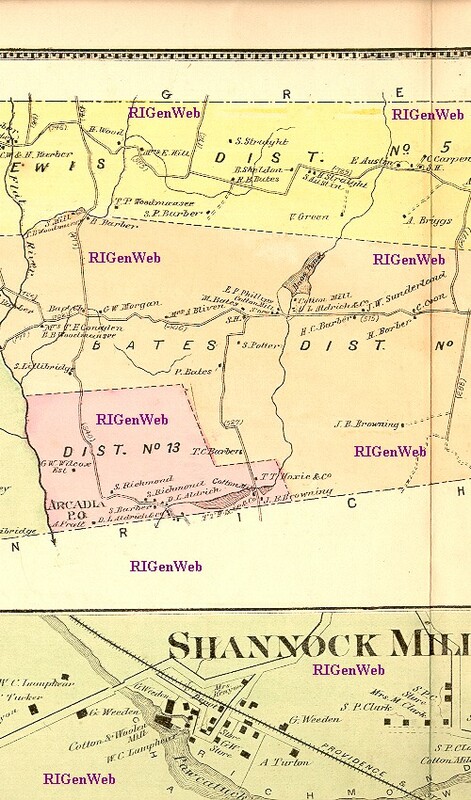 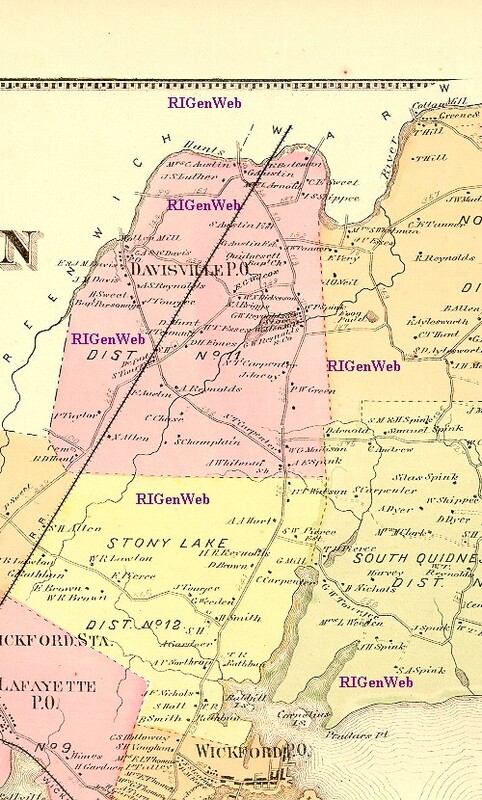 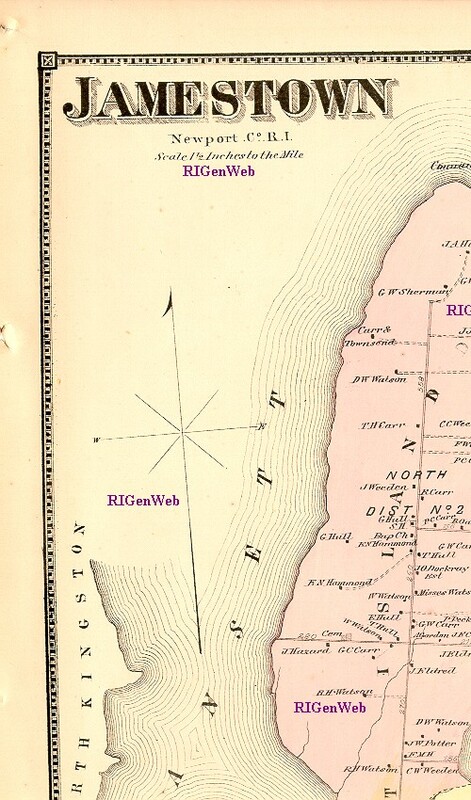 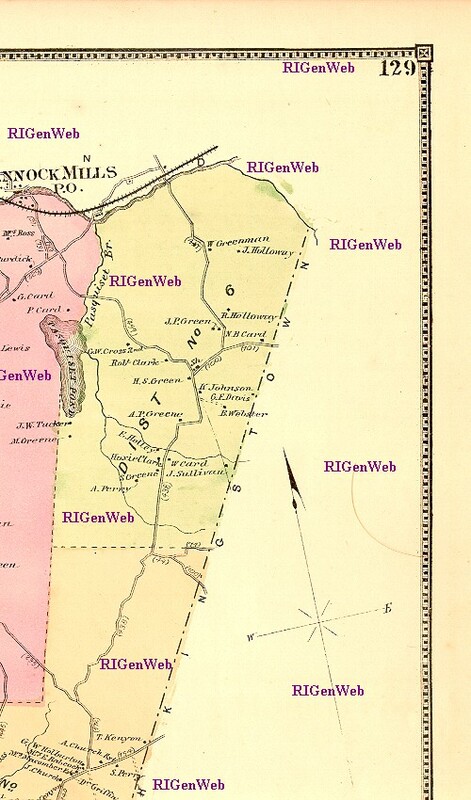 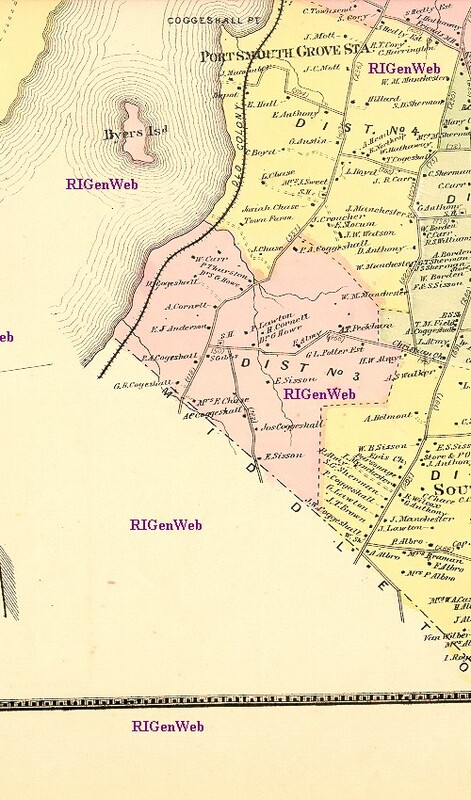 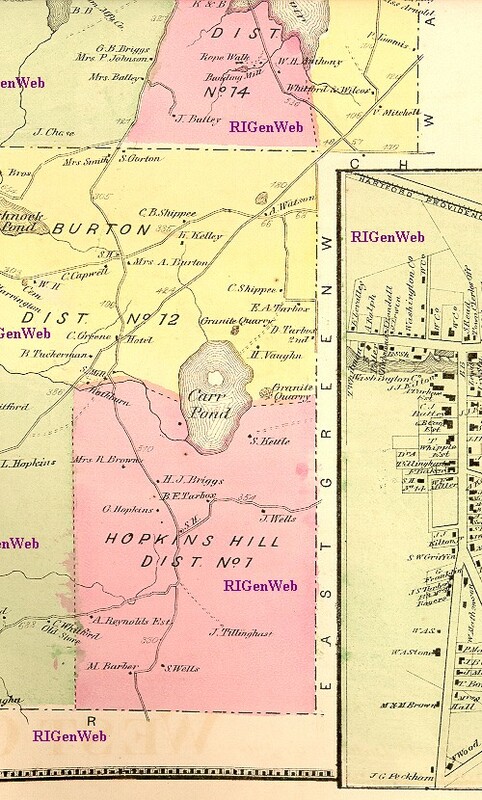 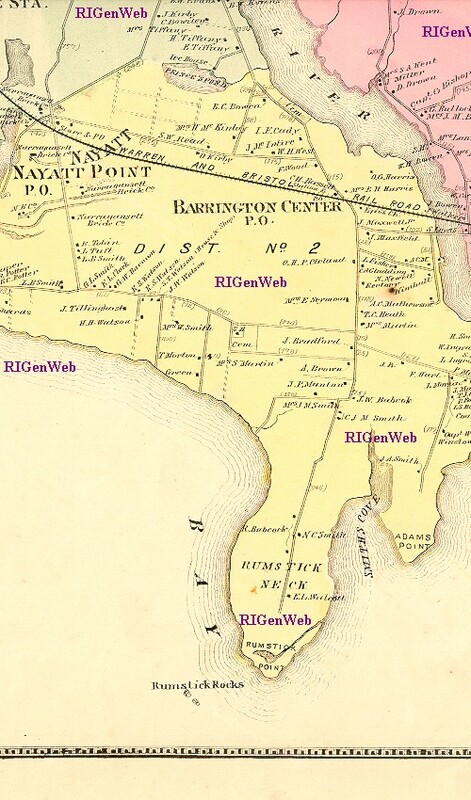 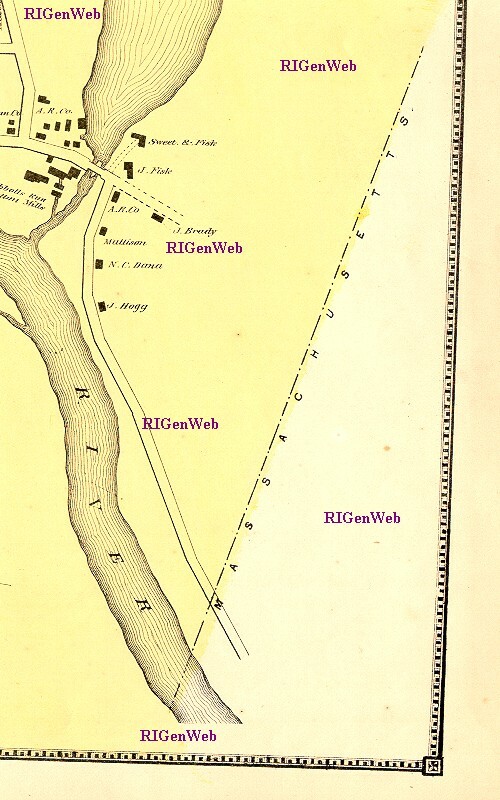 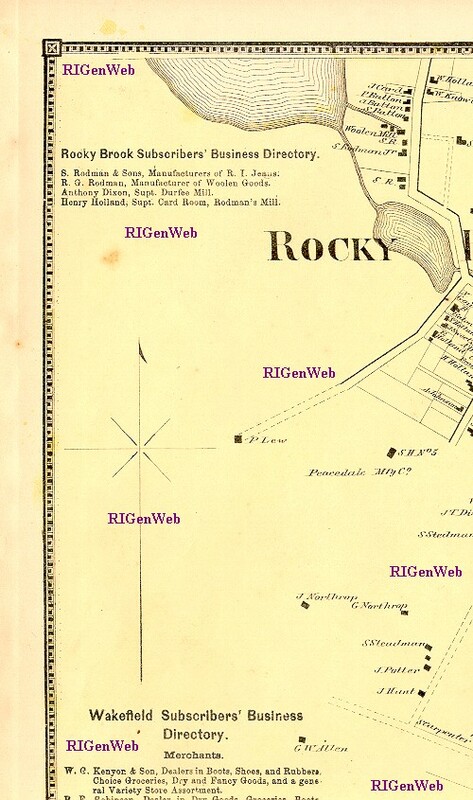 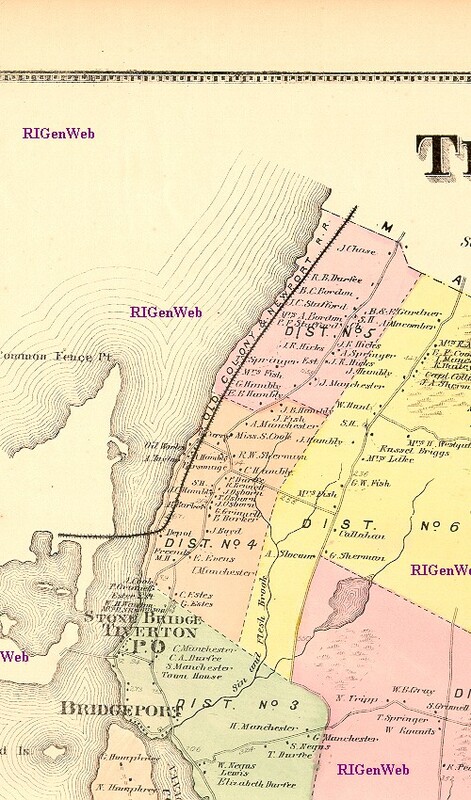 GoldBug maps showing state and county lines of CT, MA & RI in 1703, 1729 and 1862. 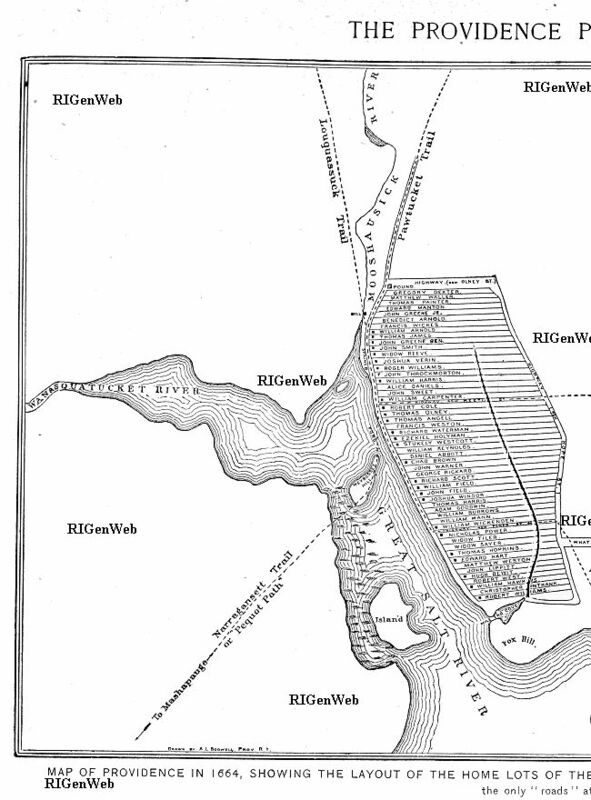 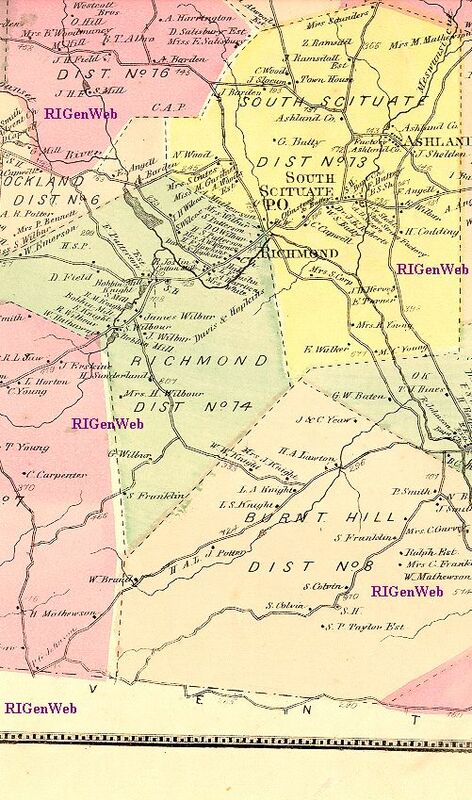 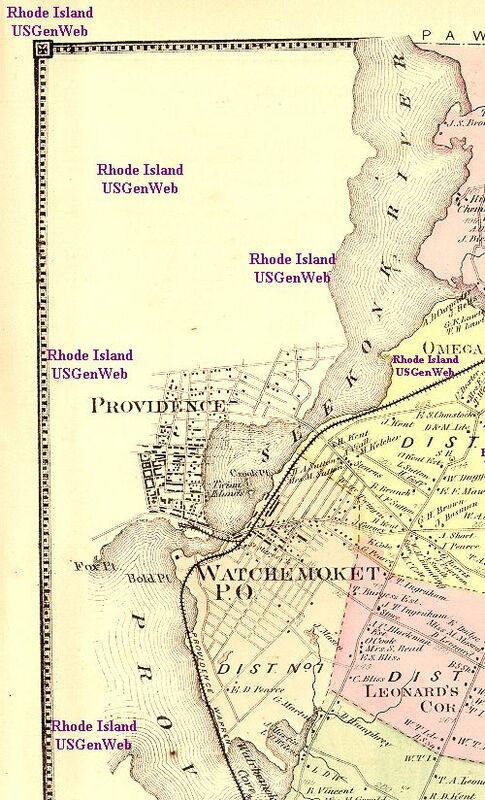 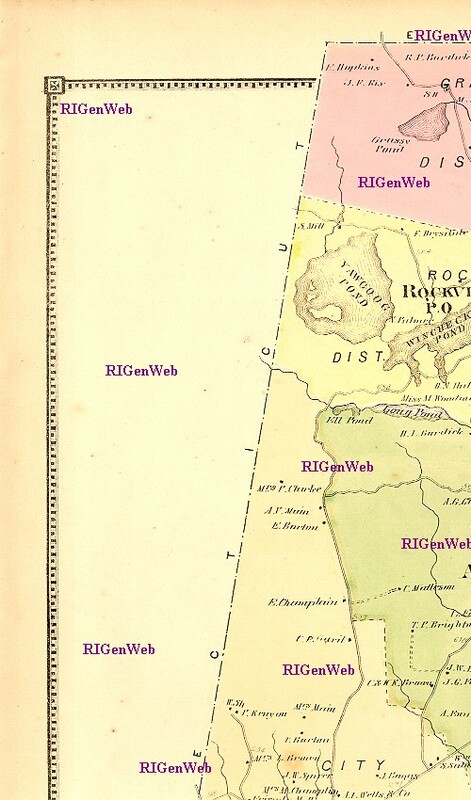 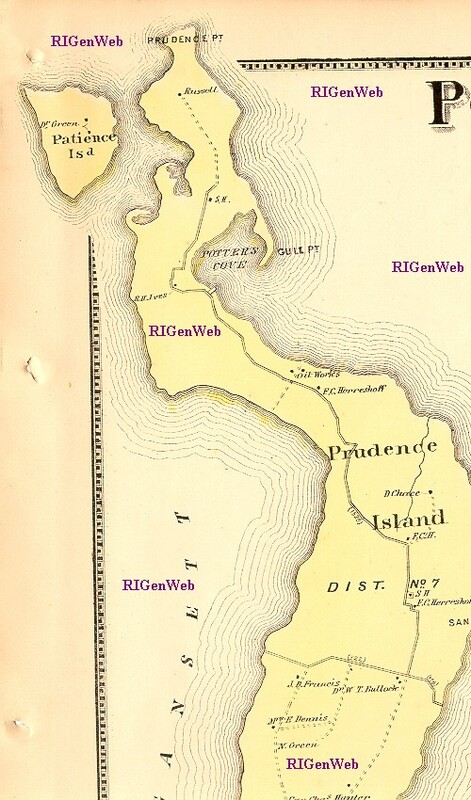 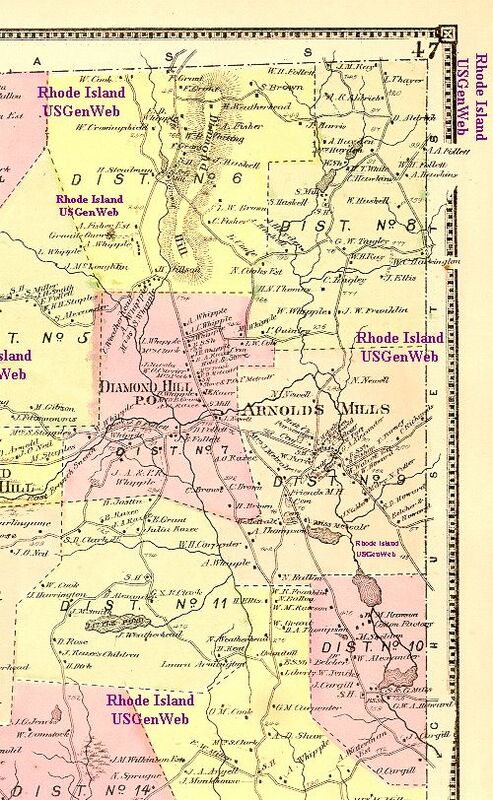 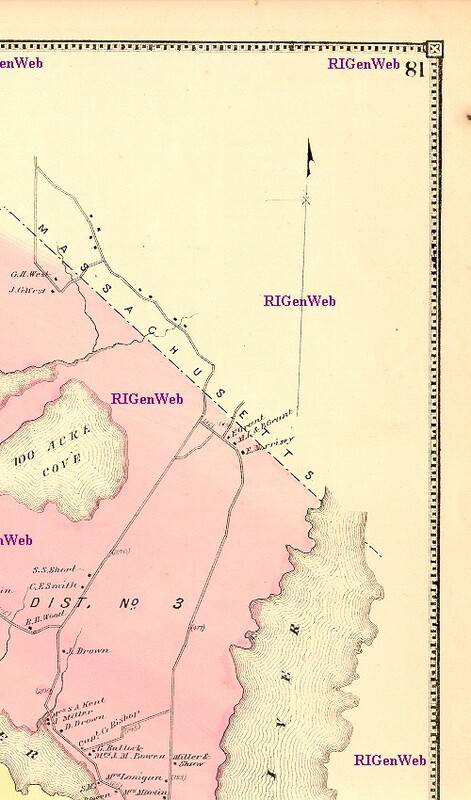 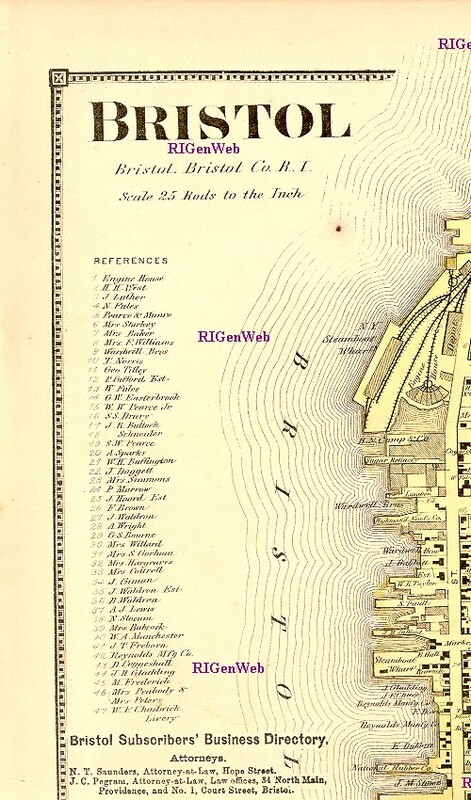 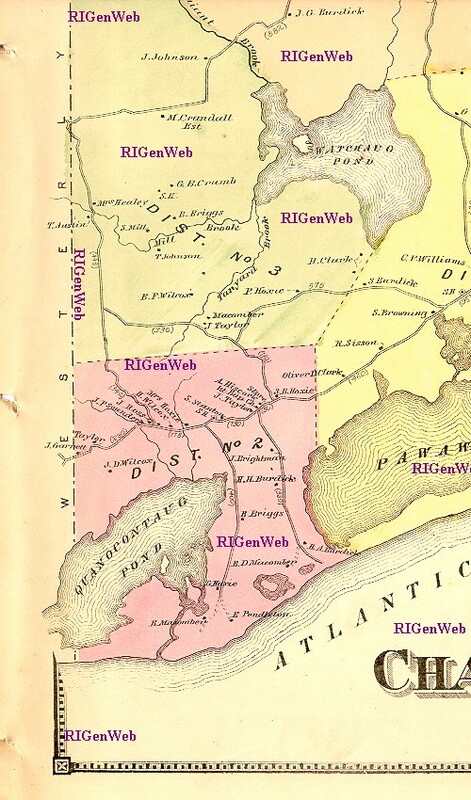 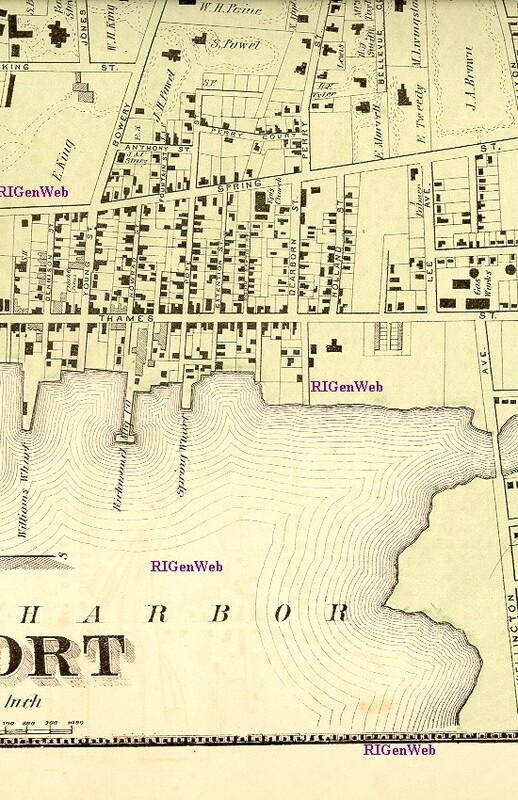 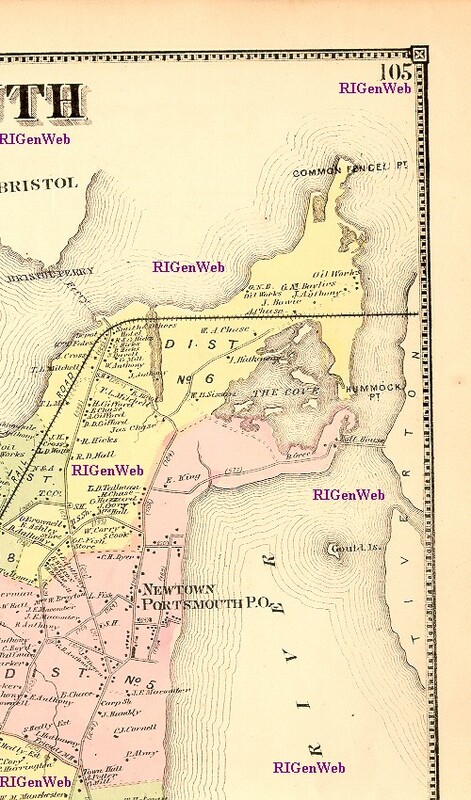 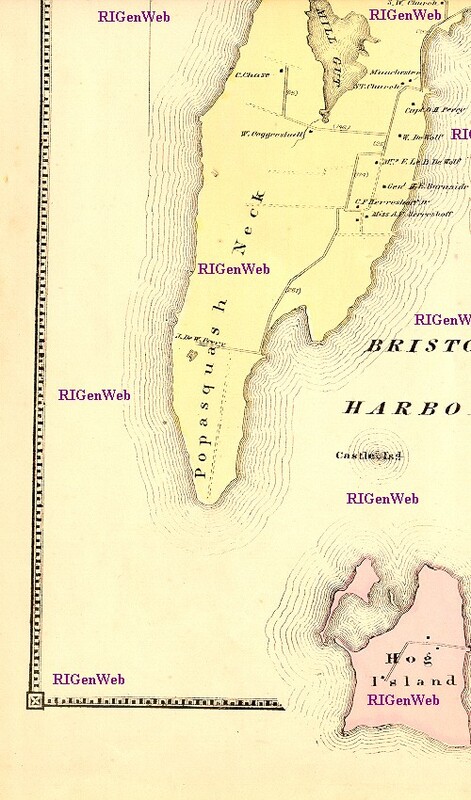 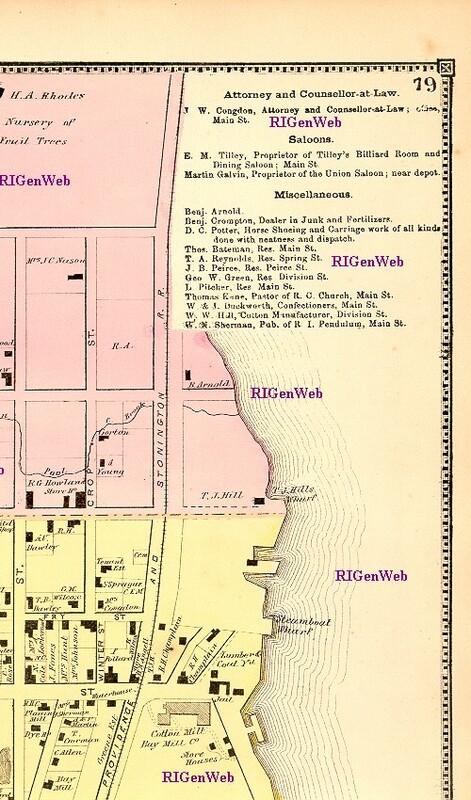 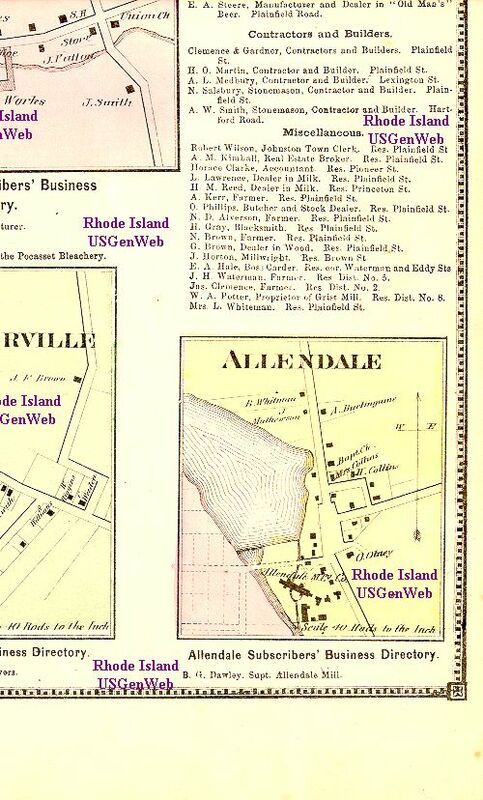 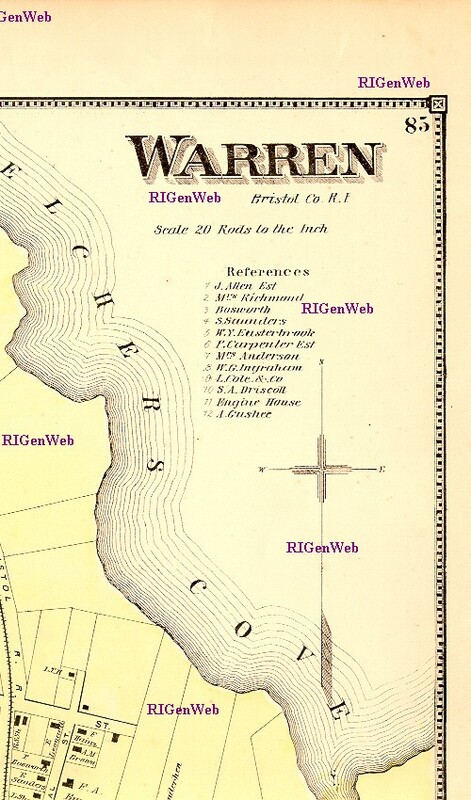 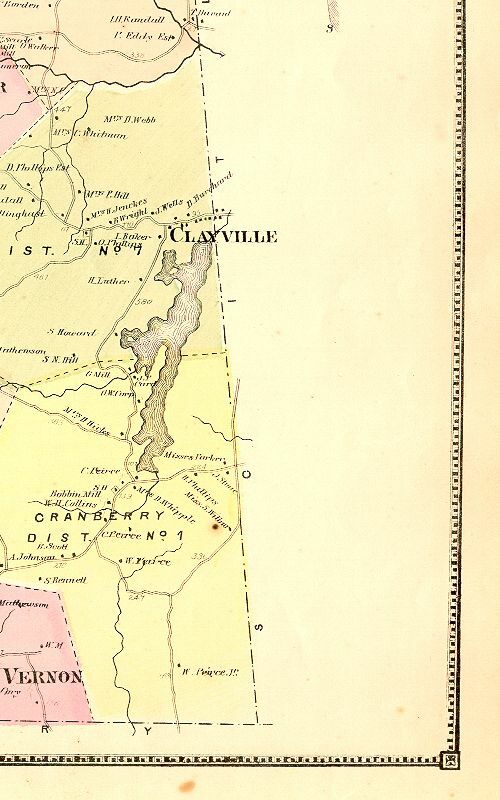 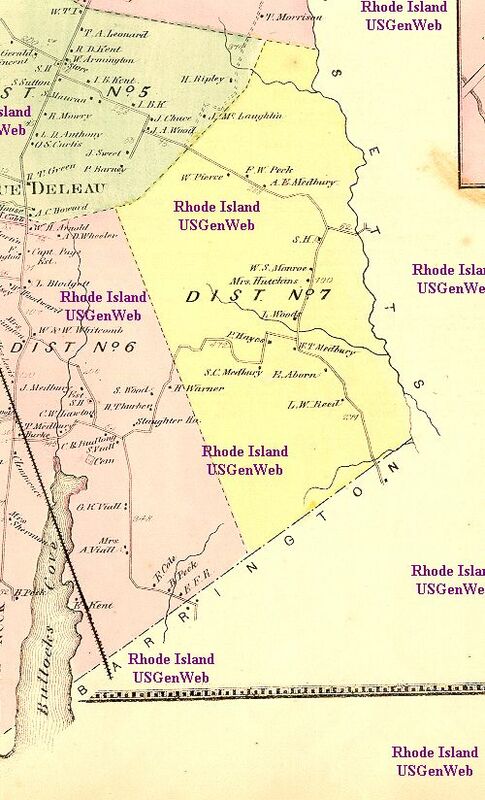 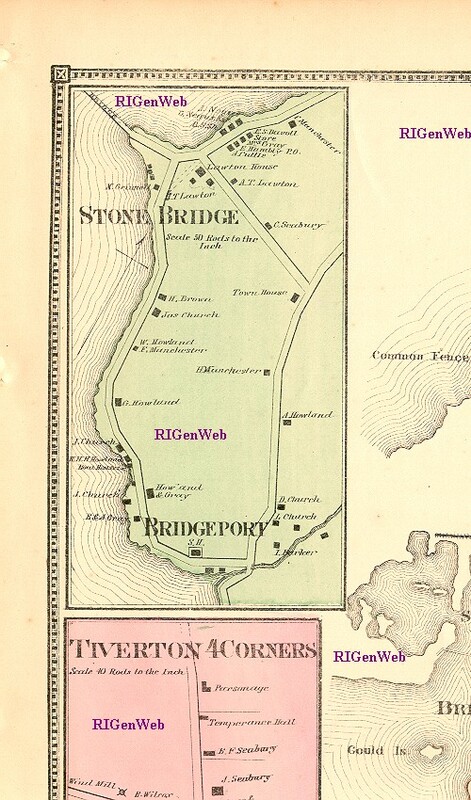 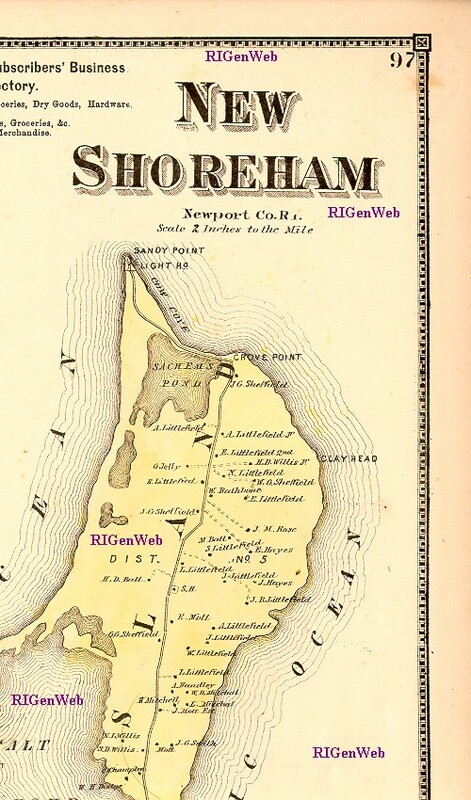 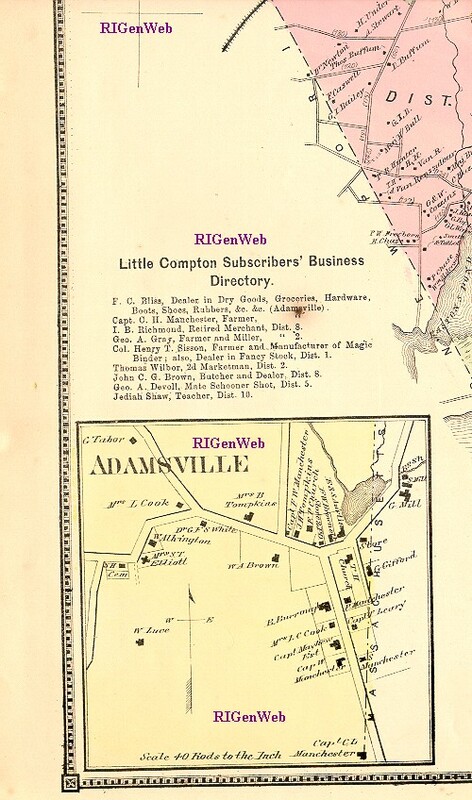 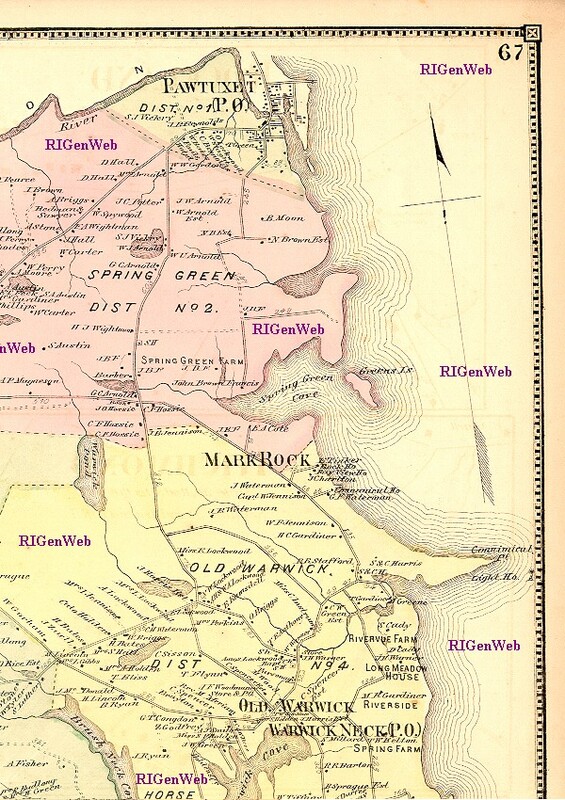 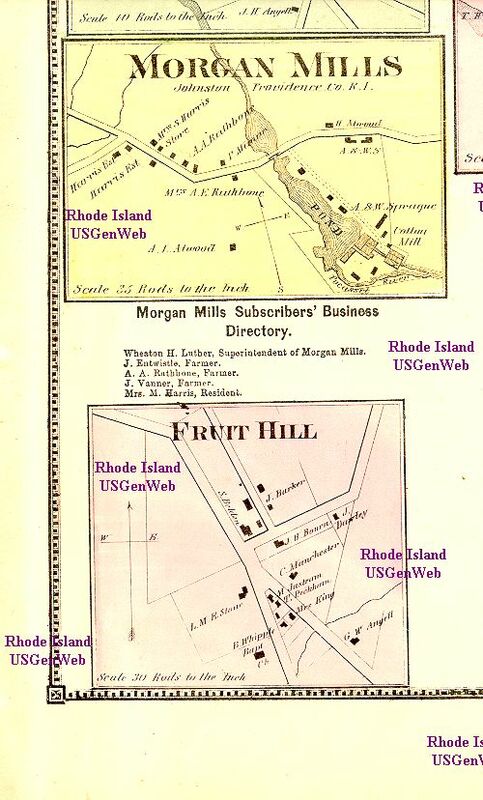 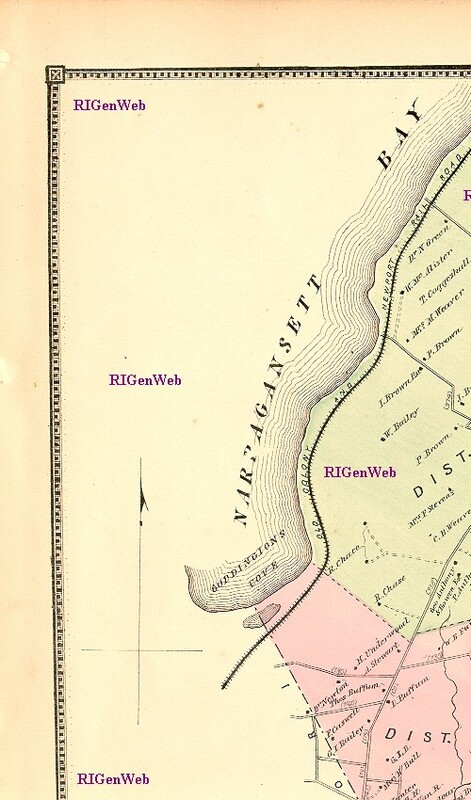 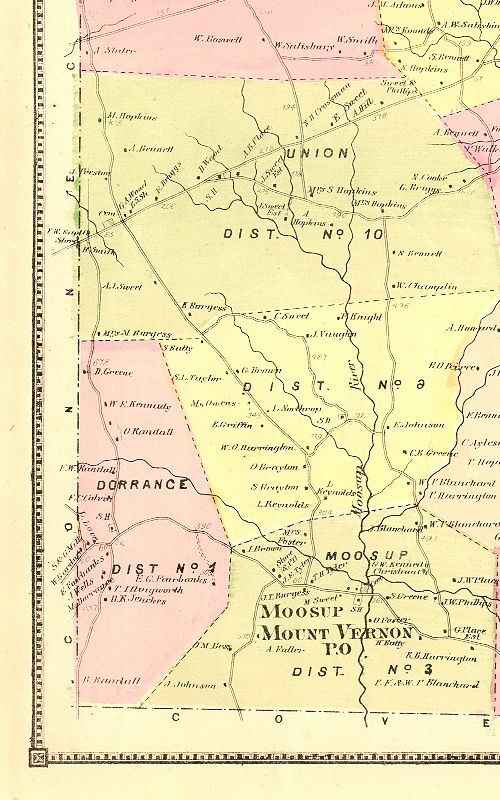 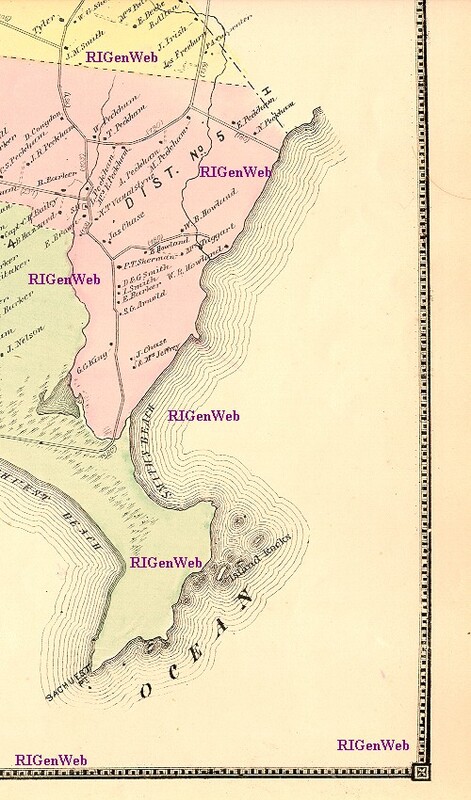 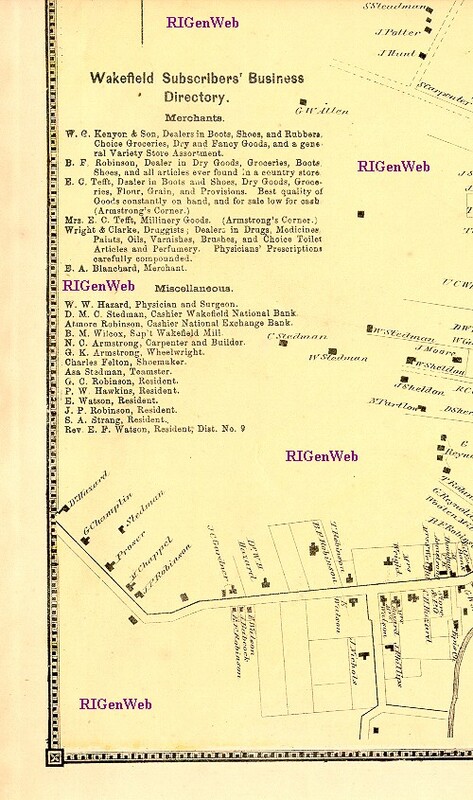 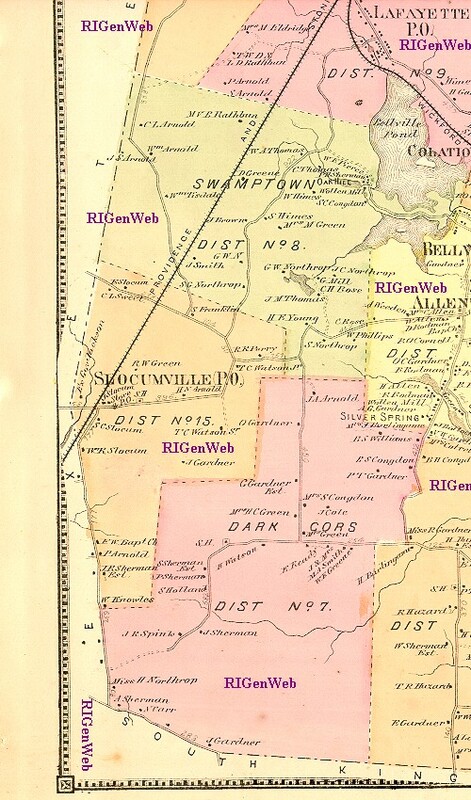 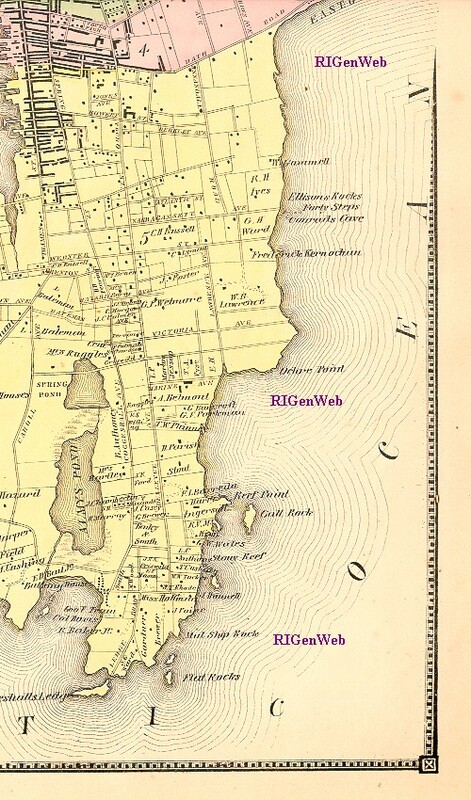 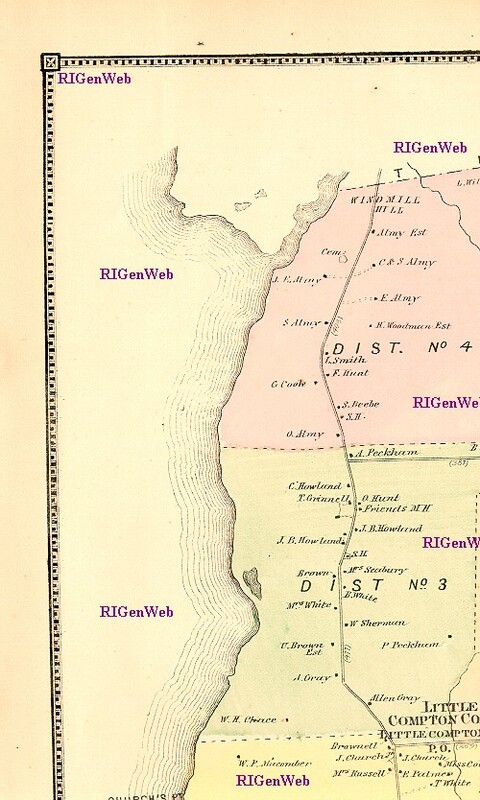 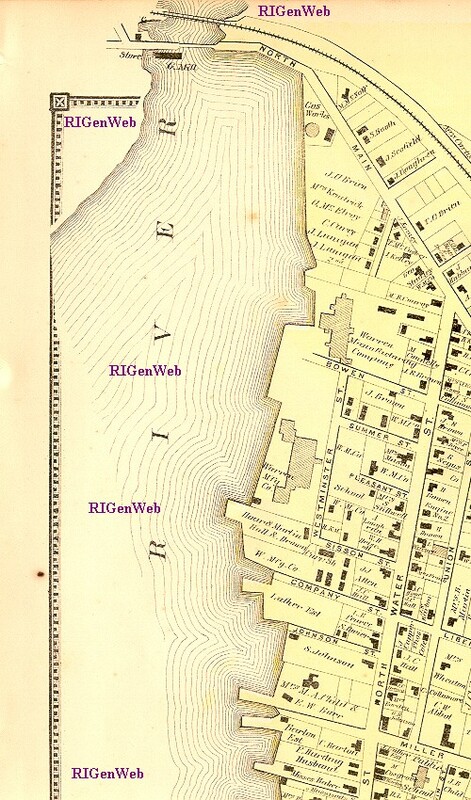 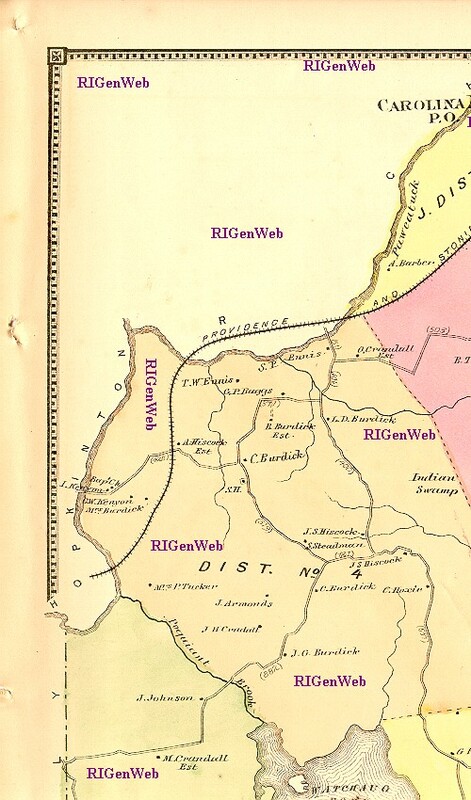 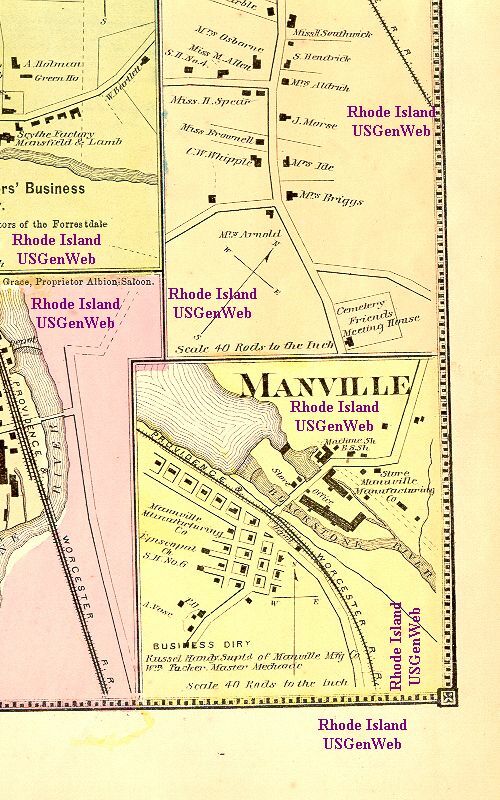 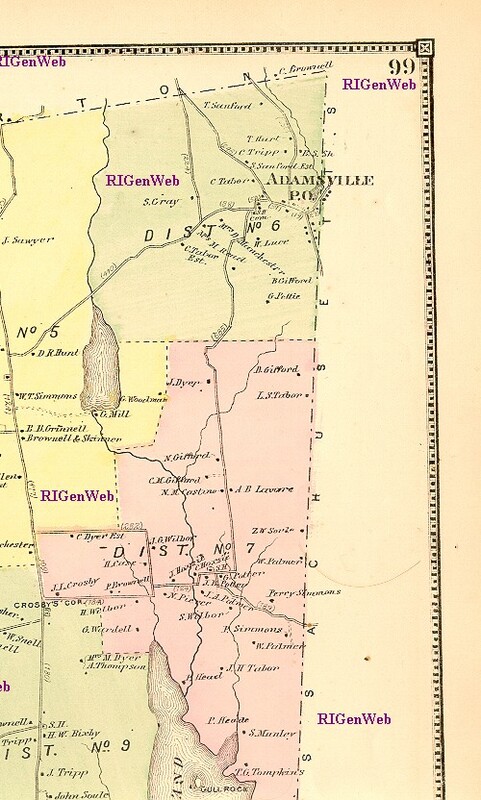 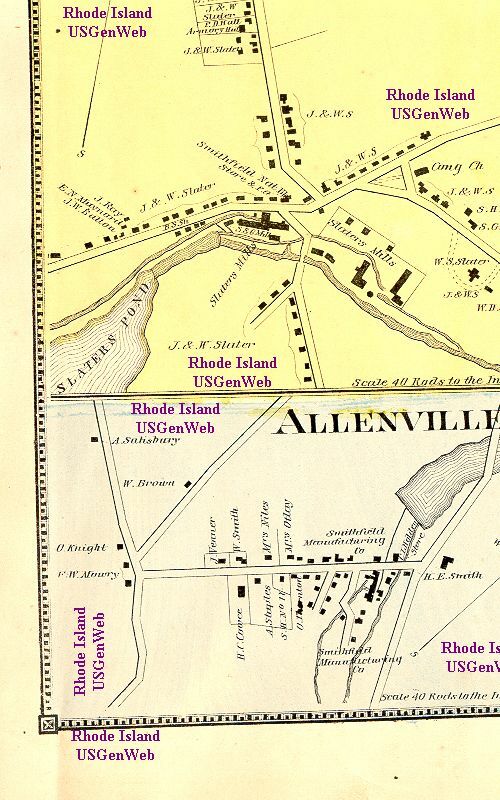 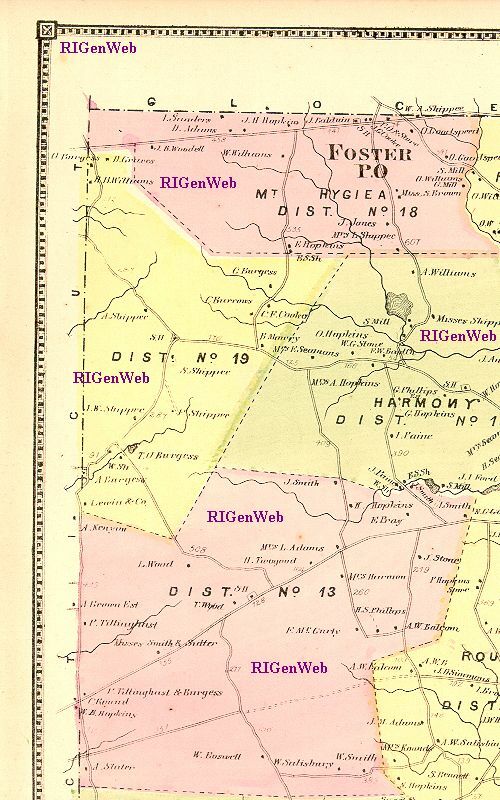 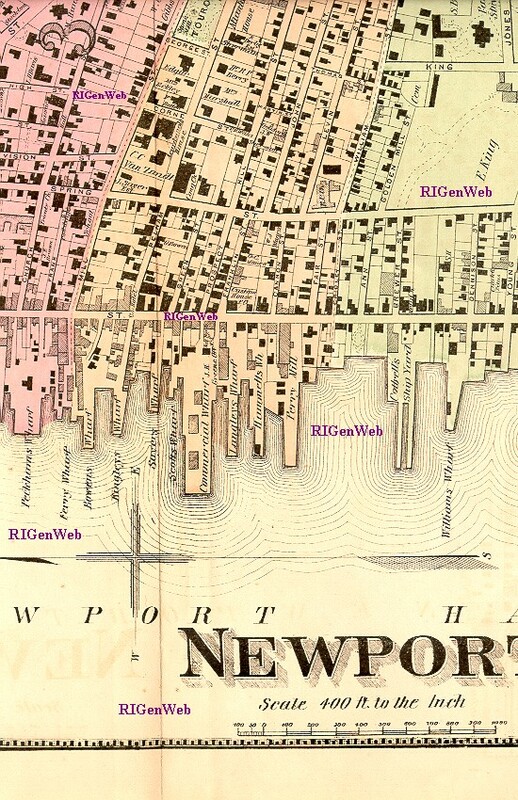 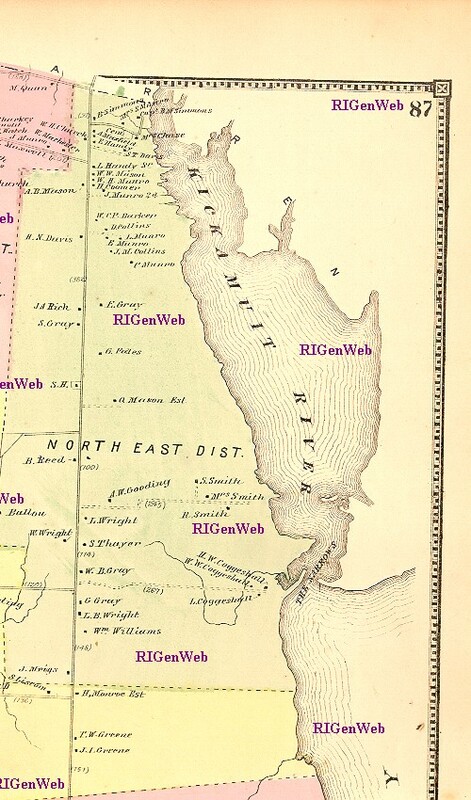 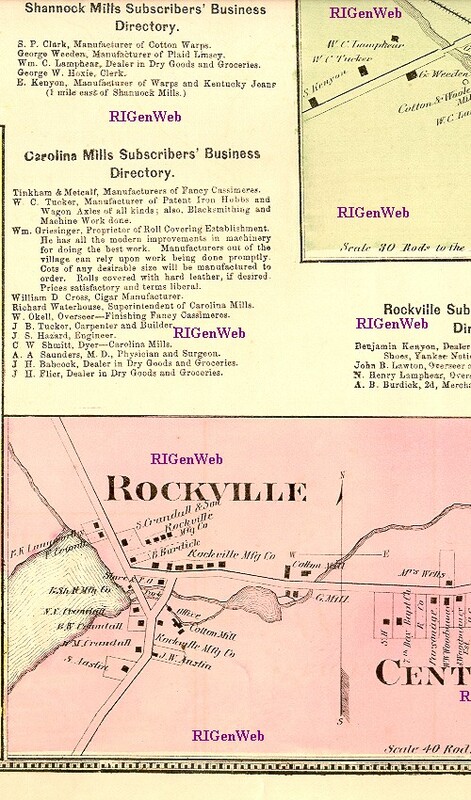 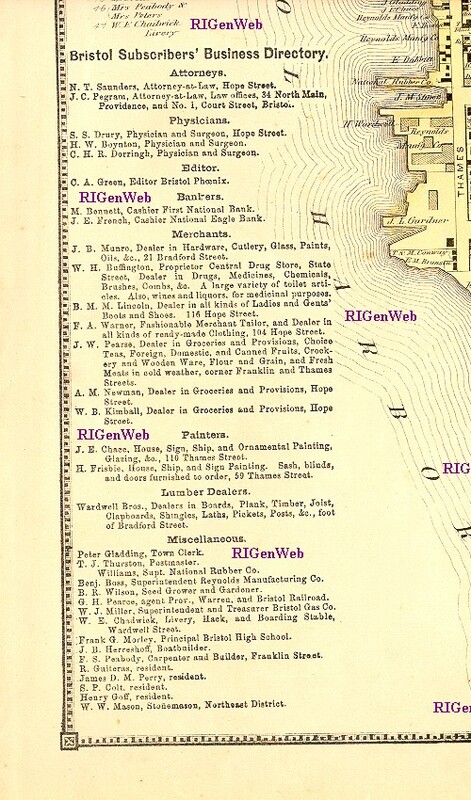 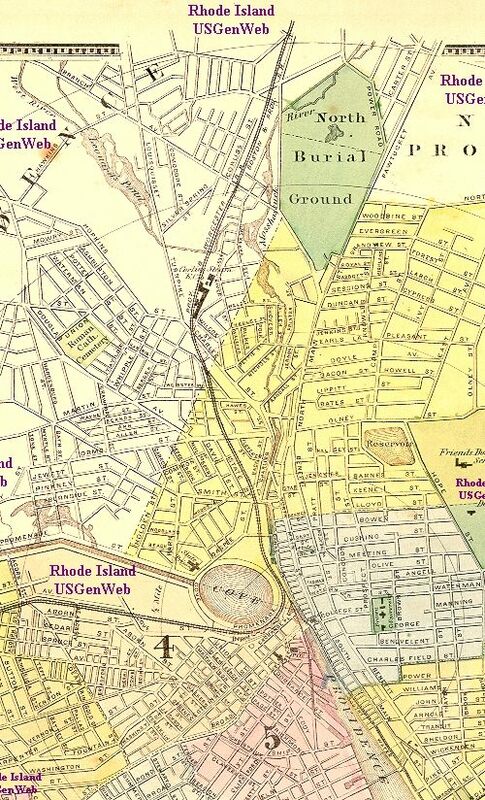 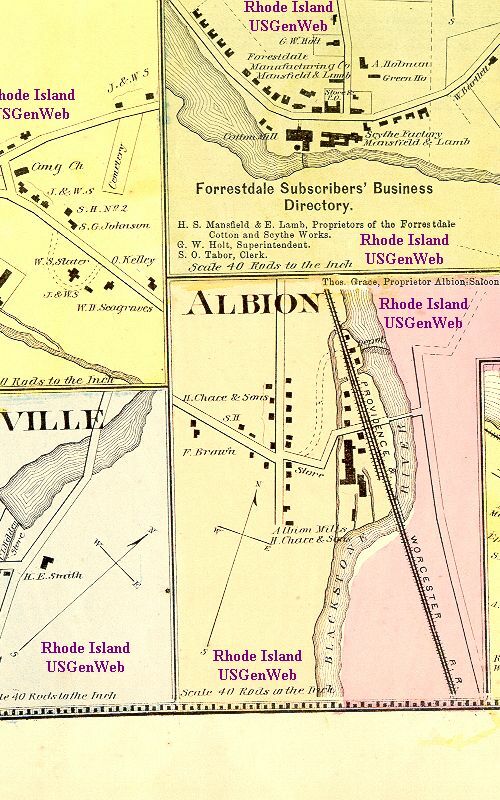 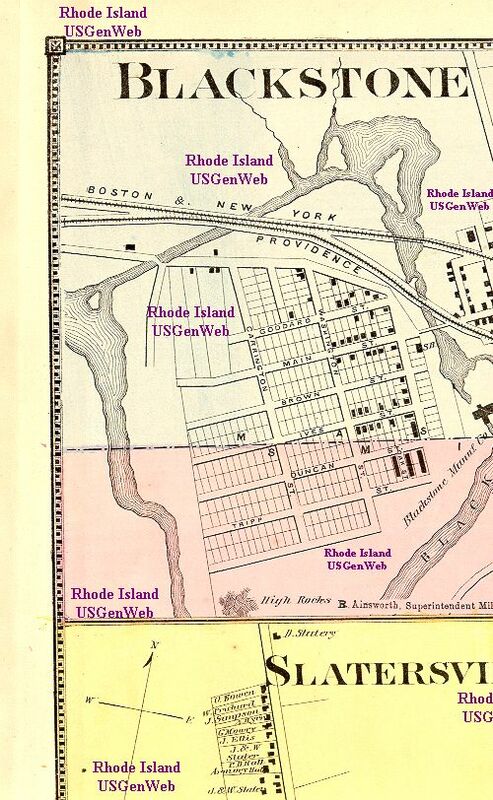 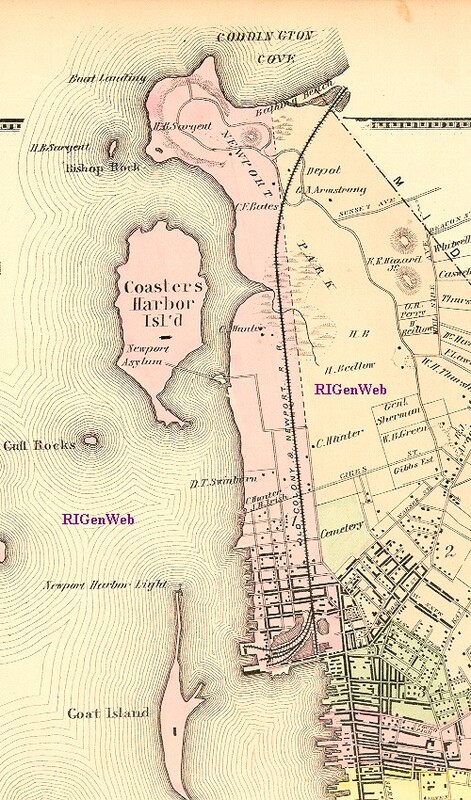 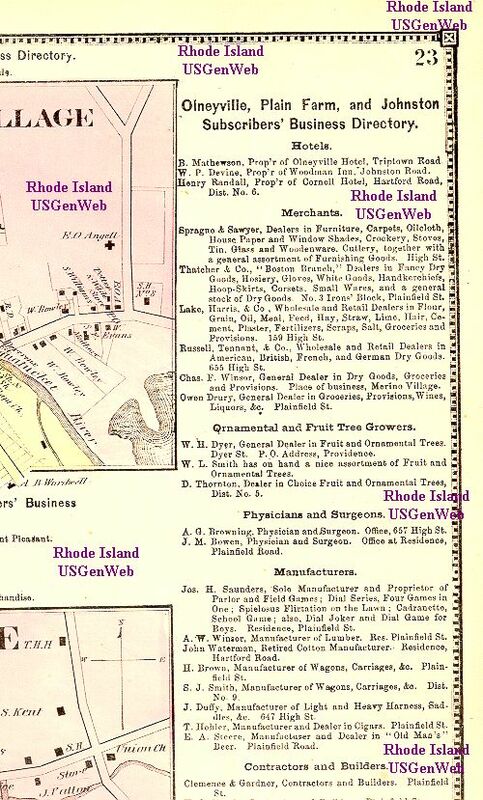 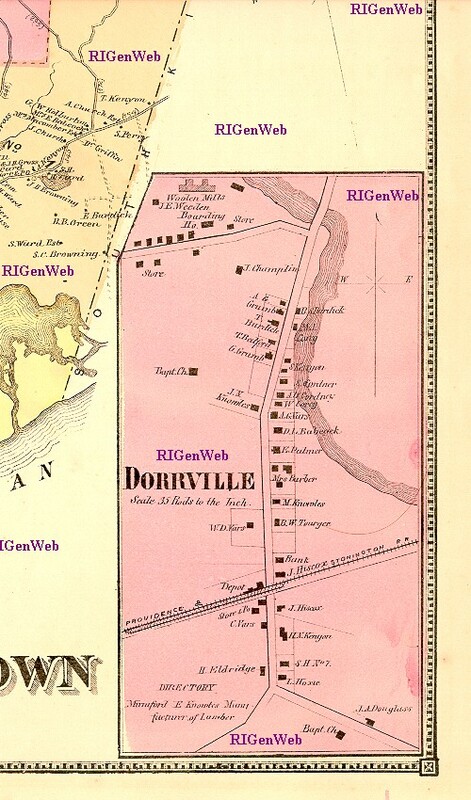 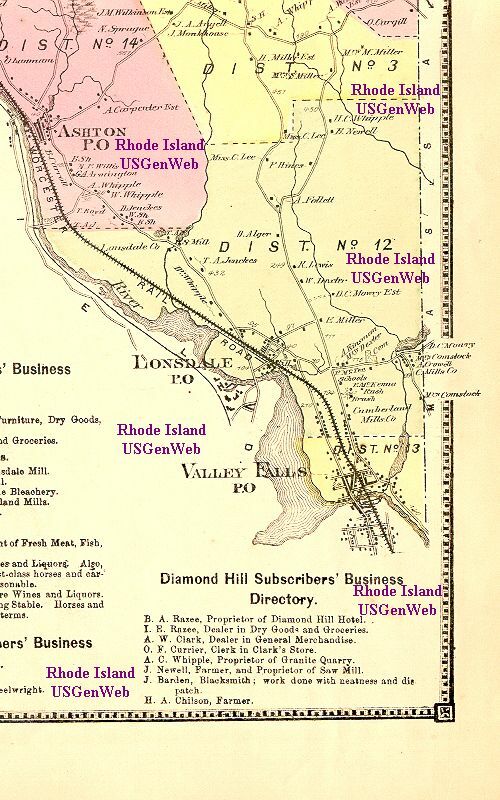 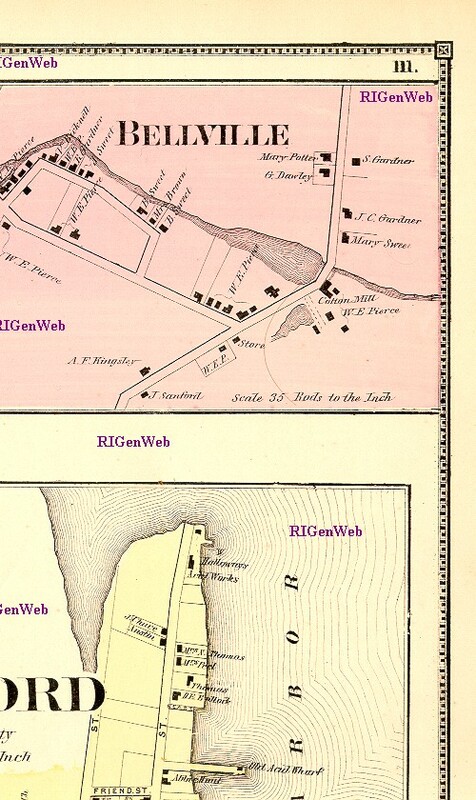 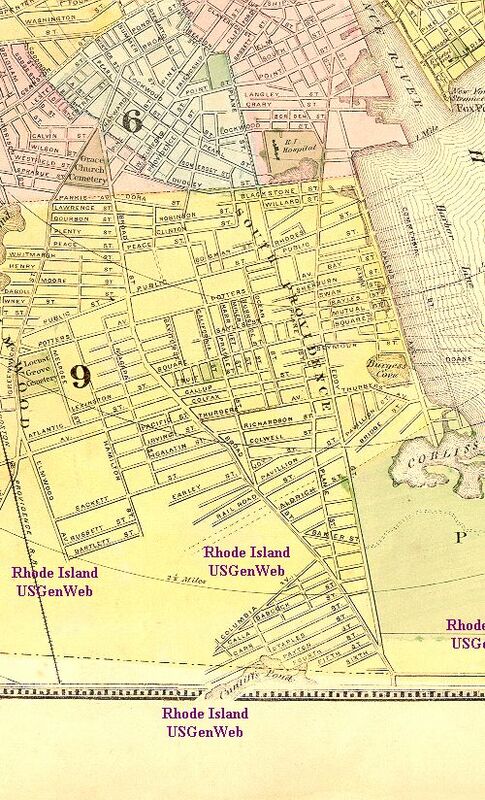 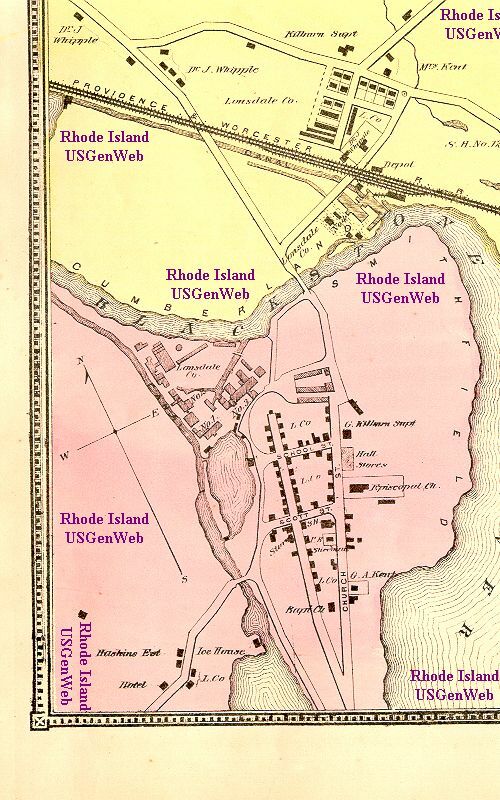 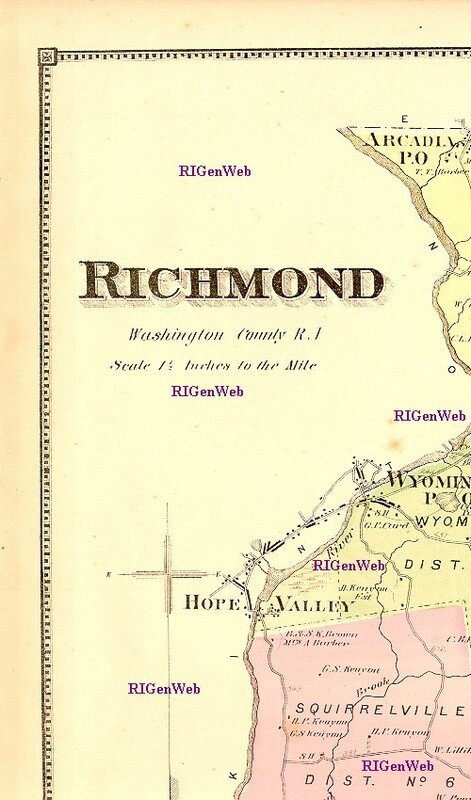 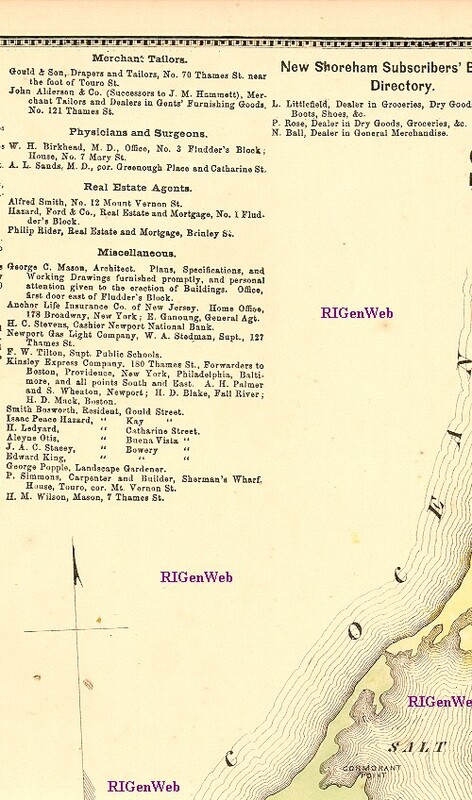 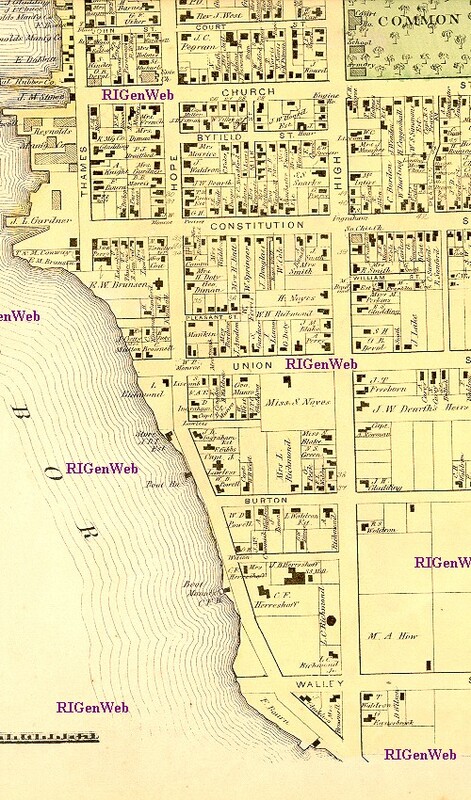 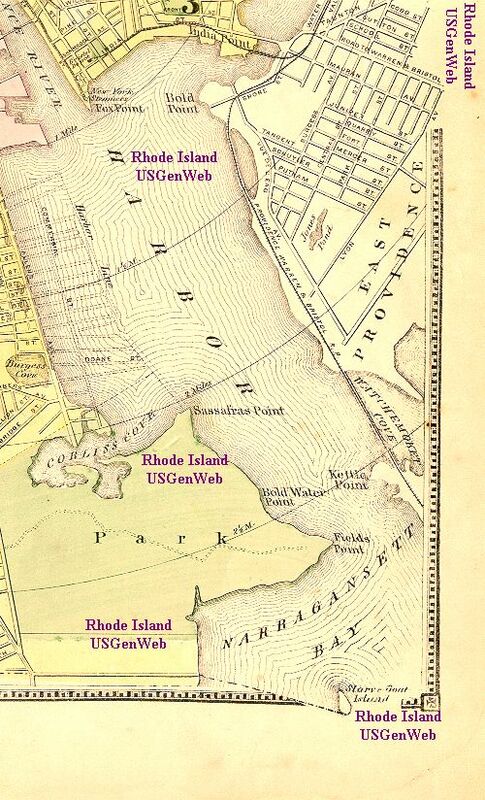 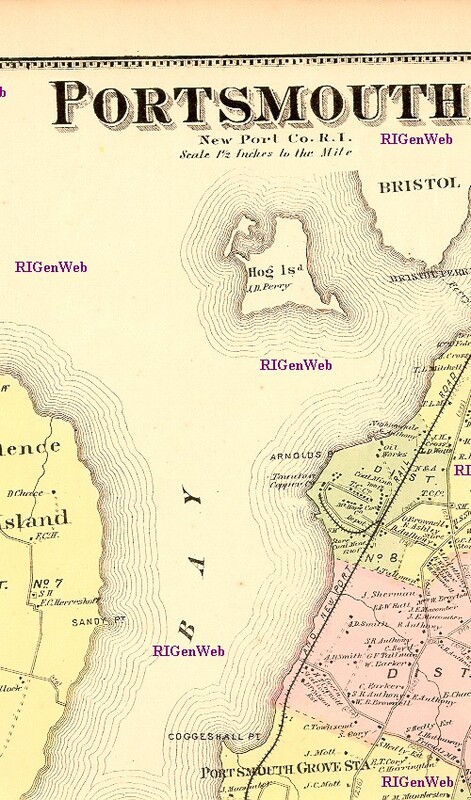 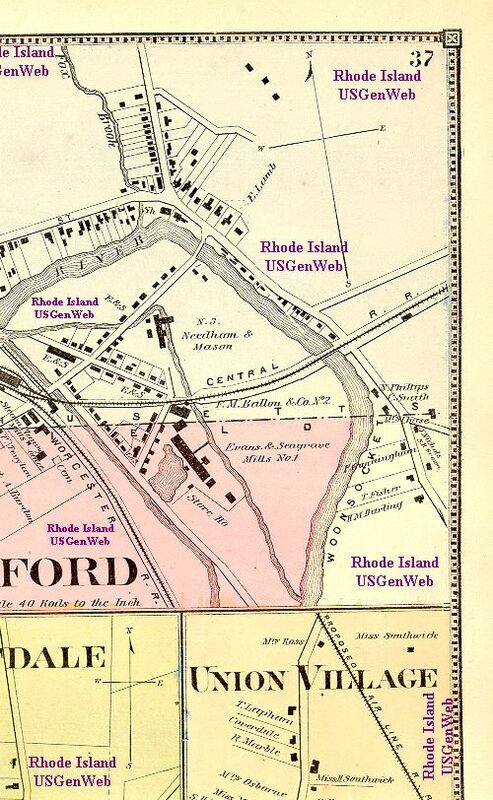 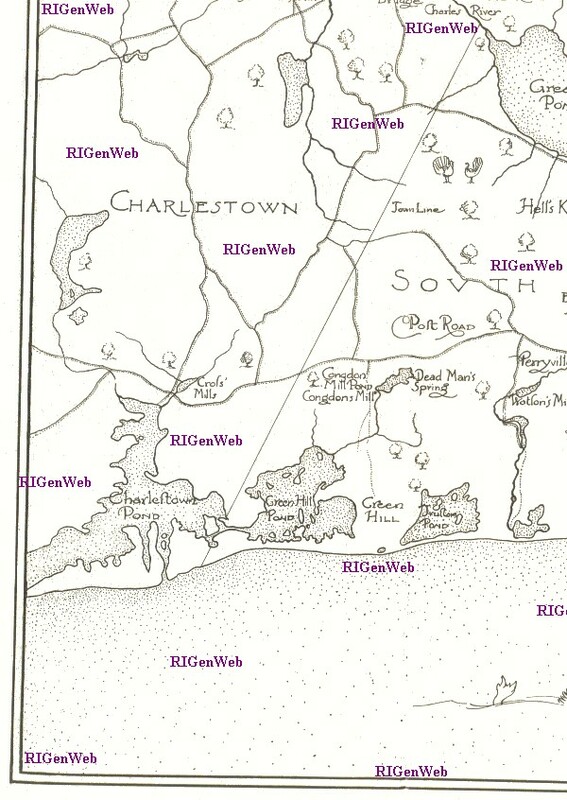 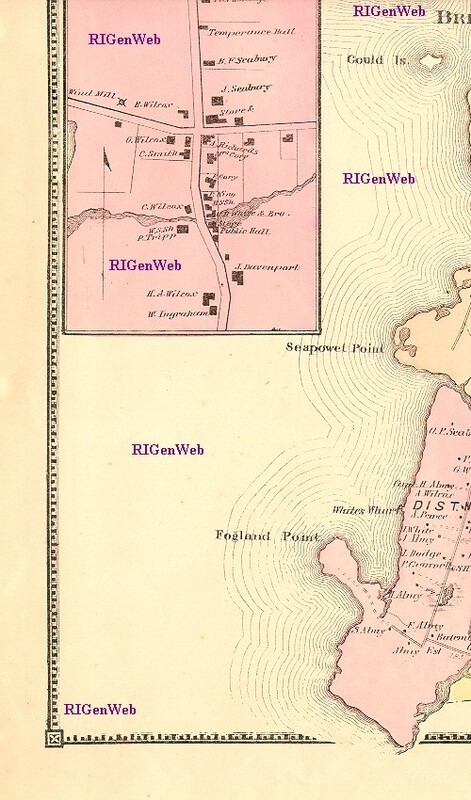 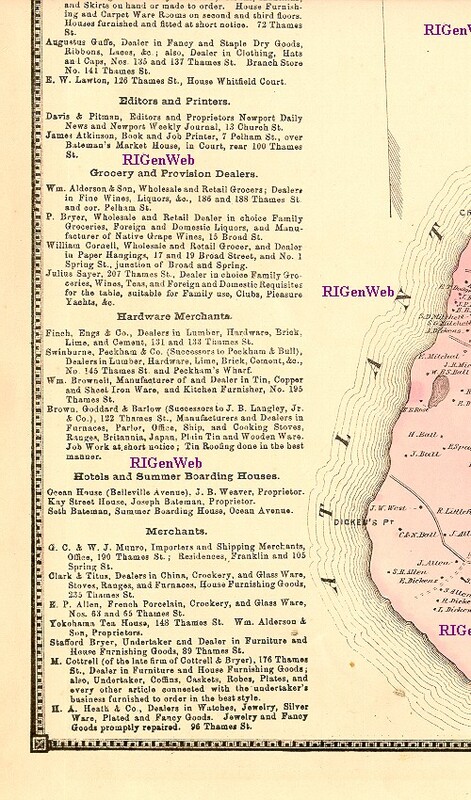 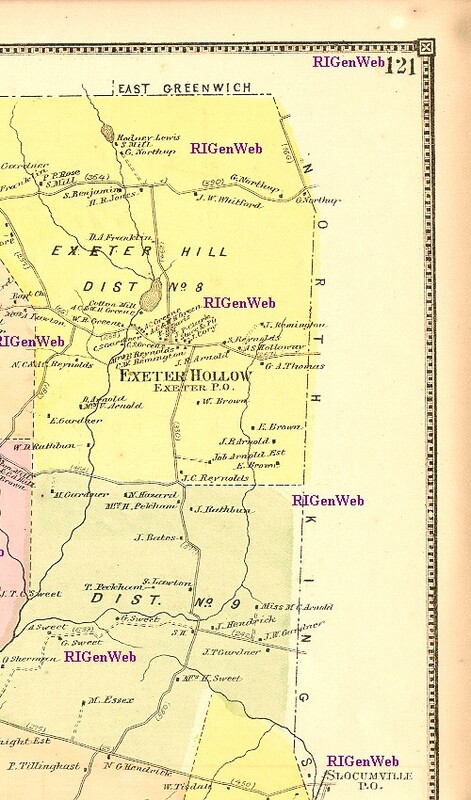 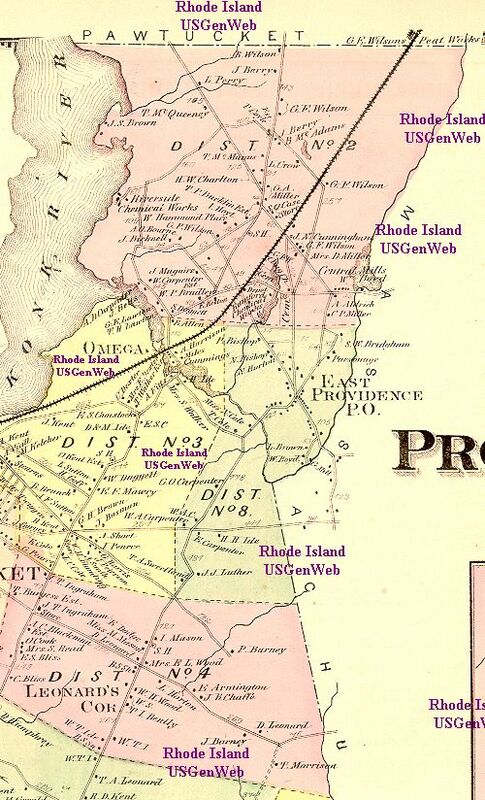 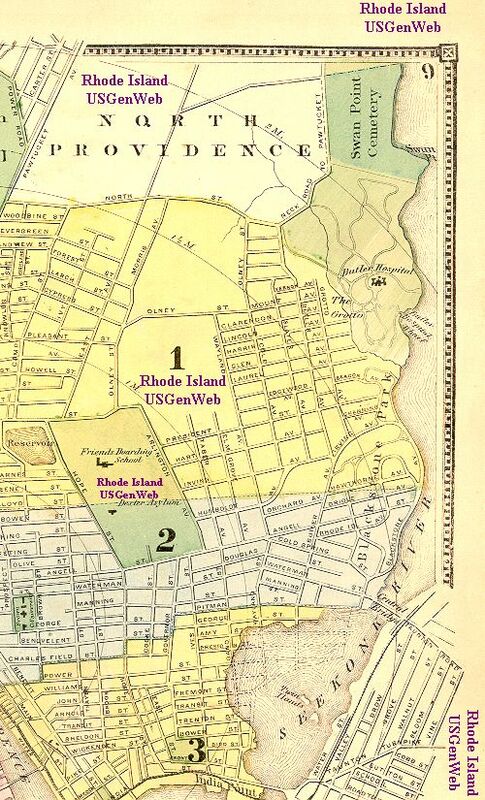 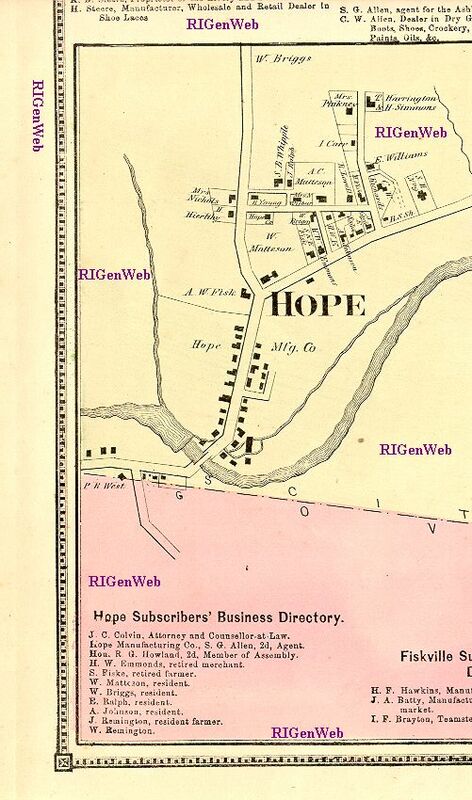 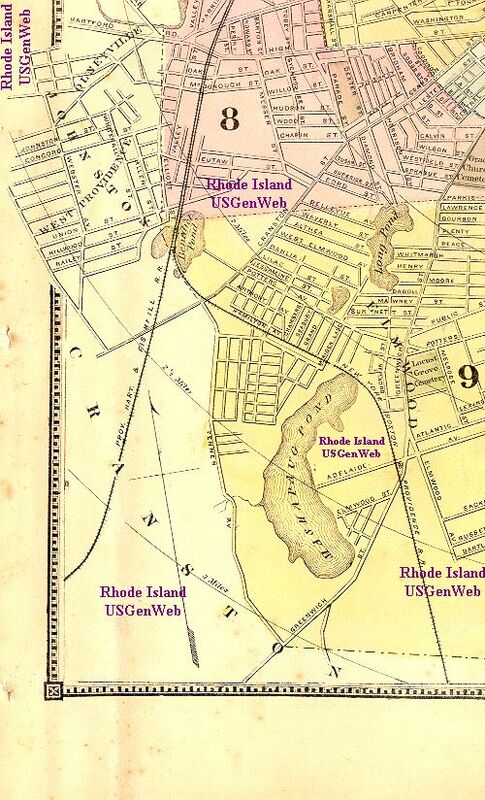 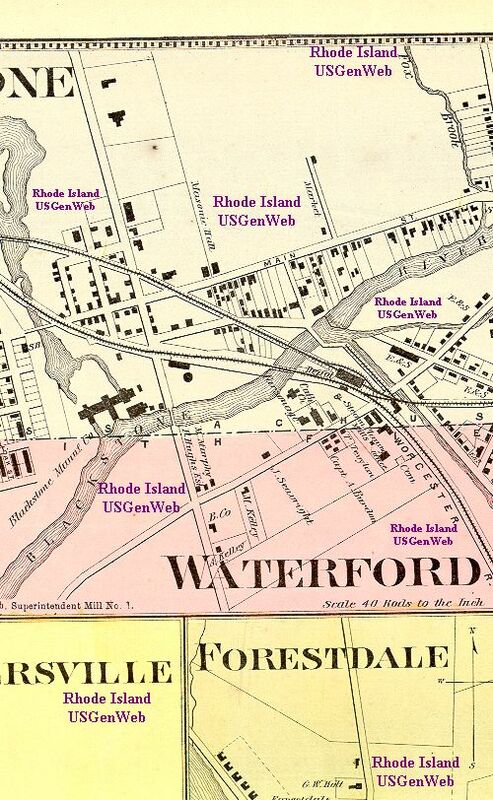 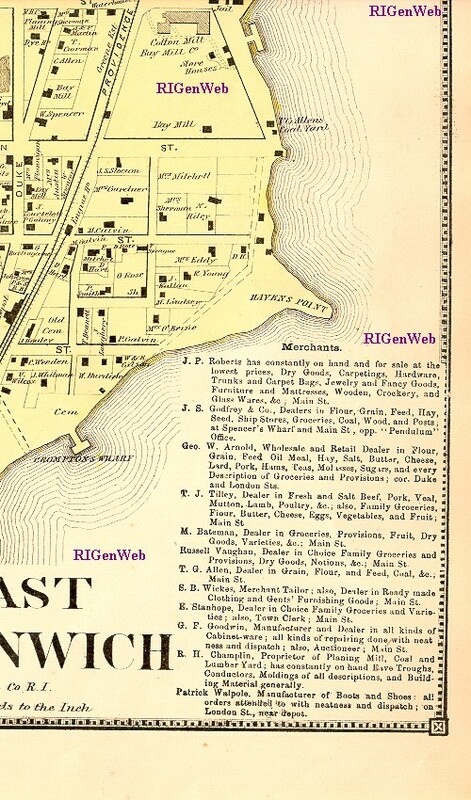 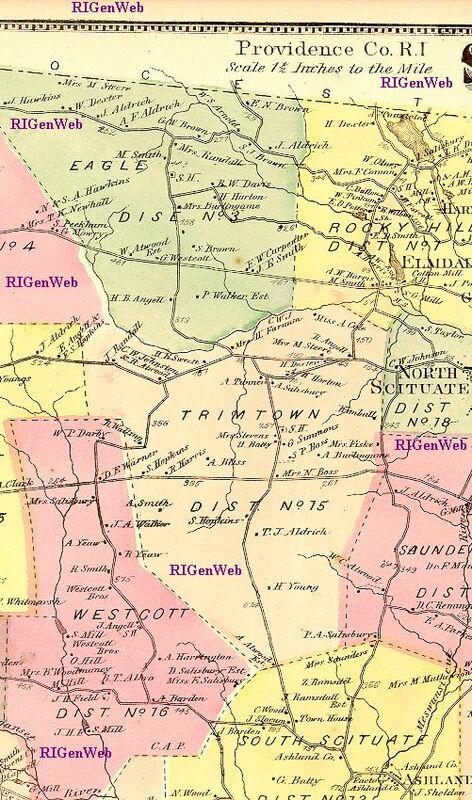 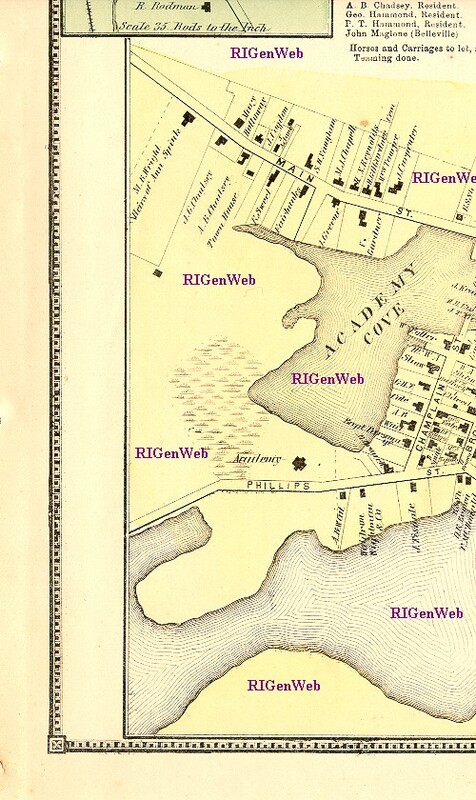 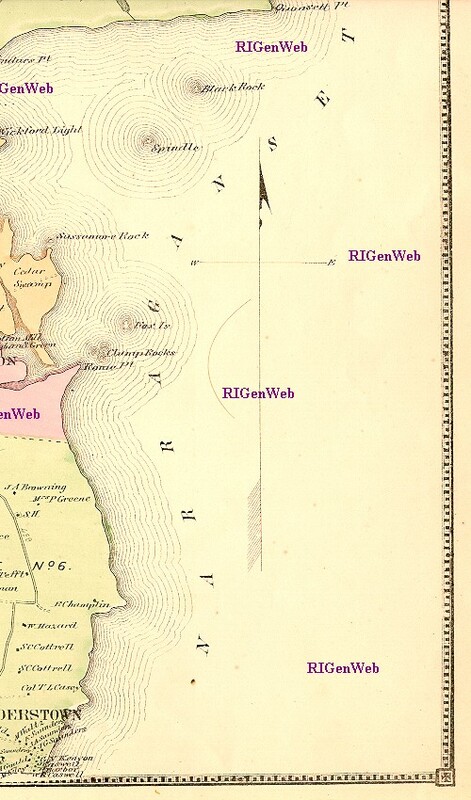 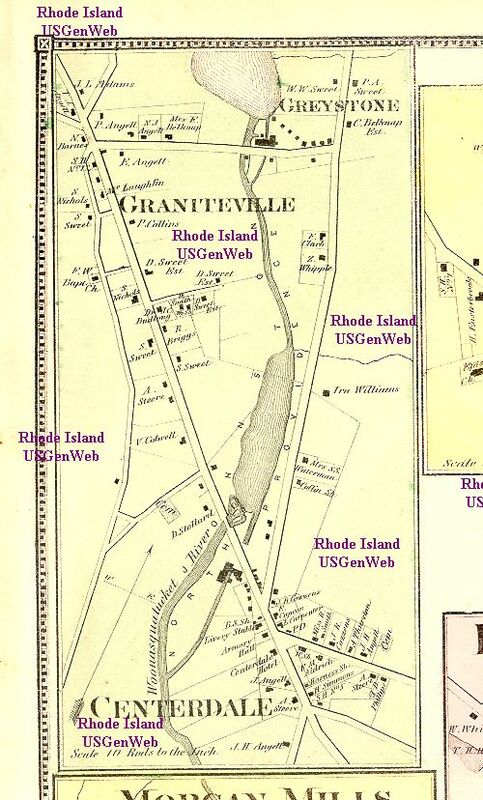 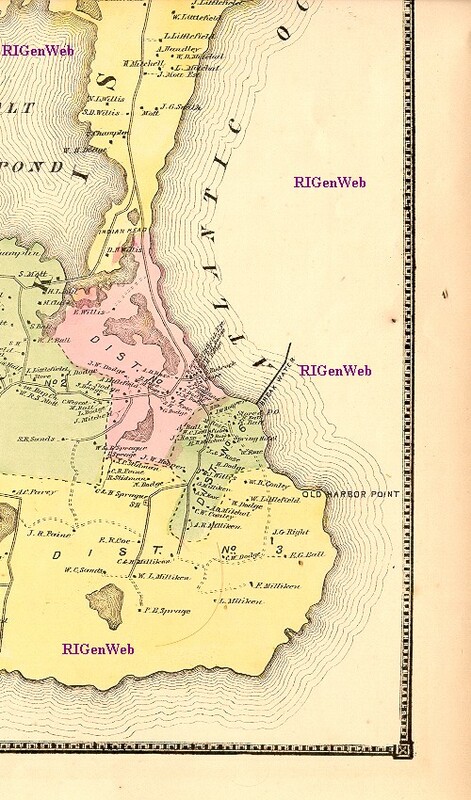 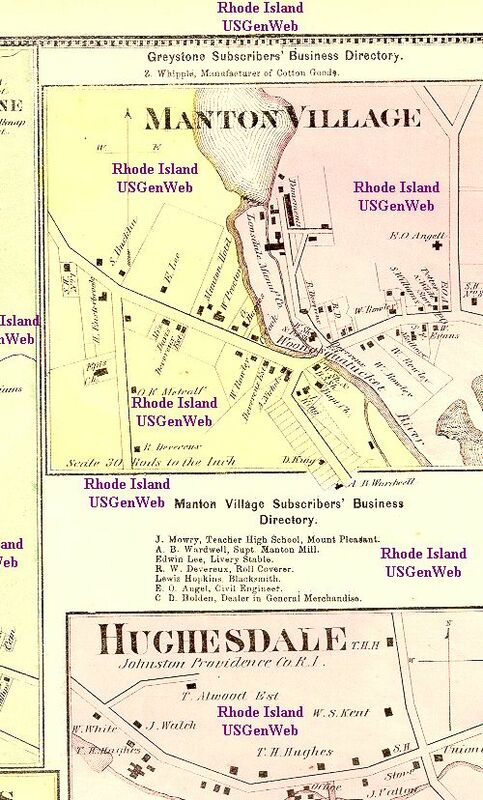 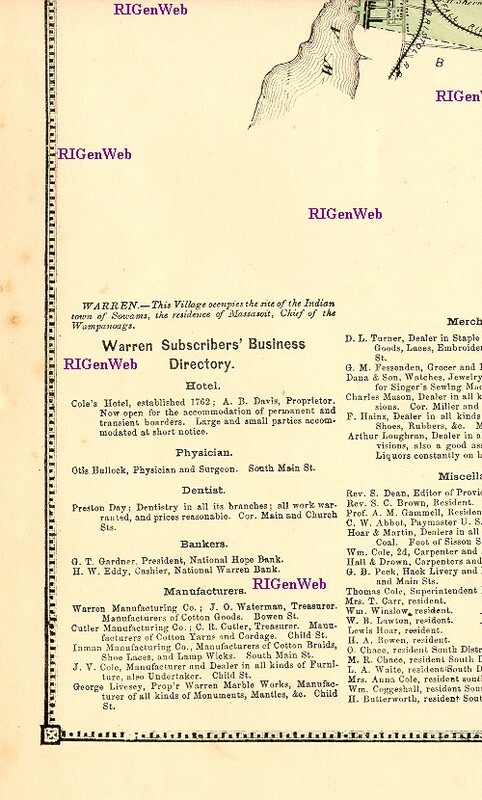 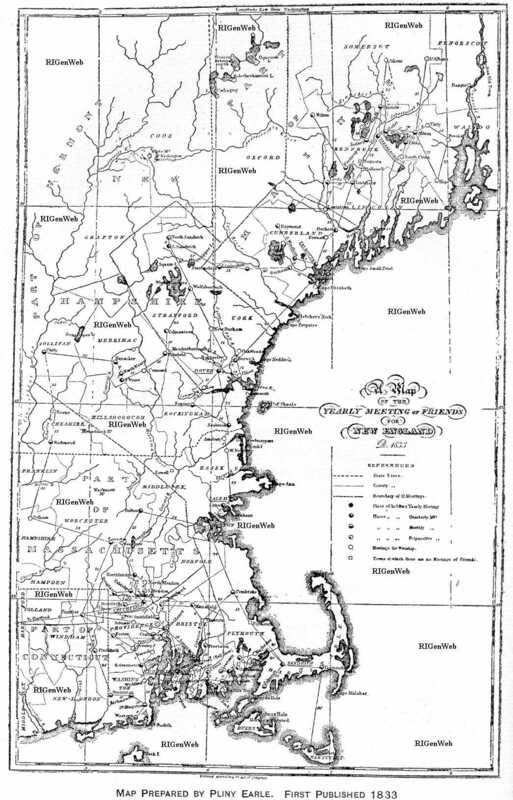 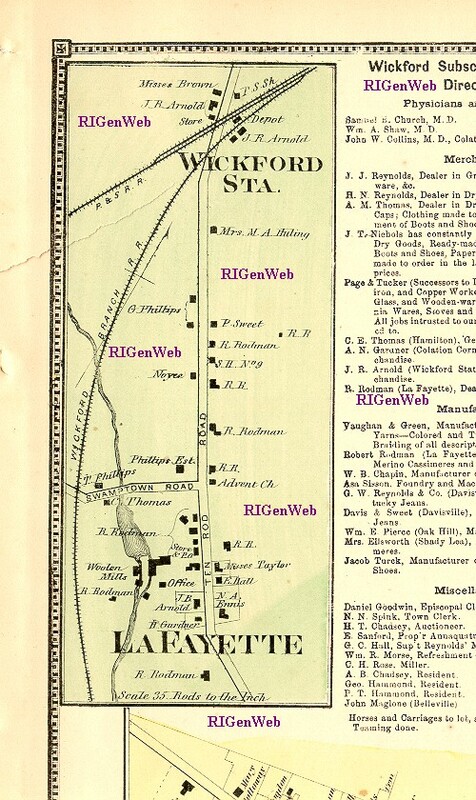 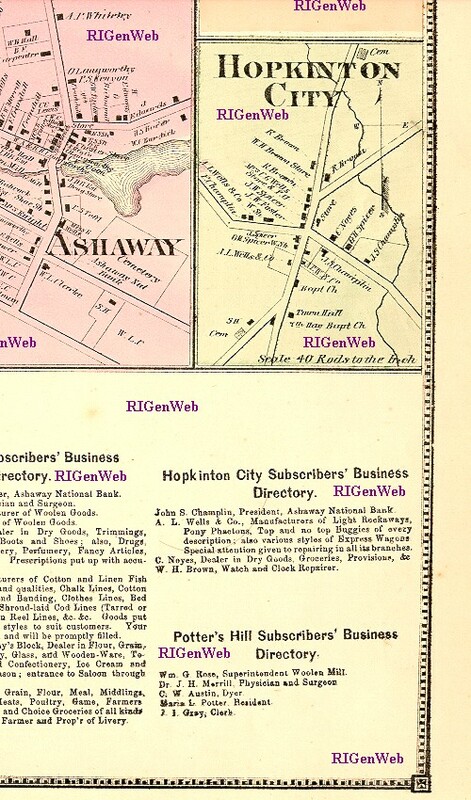 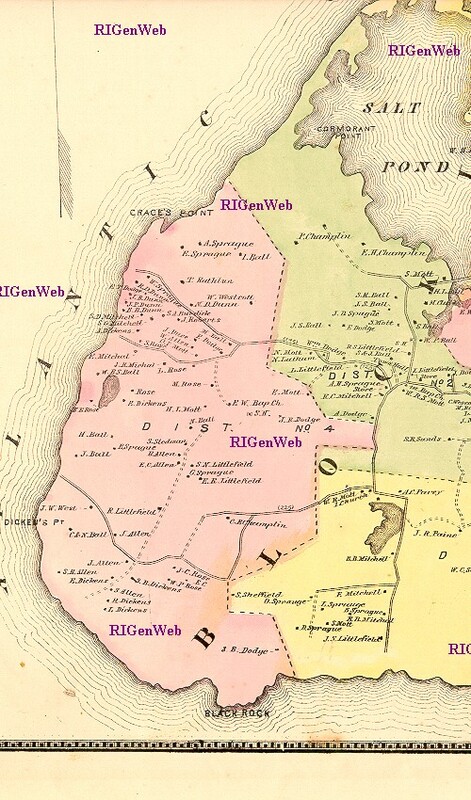 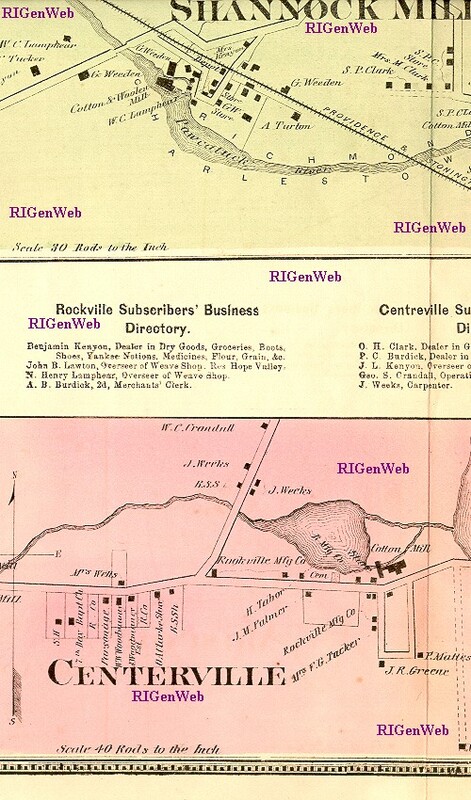 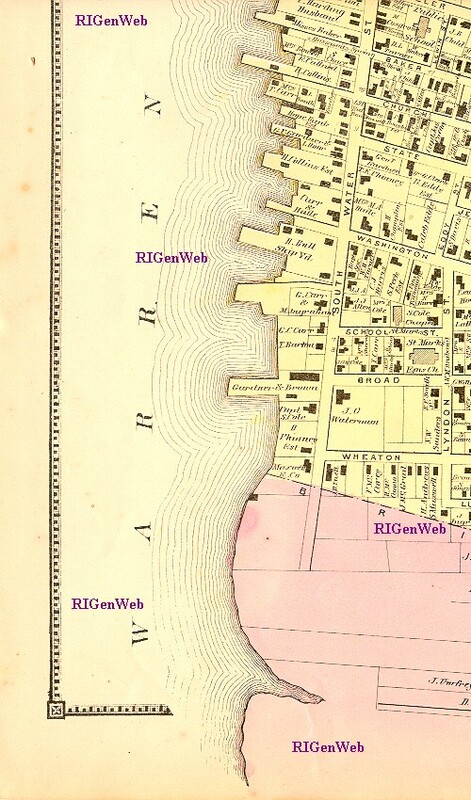 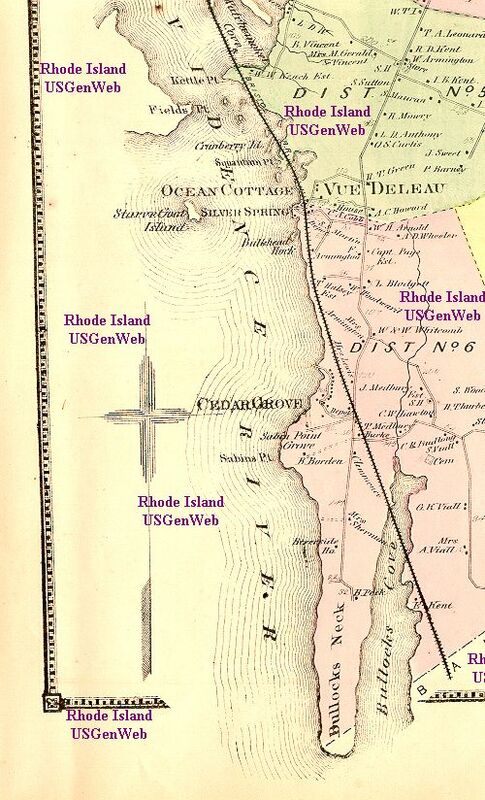 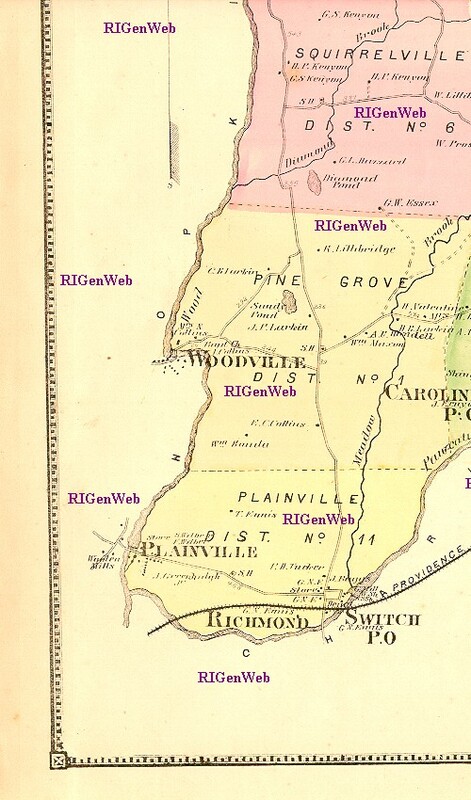 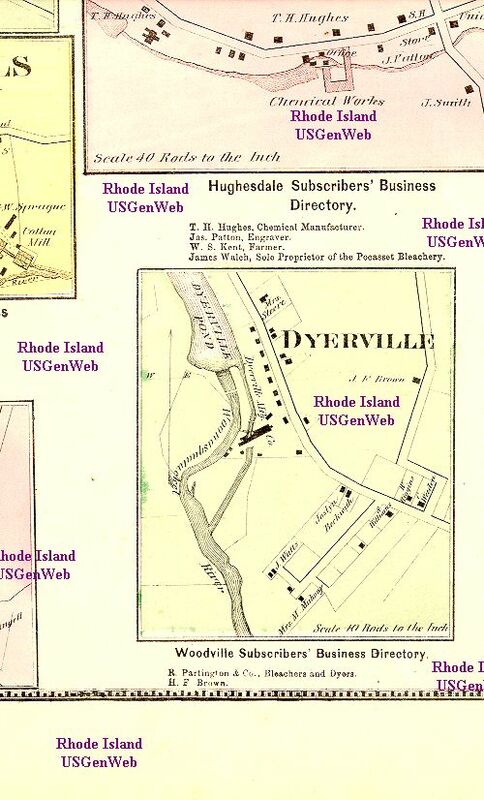 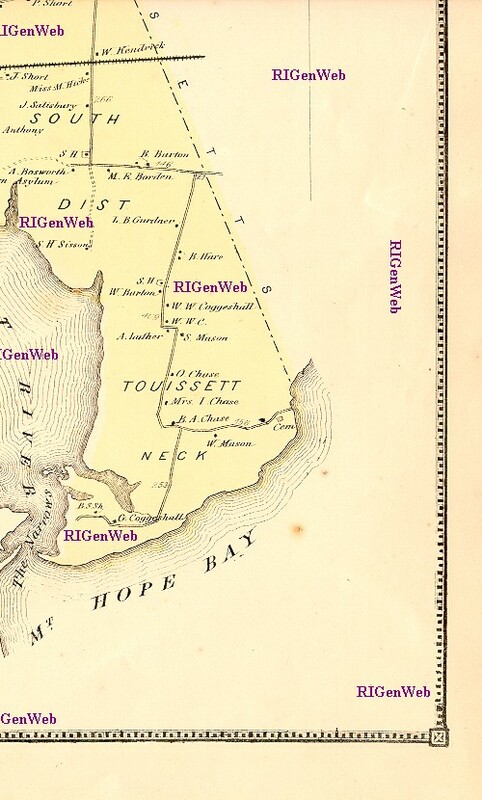 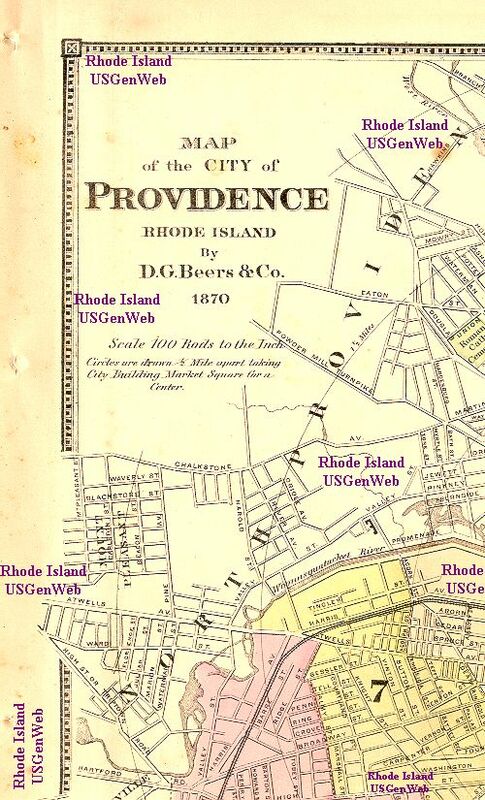 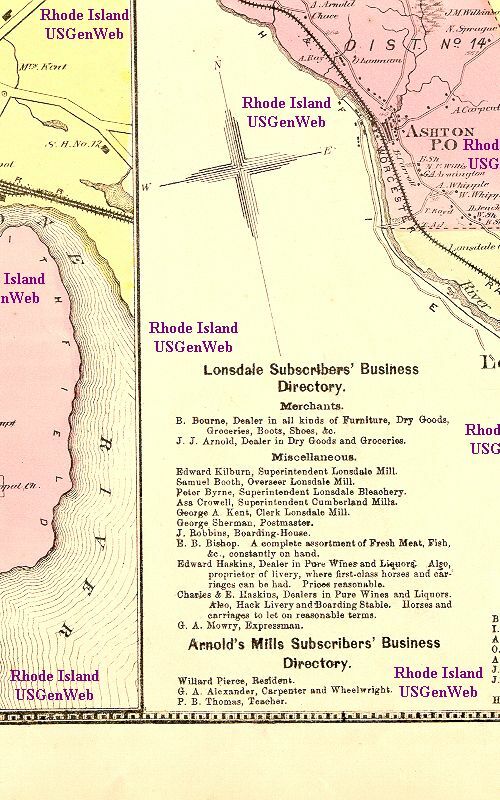 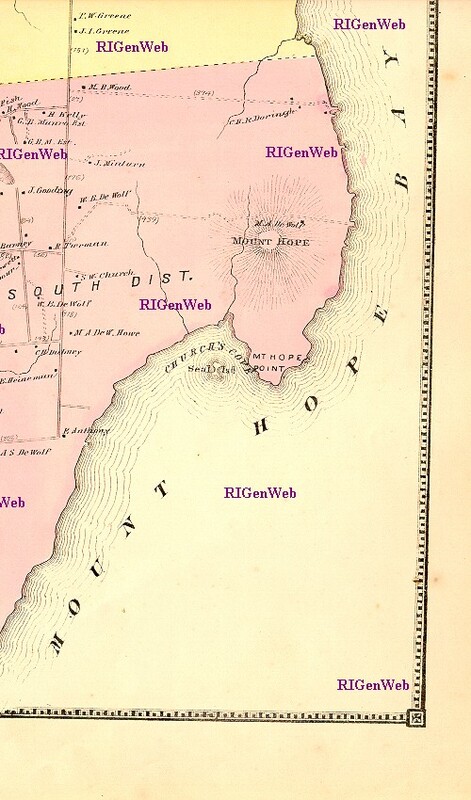 Rhode Island in 1902, from the 9th edition of The Encyclopedia Britannica, copyright by Rand McNally, in two sections. 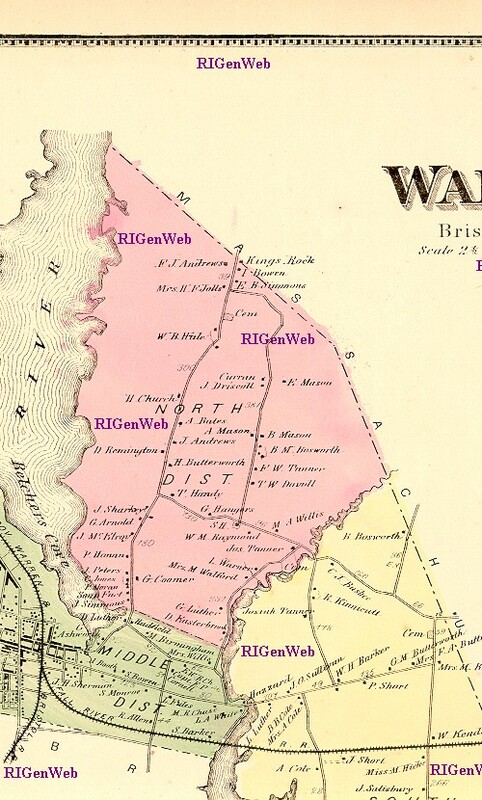 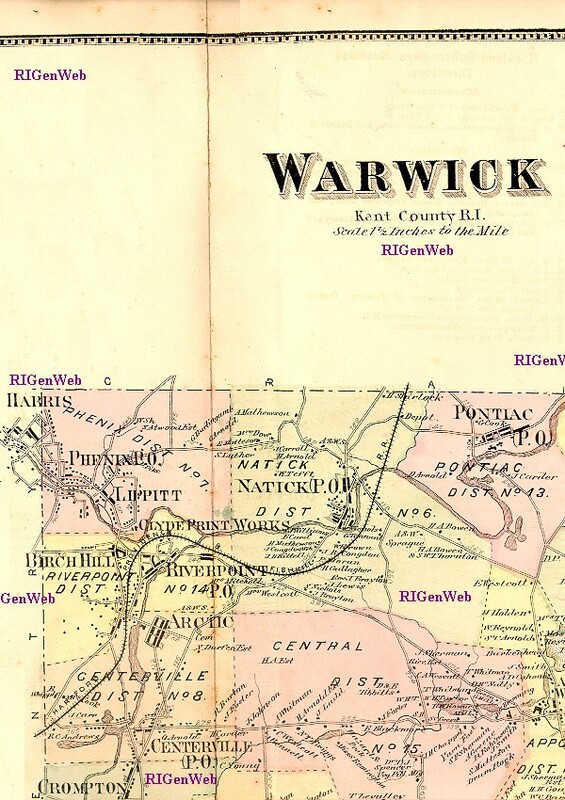 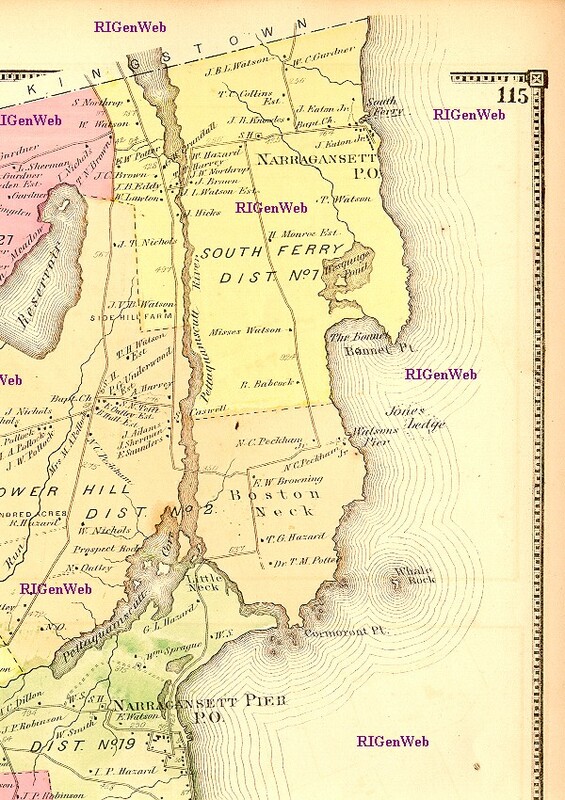 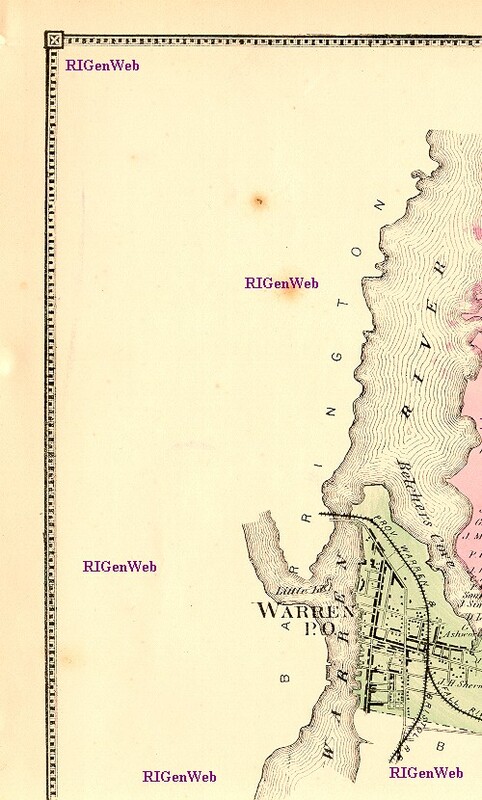 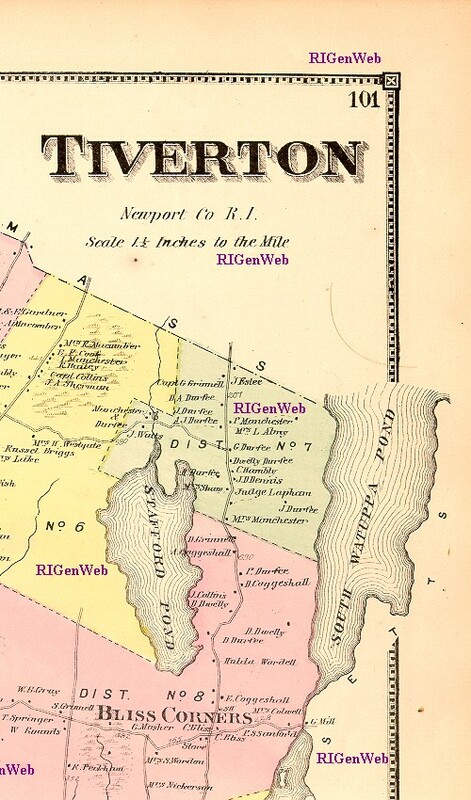 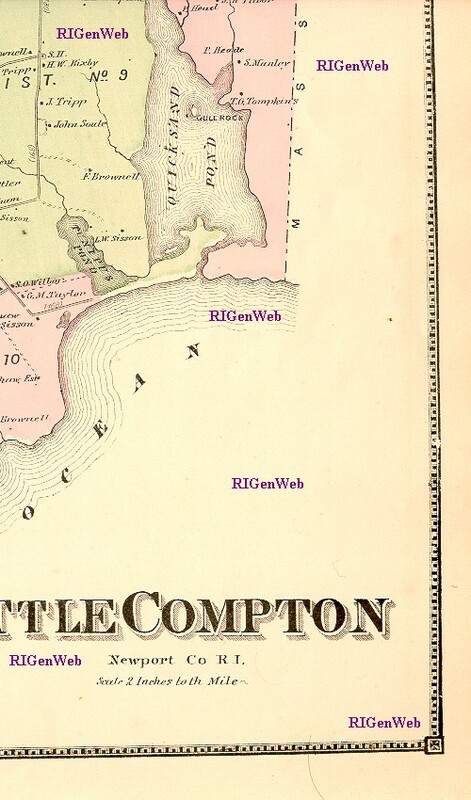 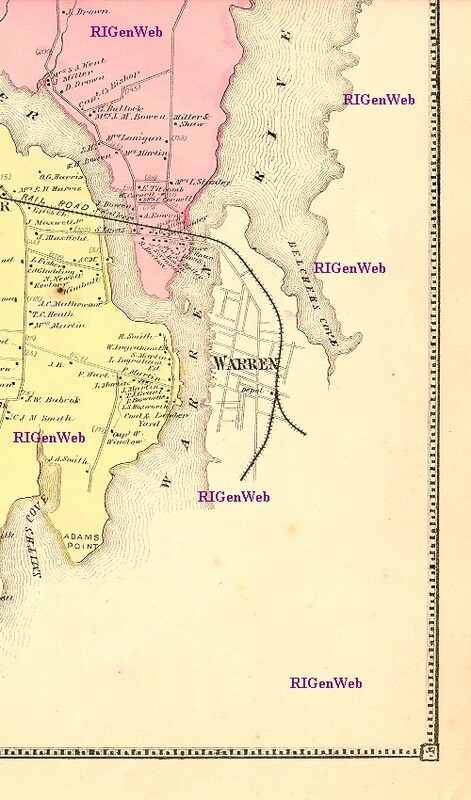 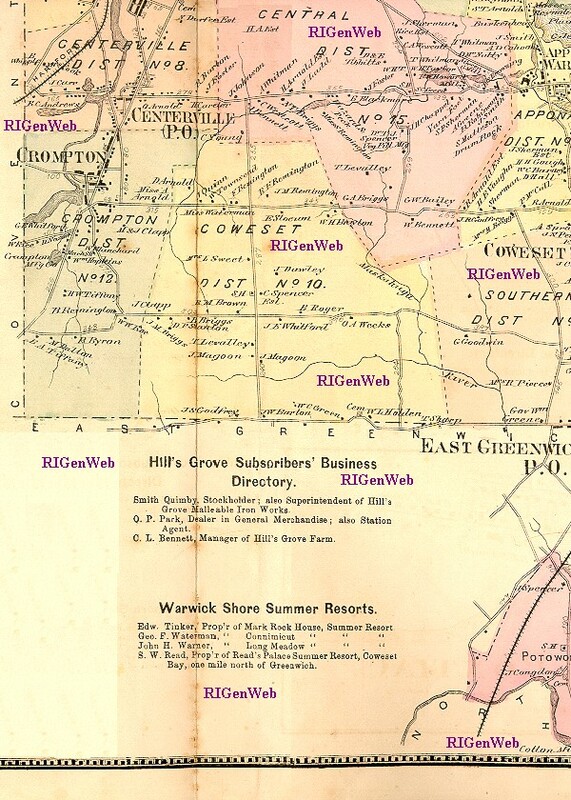 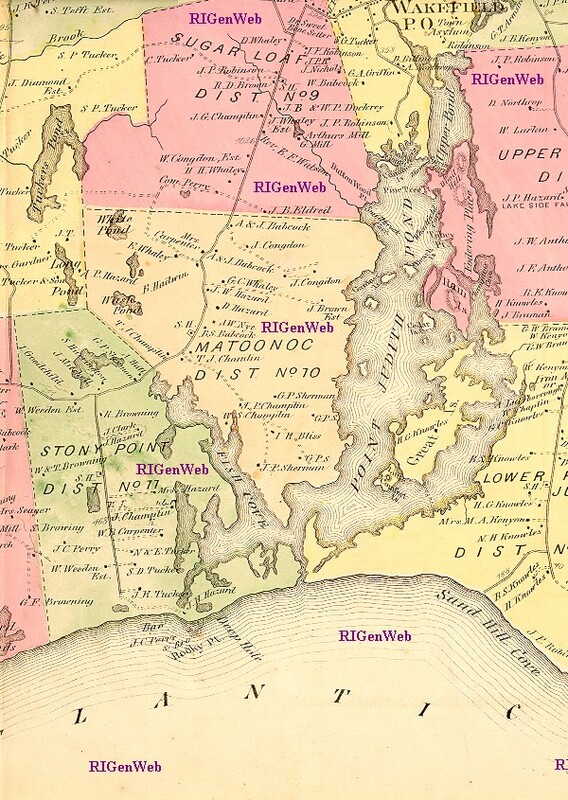 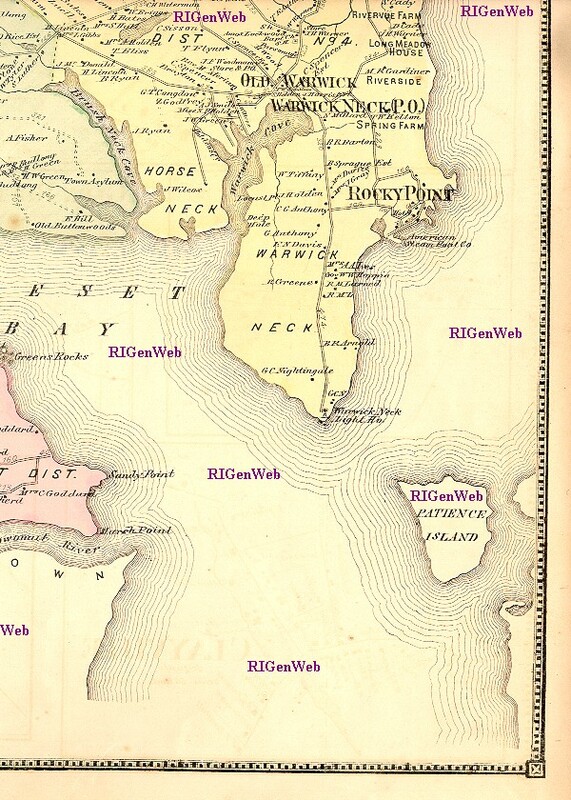 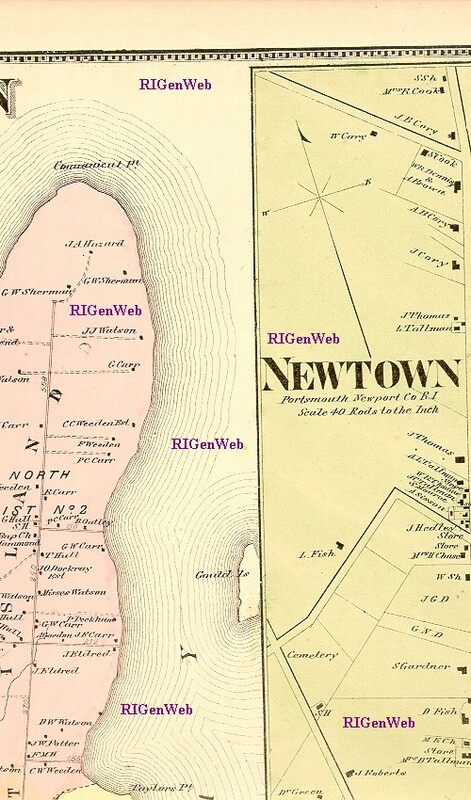 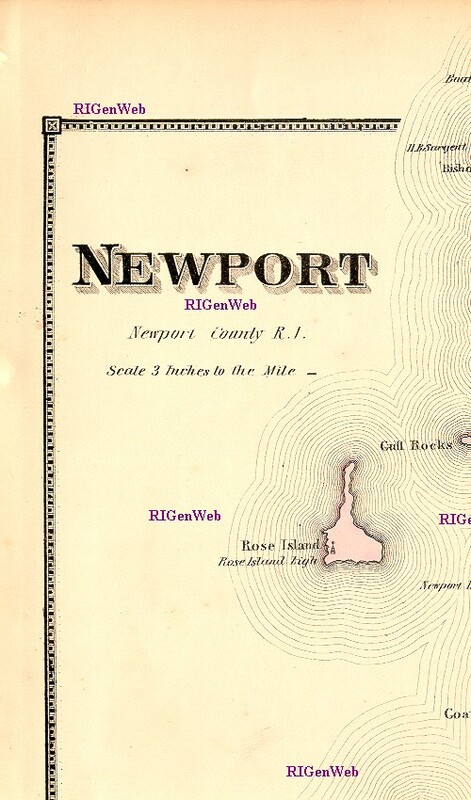 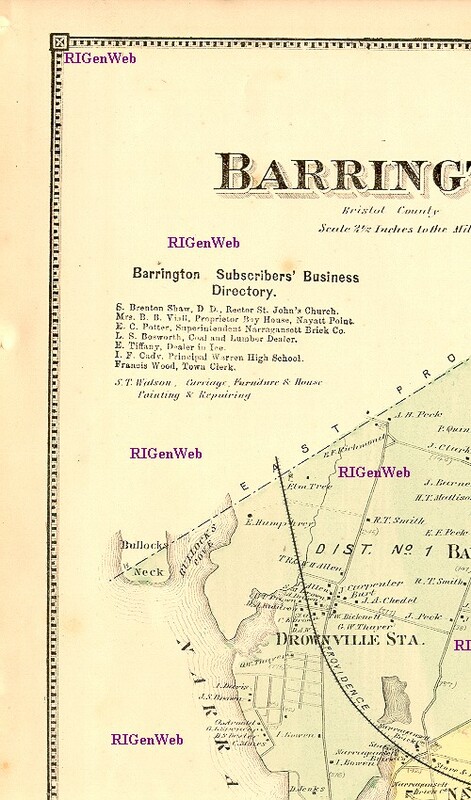 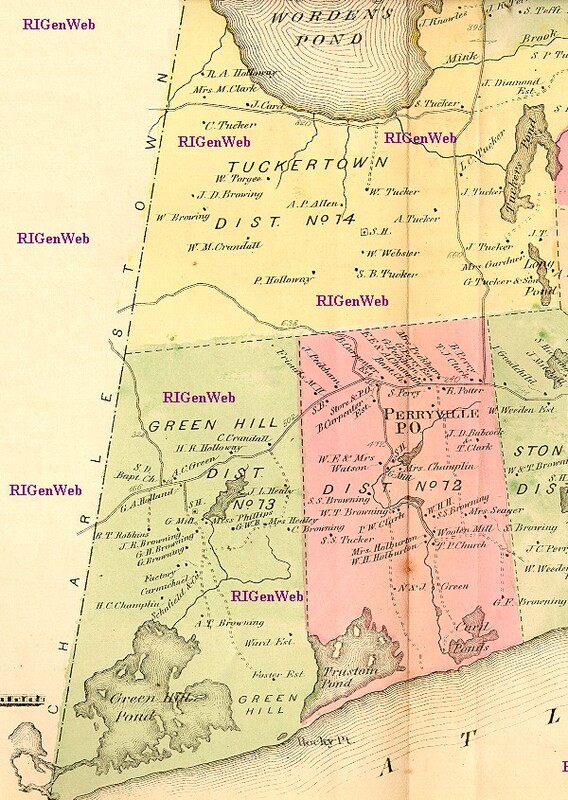 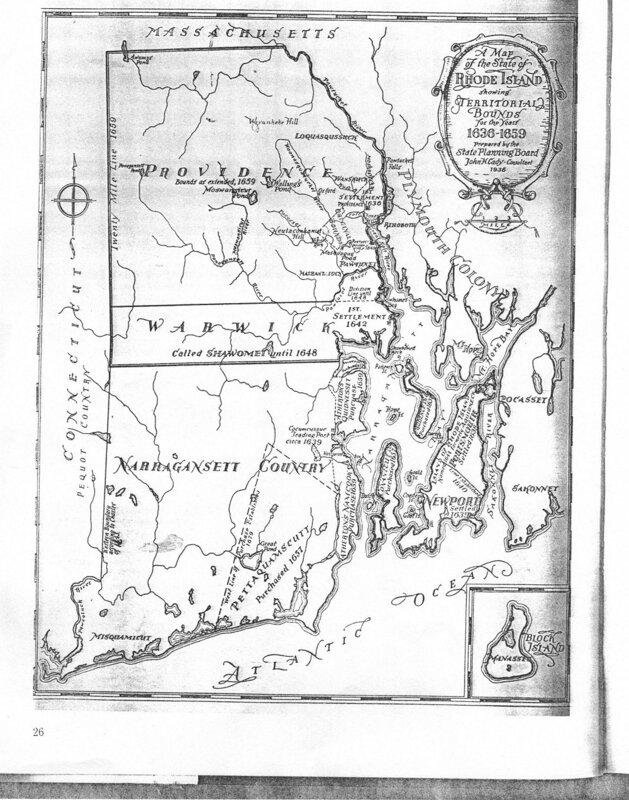 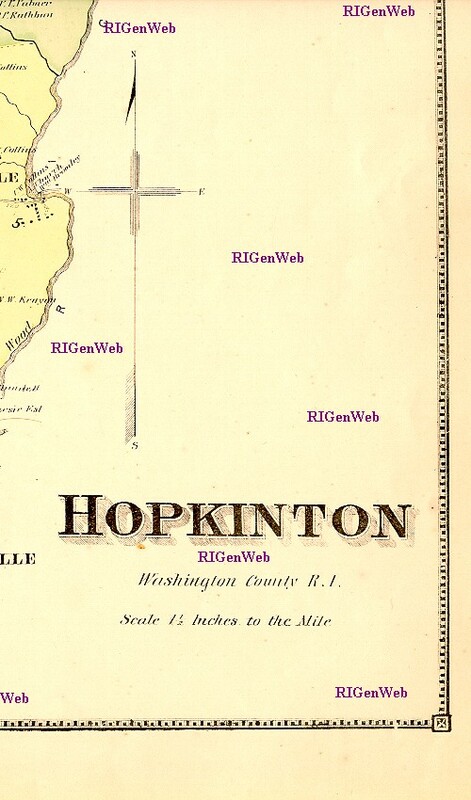 Note that Block Island is now part of Washington County, not Newport. 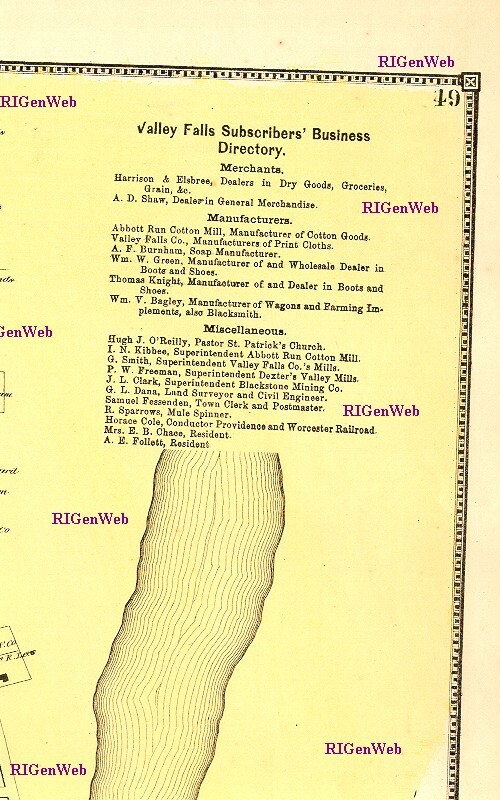 Center section enlarged (provided by Sam Behling) to show the names - 295kb. 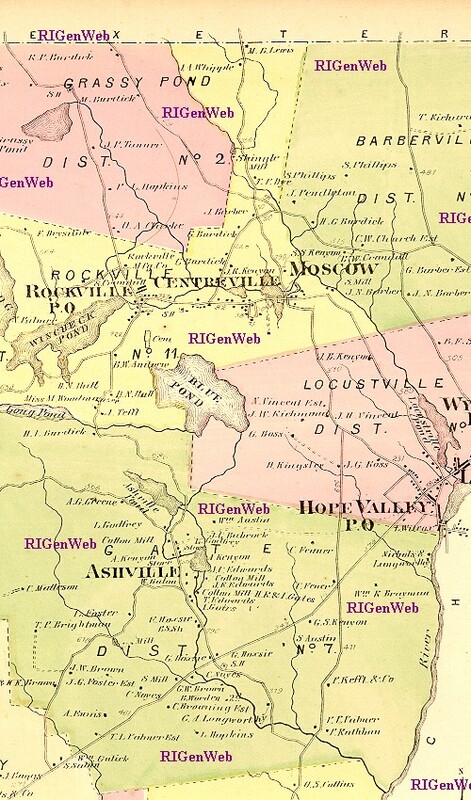 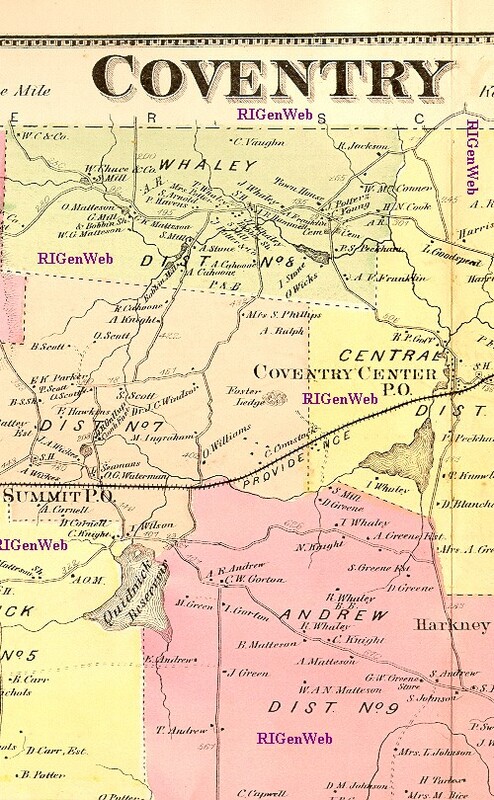 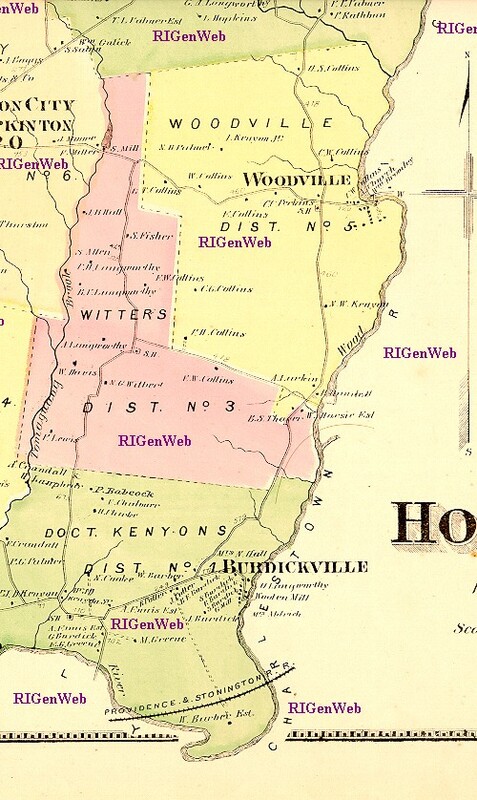 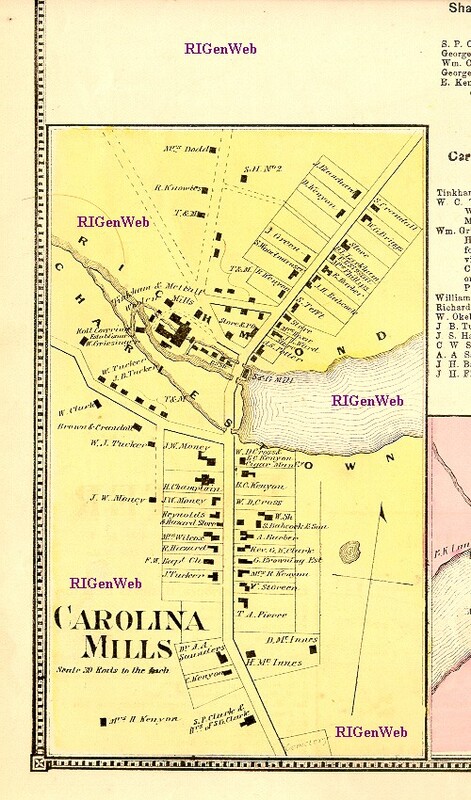 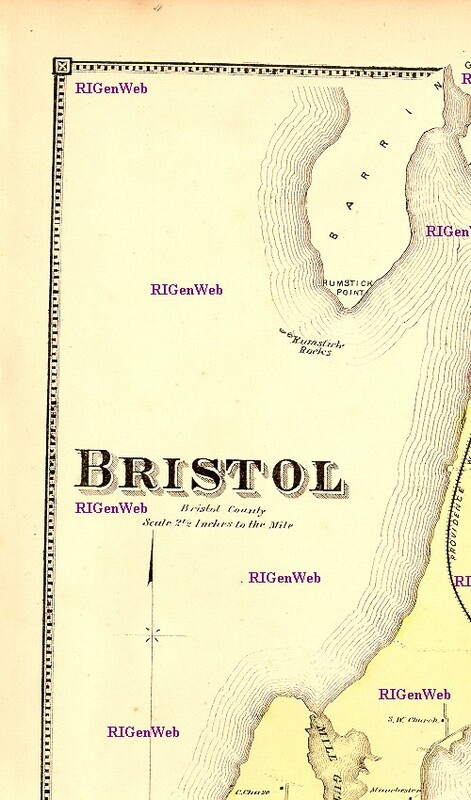 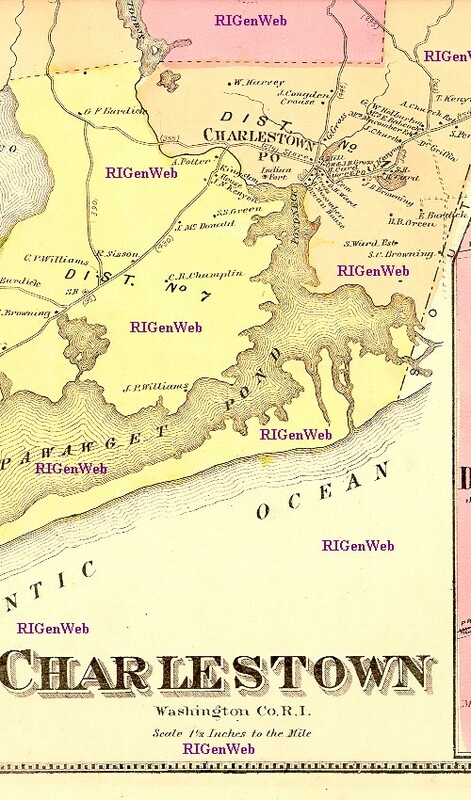 Names on the map are (in order from top): Gregory Dexter; Matthew Waller; Thomas Painter; Edward Manton; John Greene, Jr.; Benedict Arnold; Francis Wickes; William Arnold; Thomas James; John Greene, Sen.; John Smith; Widow Reeve; Joshua Verin; Roger Williams; John Throckmorton; William Harris; Alice Daniels; John Sweet; William Carpenter; Robert Cole; Thomas Olney; Thomas Angell; Francis Weston; Richard Waterman; Ezekiel Holyman; Stukely Westcott; William Reynolds; Daniel Abbot; Chad Brown; John Warner; George Rickard; Richard Scott; William Field; John Field; Joshua Winsor; Thomas Harris; Adam Goodwin; William Burrows; William Mann; William Wickenden; Nicholas Power; Widow Tiler; Widow Sayer; Thomas Hopkins; Edward Hart; Matthew Weston; John Lippitt; Hugh Bewit [Bewitt]; William Hawkins; Christopher Unthank; Robert Williams. 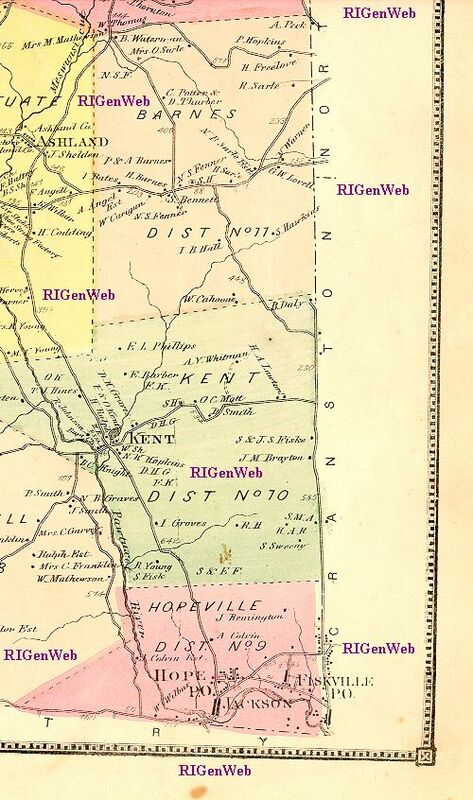 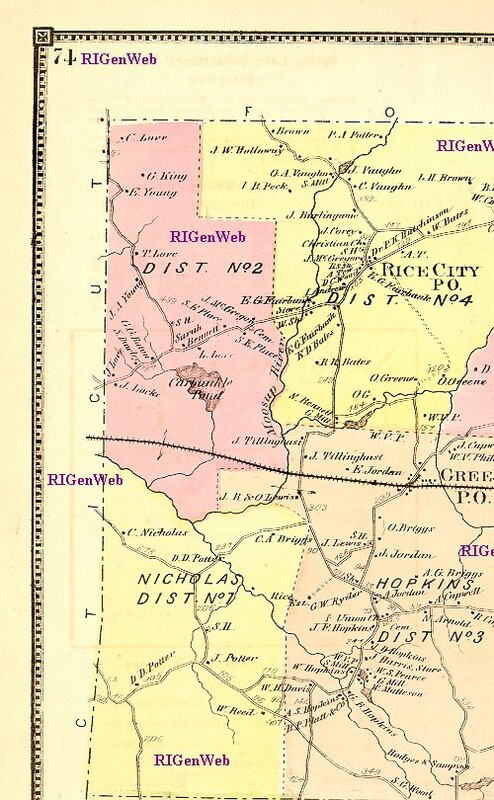 From the 9th edition of The Encyclopedia Britannica, copyright by Rand McNally 1902. 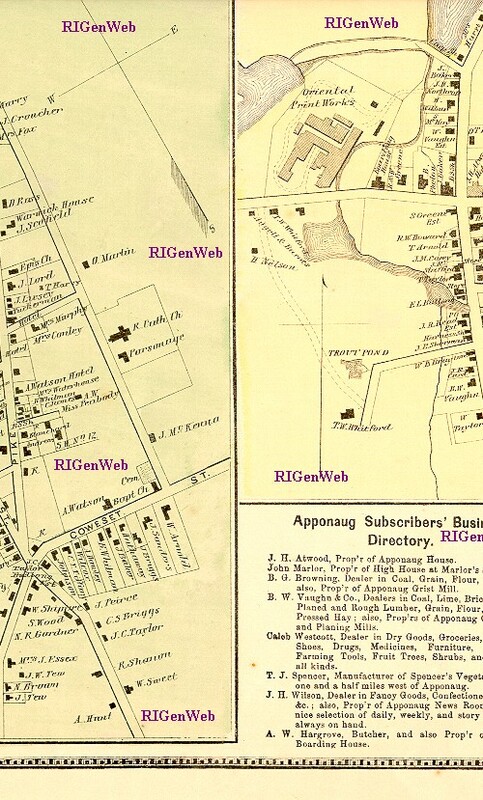 These maps show both the geographic features of an area, as well as the locations and names/owners of many of the homes and stores. 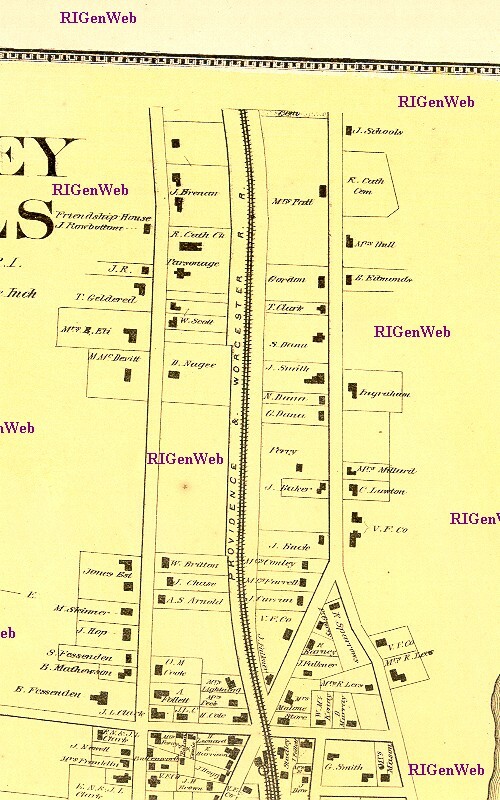 As a result, they are invaluable as a genealogy tool. 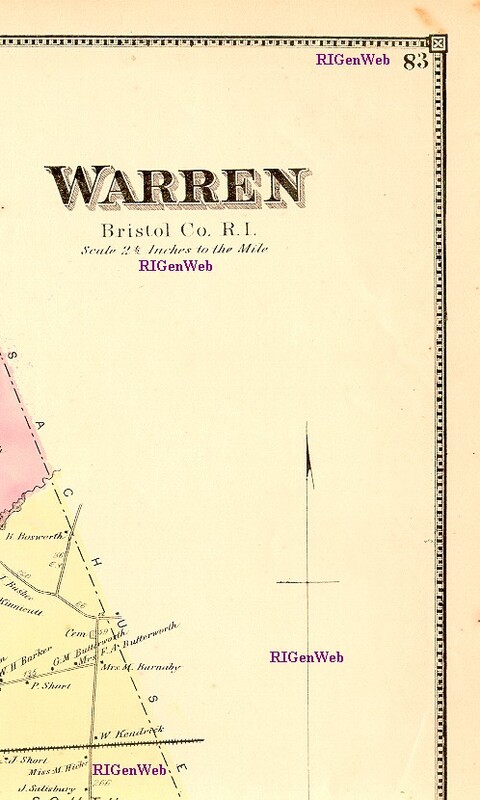 NOTE: All maps are scanned in overlapping sections in a width that can be printed on 8 1/2 wide paper, but may be longer than 11". 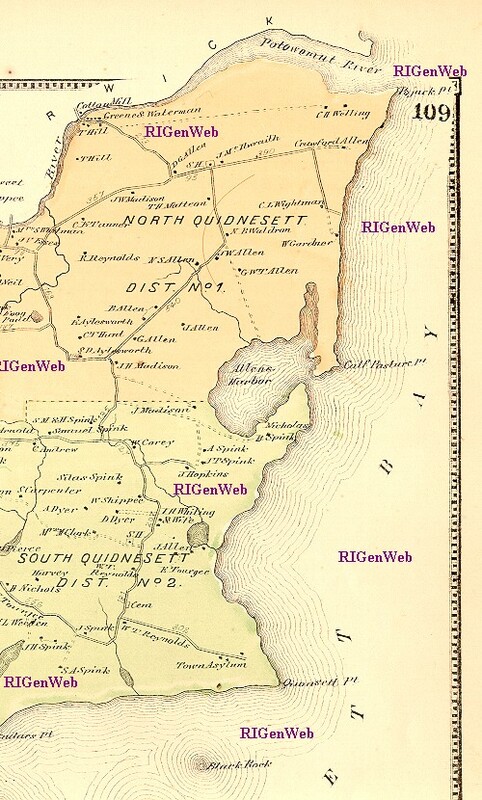 For best results, save the images and print from an imaging program, rather than your browser. 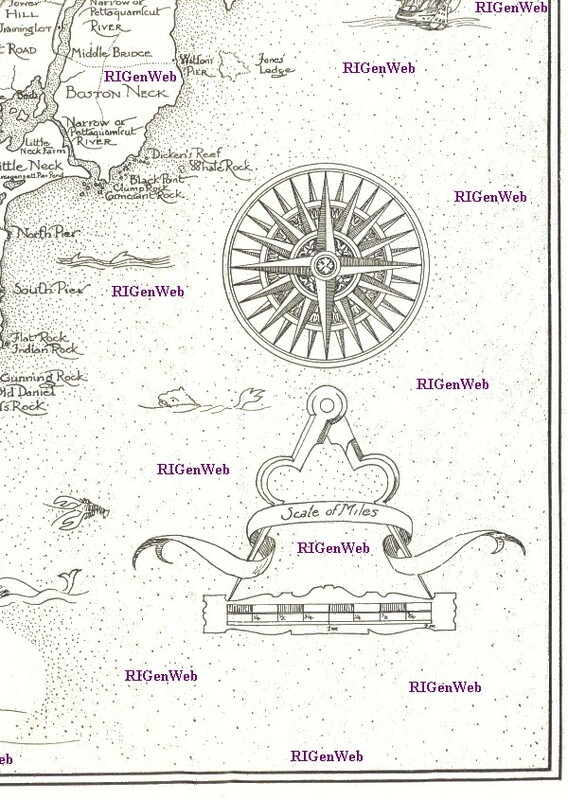 The scans are numbered beginning at the top left corner and moving across to the right. 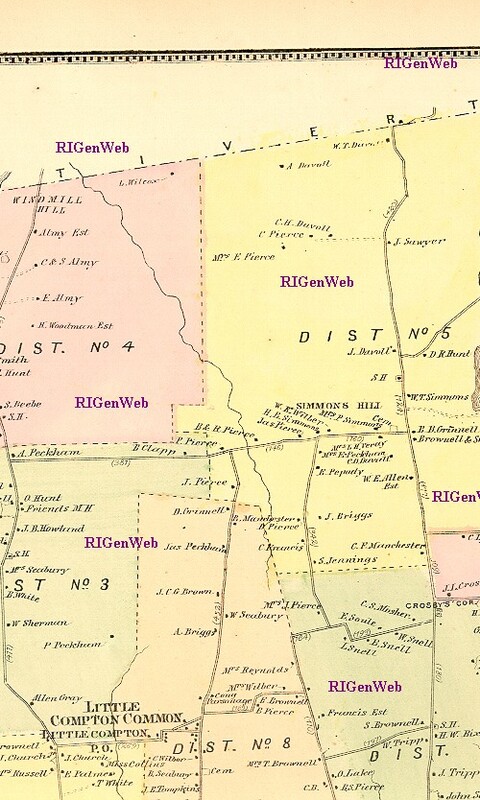 The next row begins again at the left. 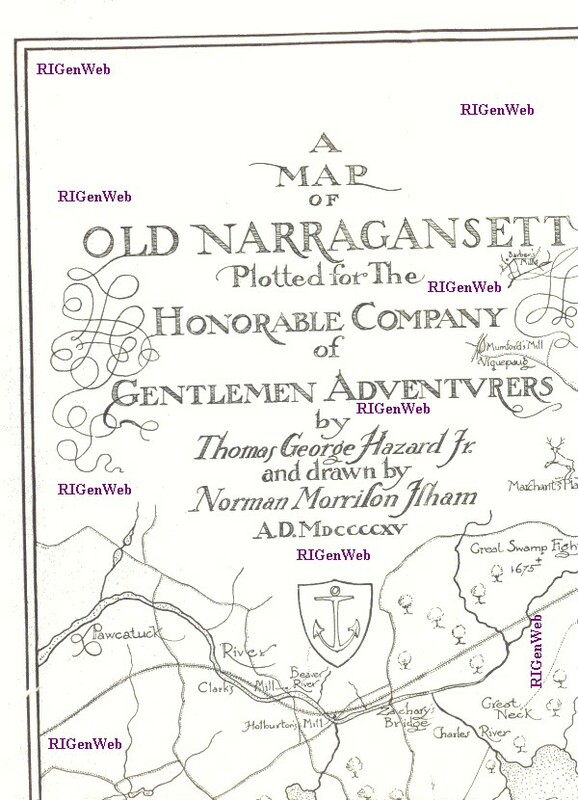 For a map that is the size of the book (14" by 16") there will be three sections across for a wide map, and three sections across and two down (six total) for a long map. 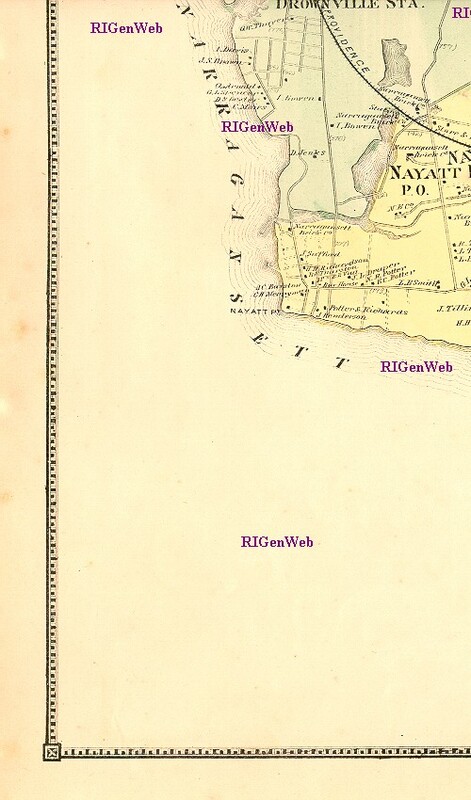 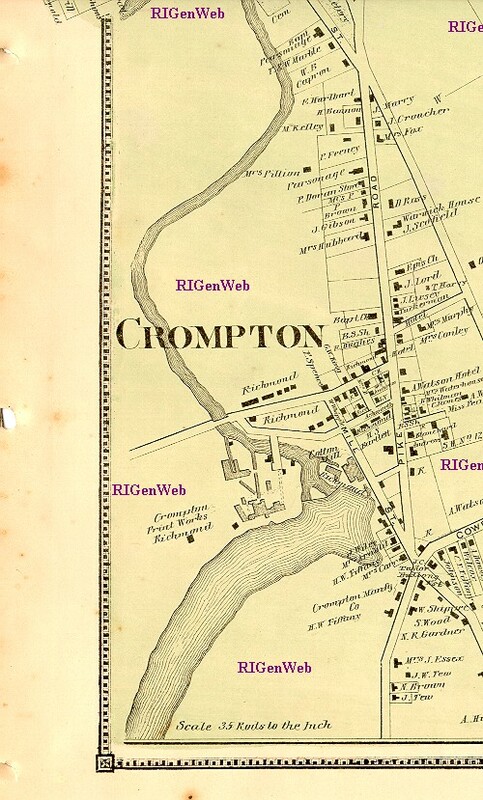 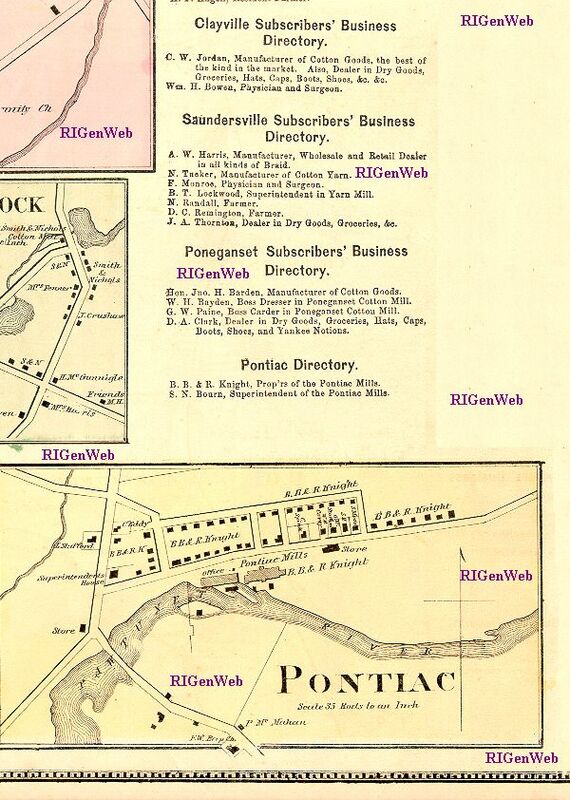 In order to make the maps legible they have been scanned at full size with a minimal amount of compression. 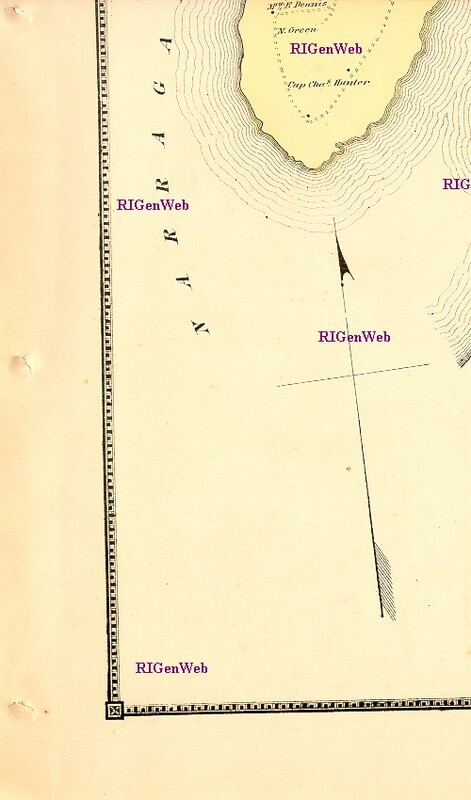 As a result, they will take time to load. 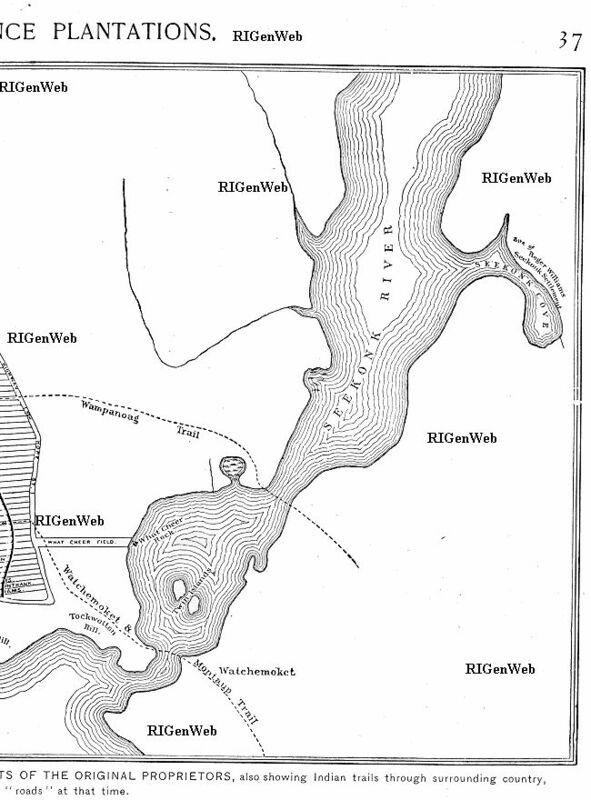 Each map, and section of map, has it's own scale. 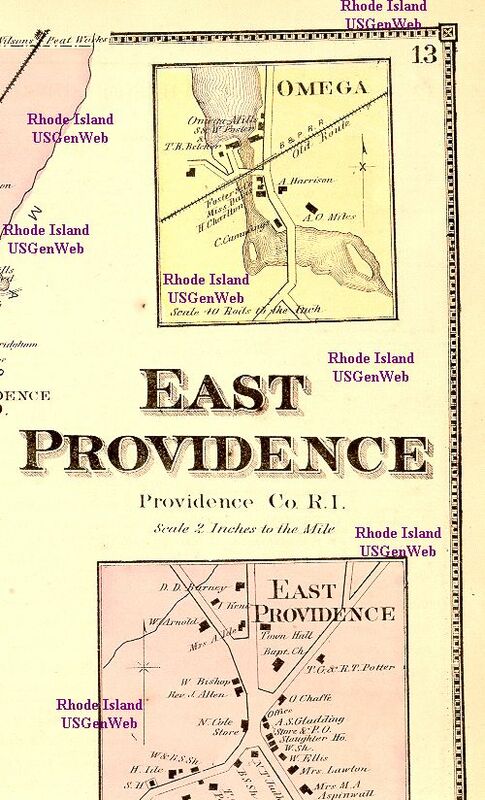 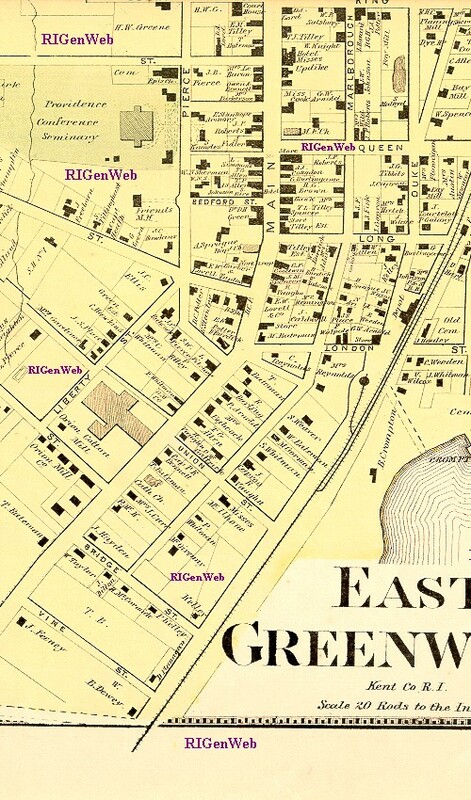 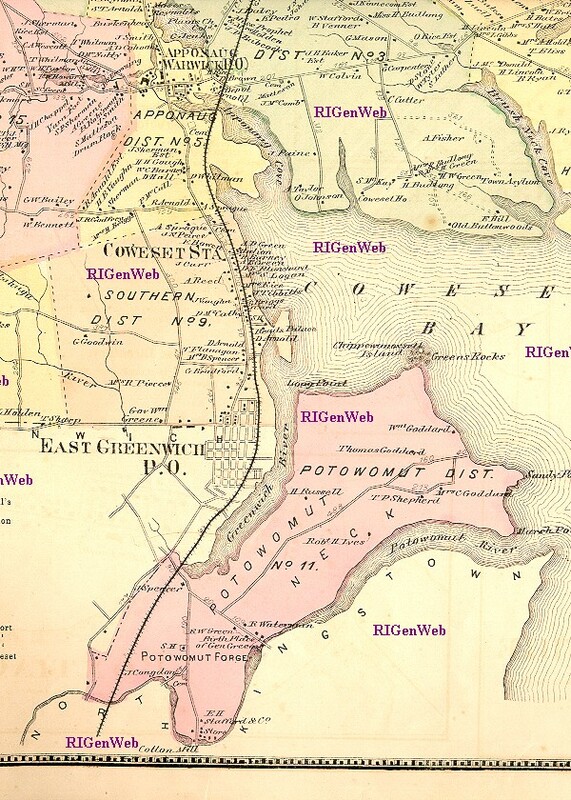 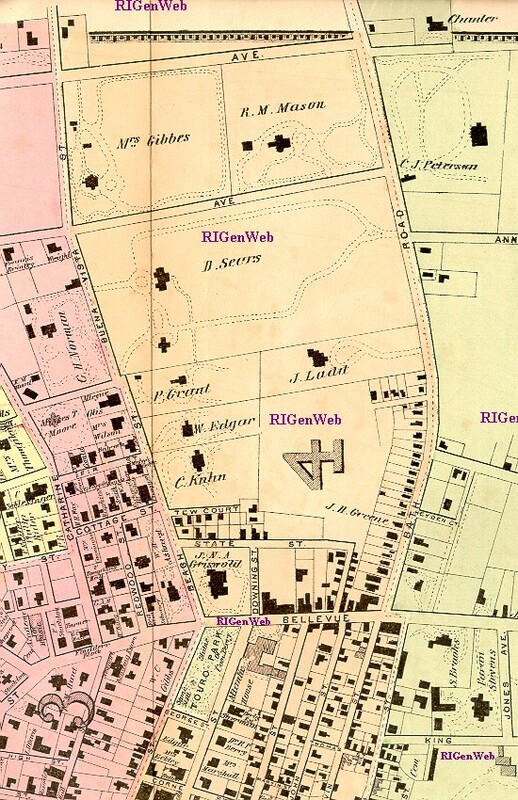 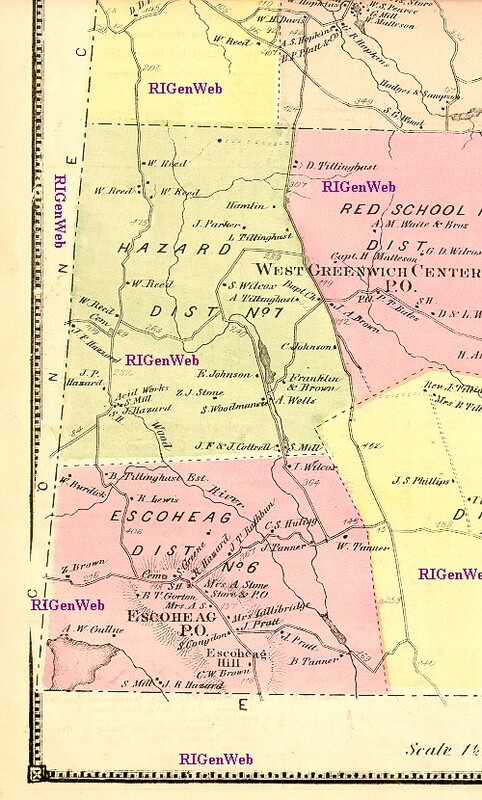 List of names in each section of the East Providence Map: Section 1; Section 2; Section 3; Section 4; Section 5; Section 6. 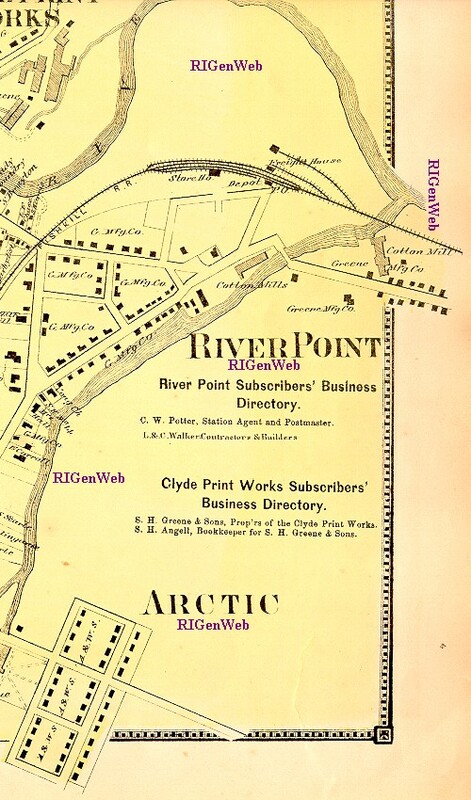 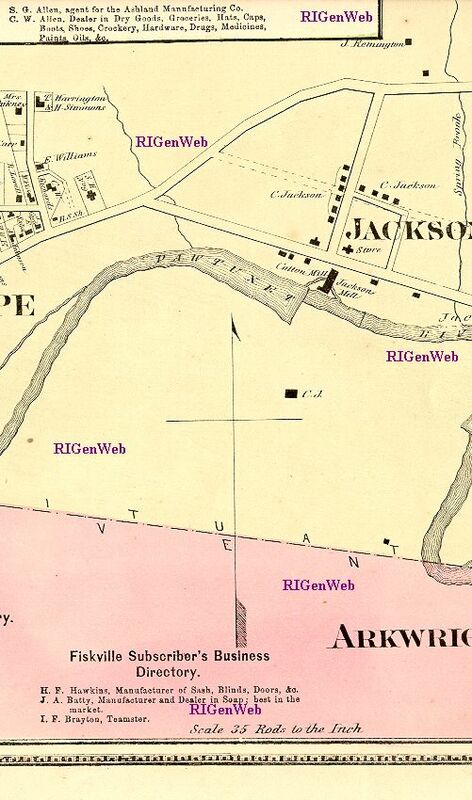 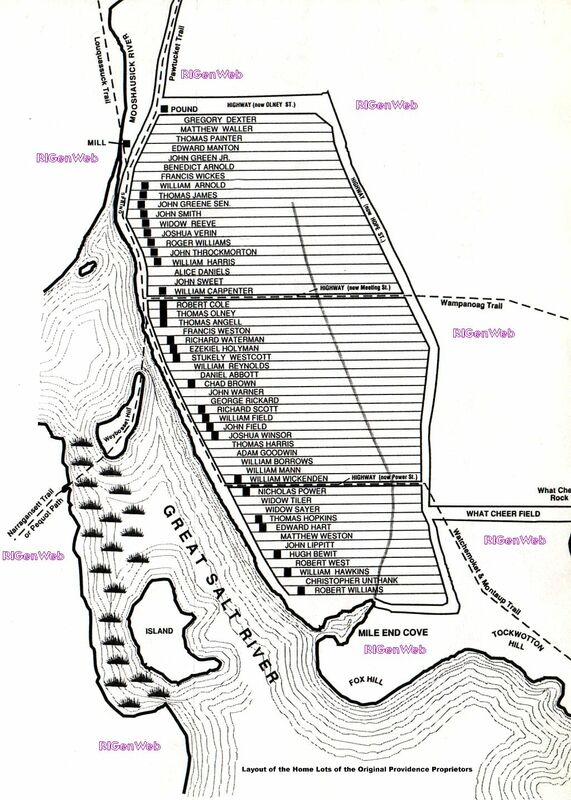 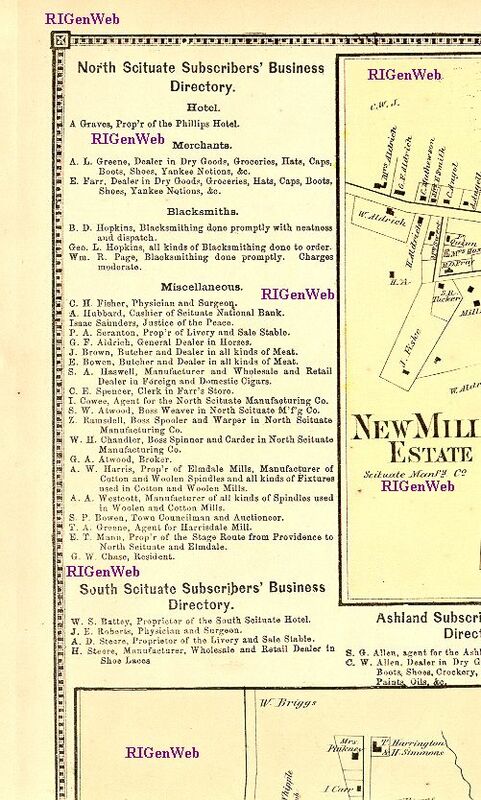 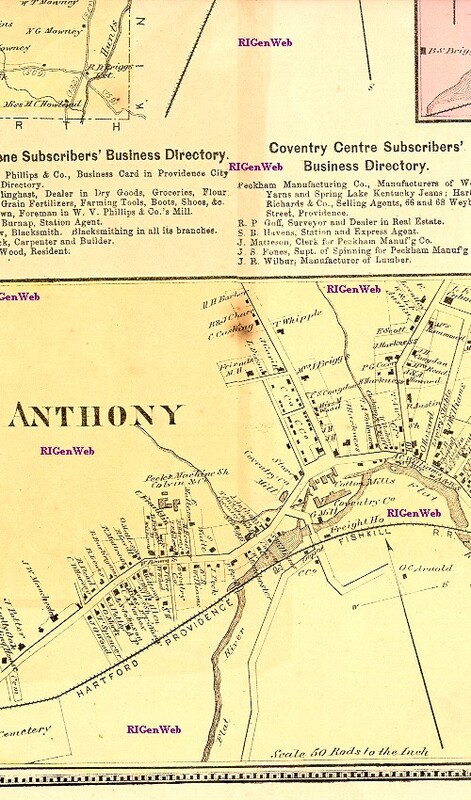 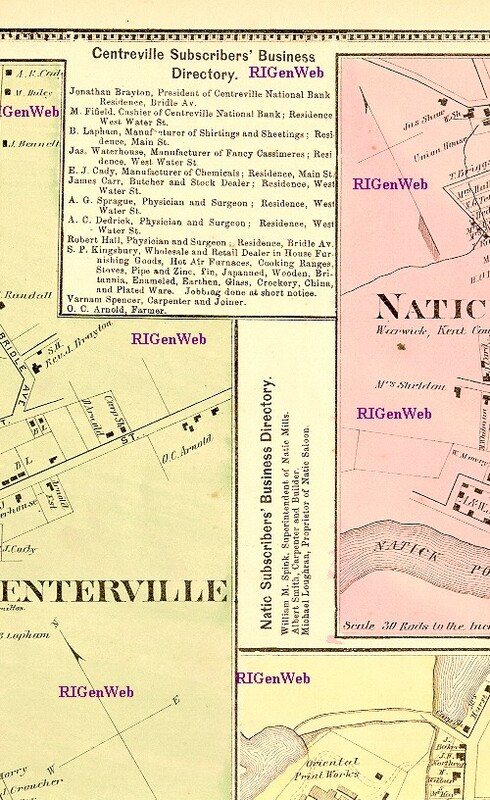 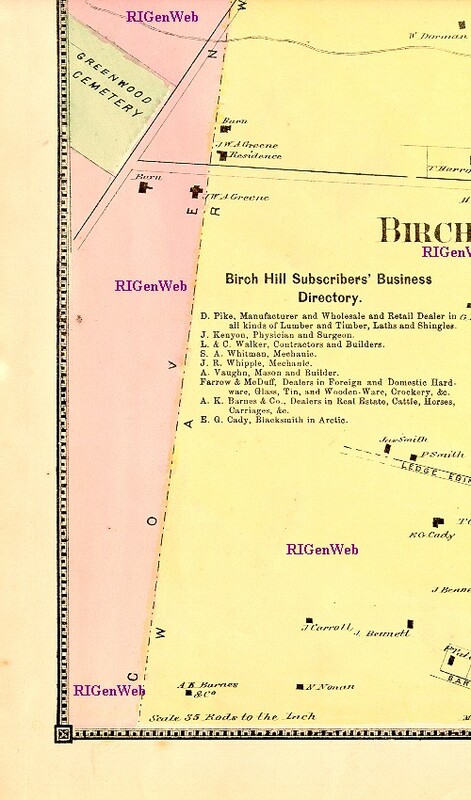 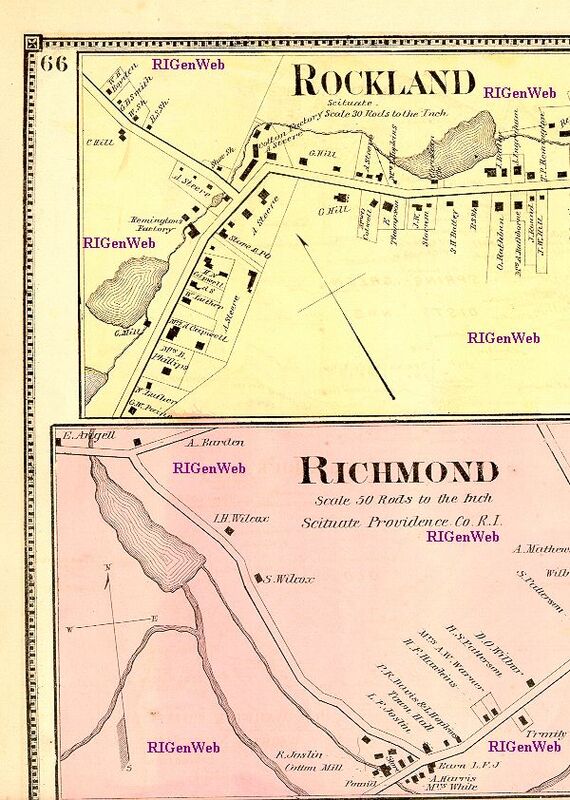 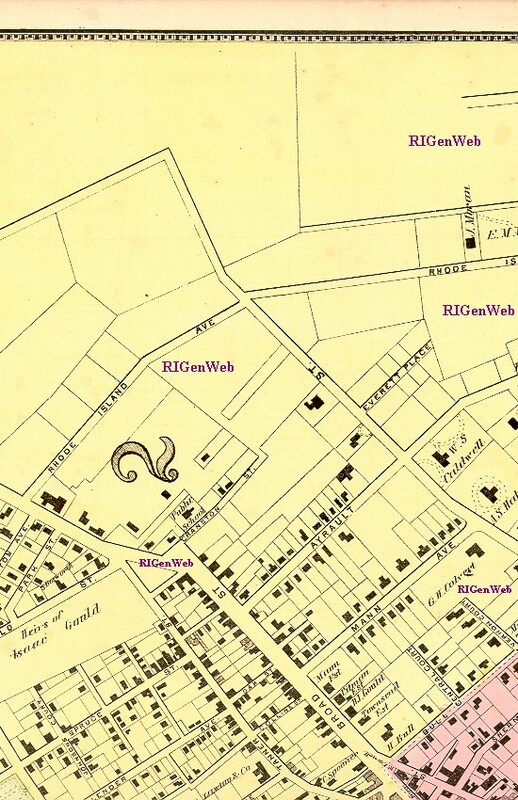 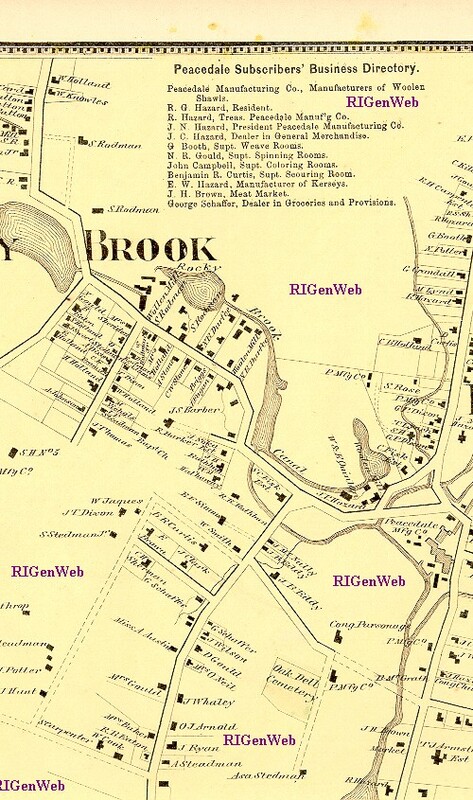 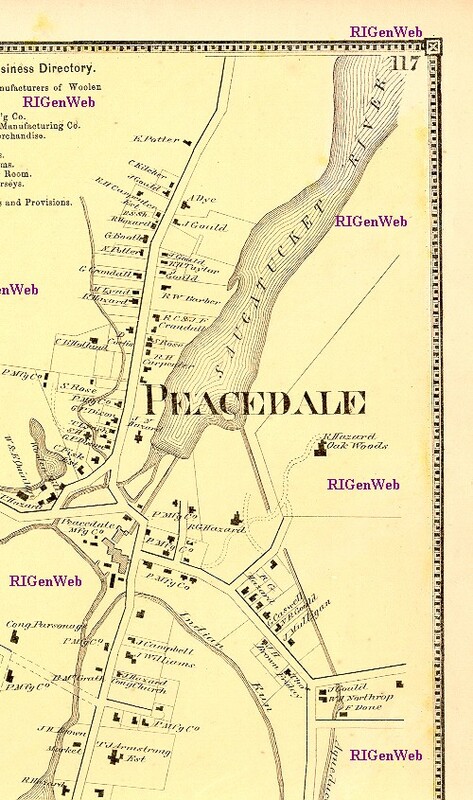 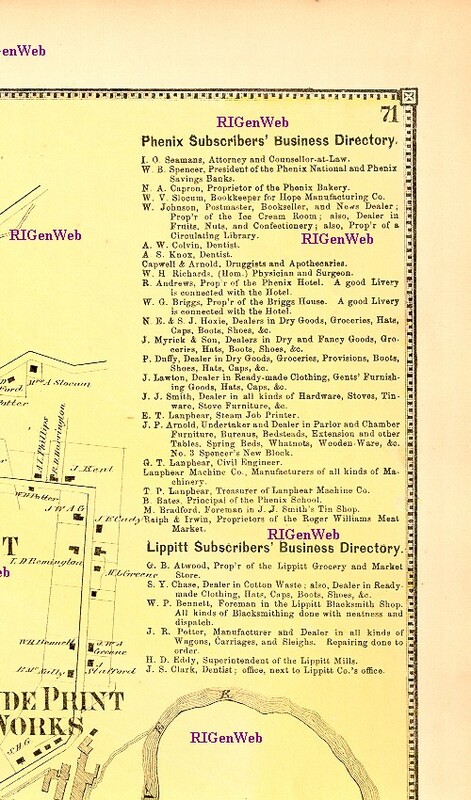 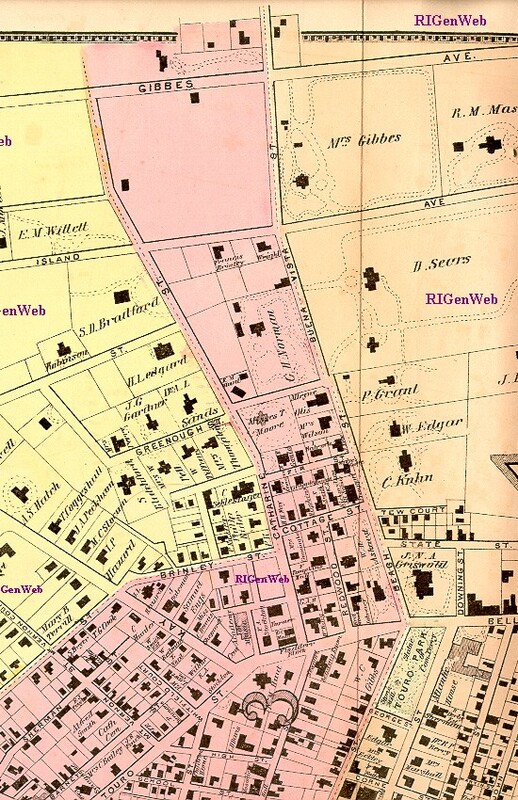 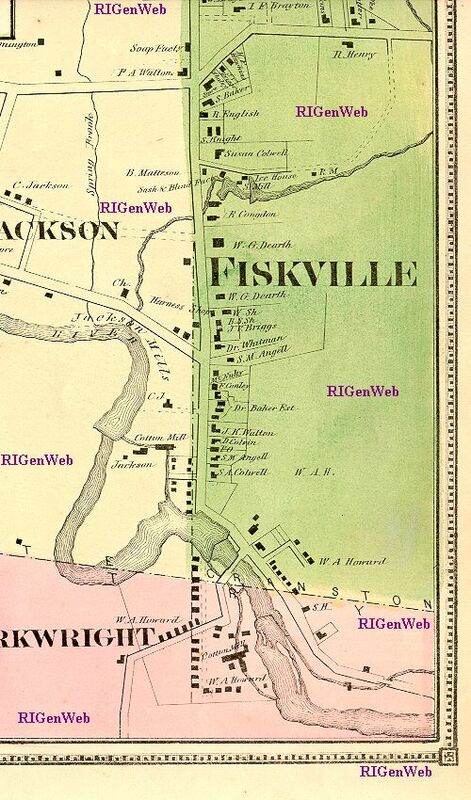 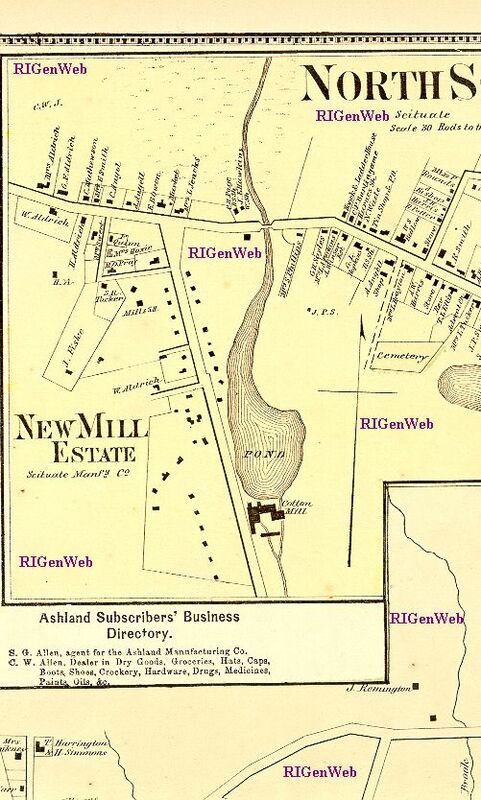 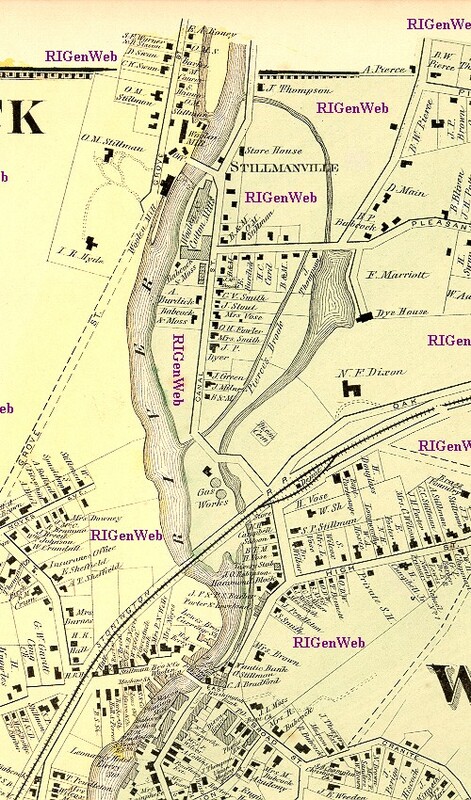 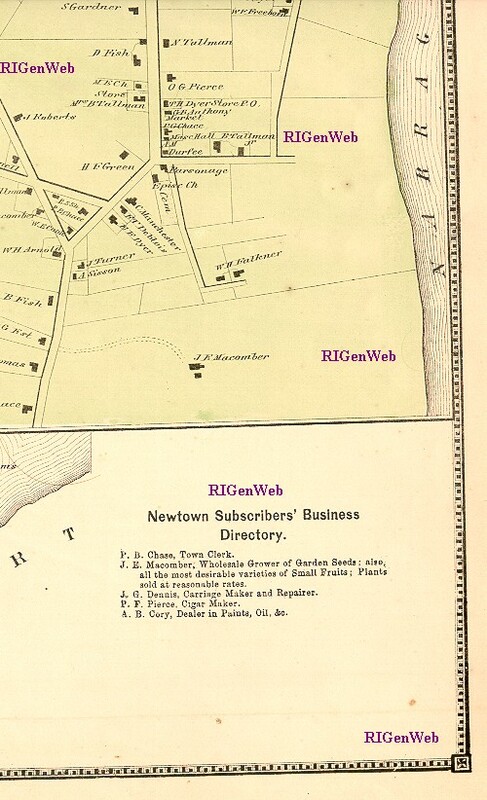 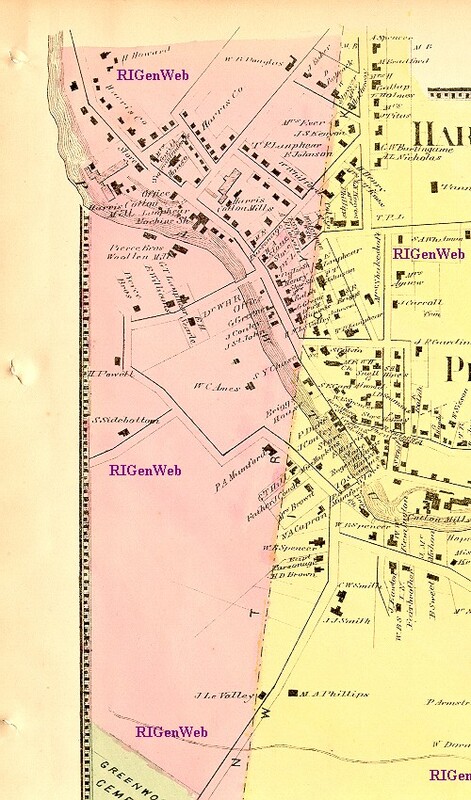 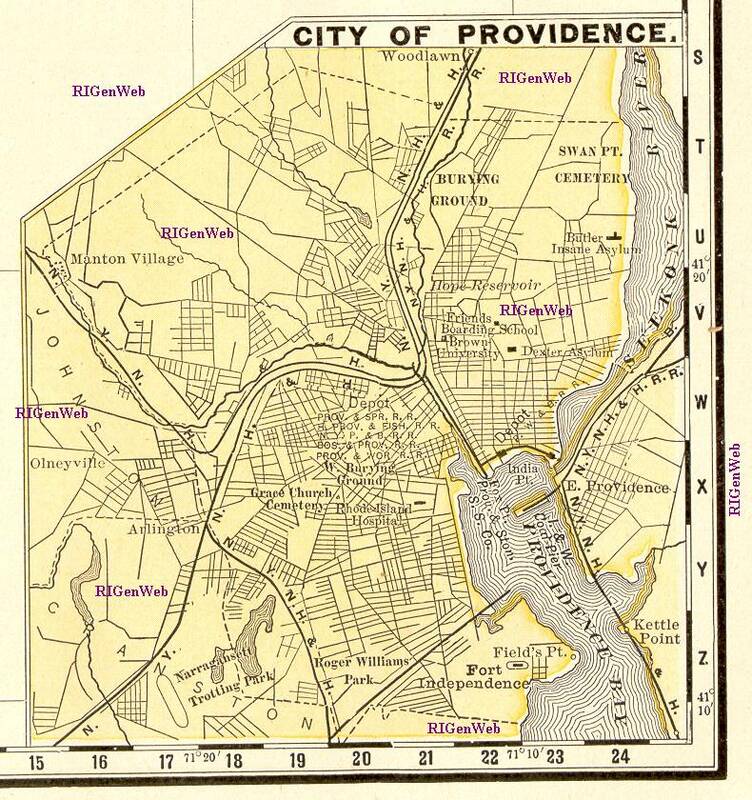 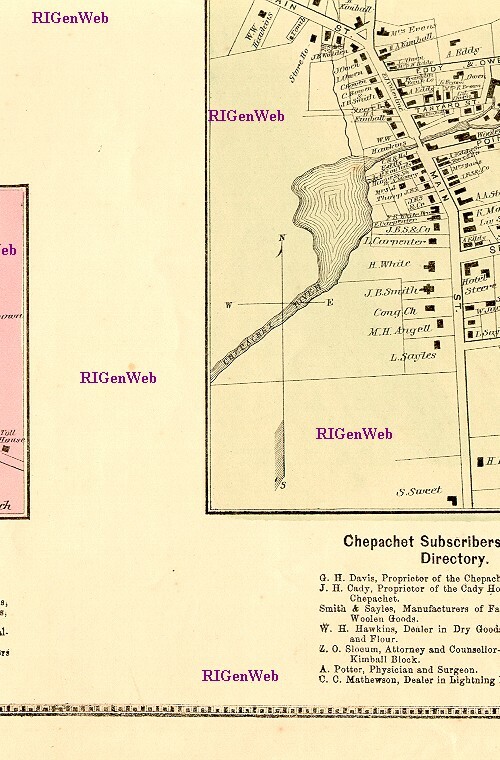 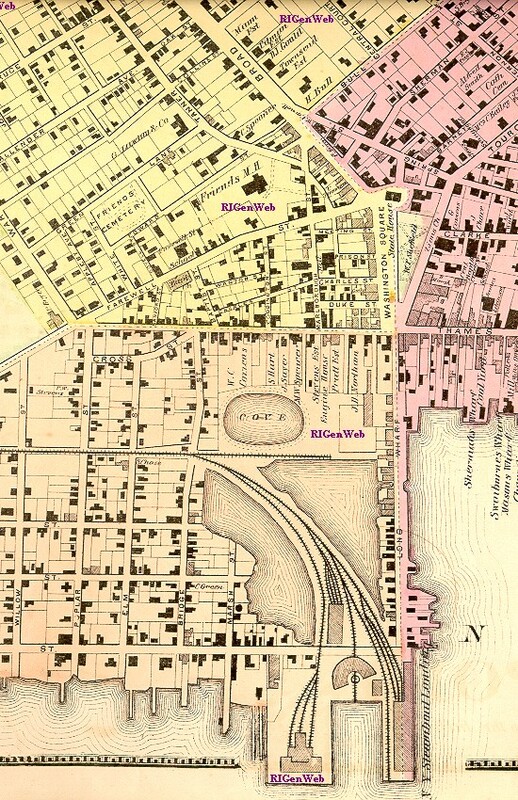 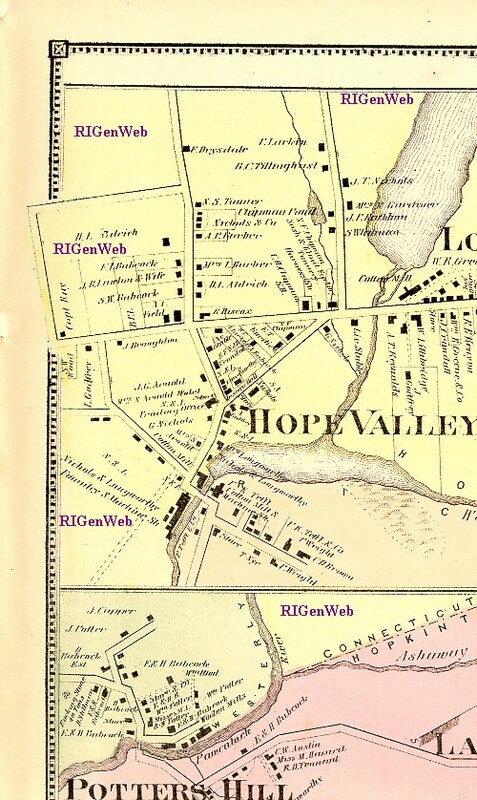 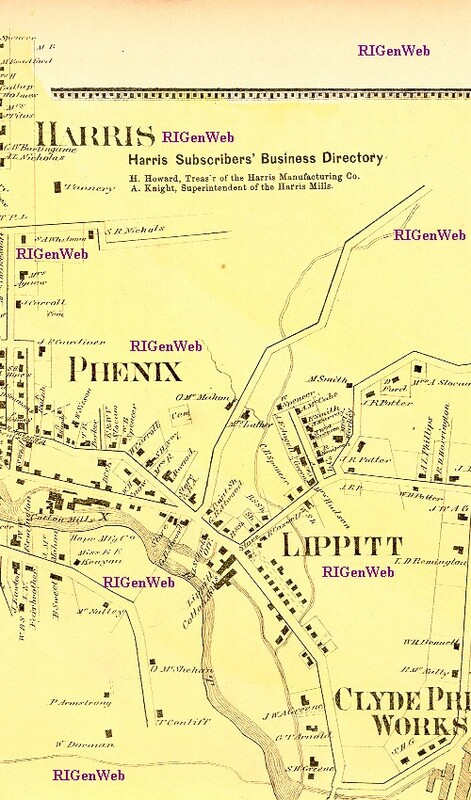 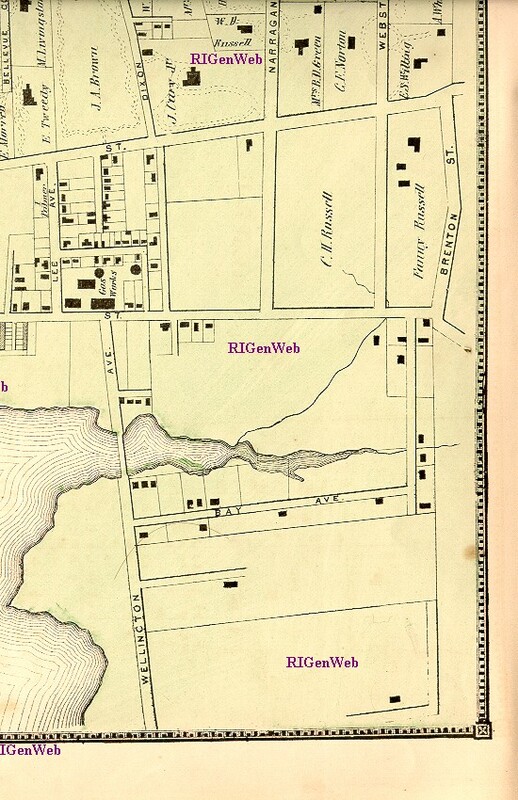 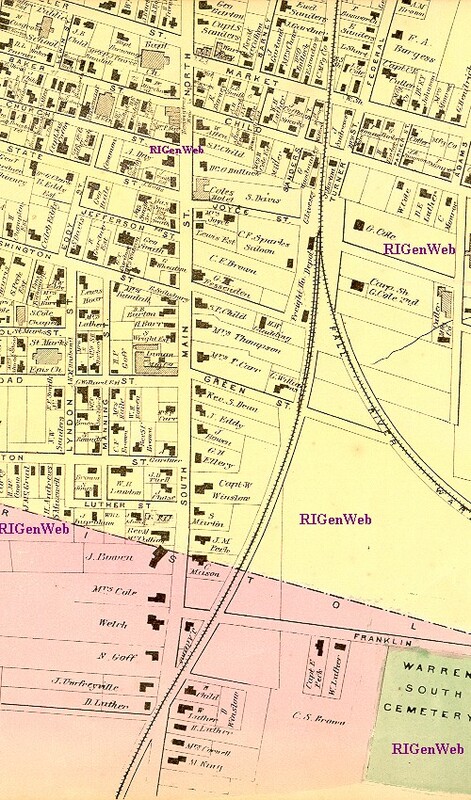 List of names in each section of the North Providence Map: Section 1; Section 2; Section 3. 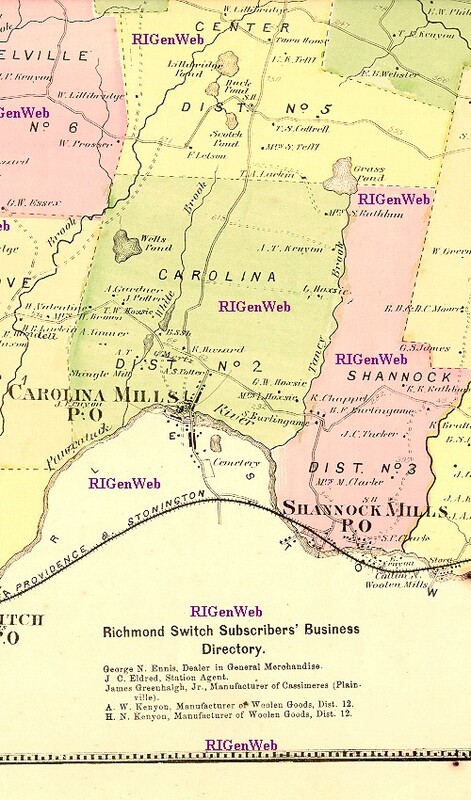 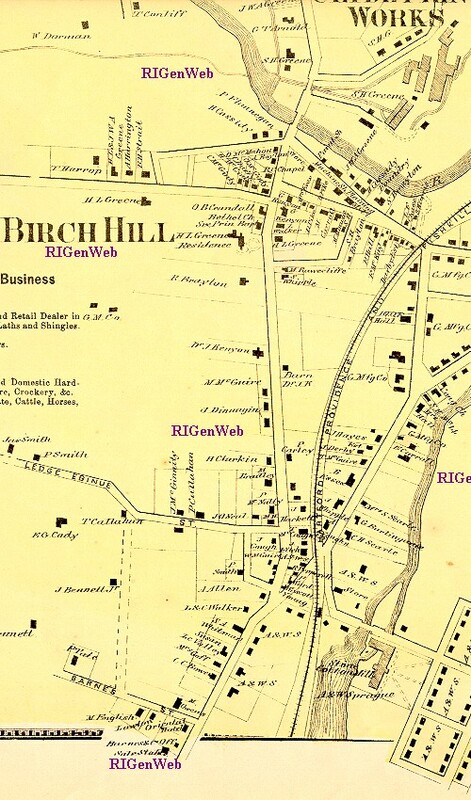 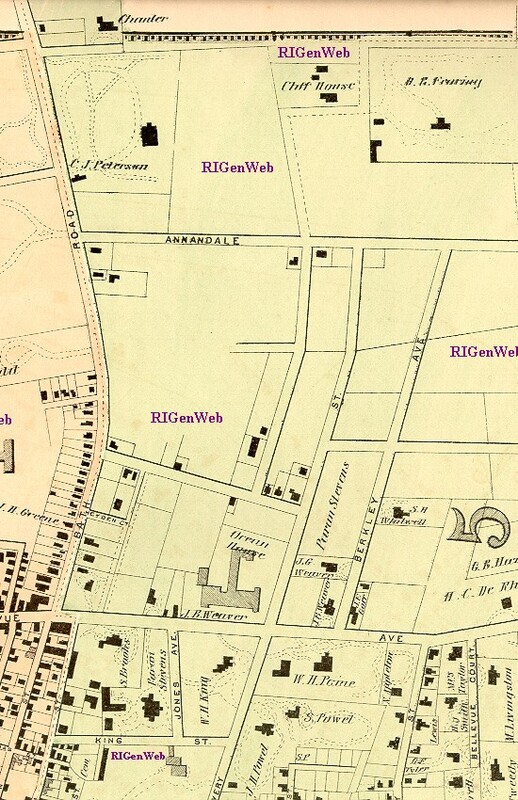 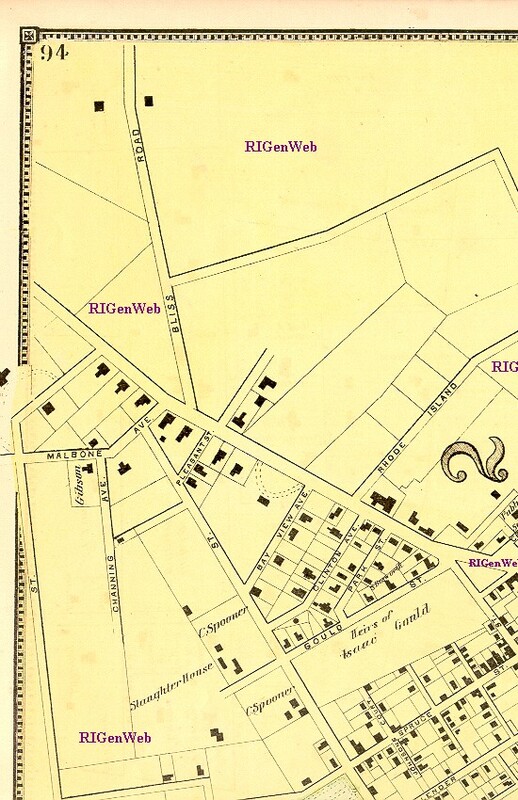 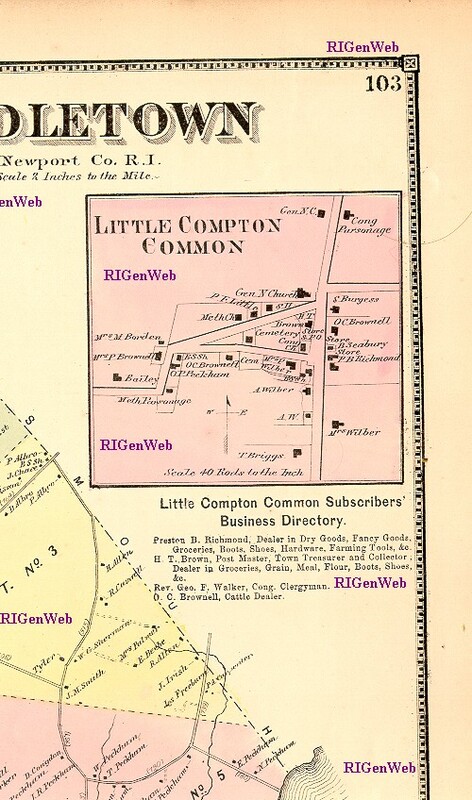 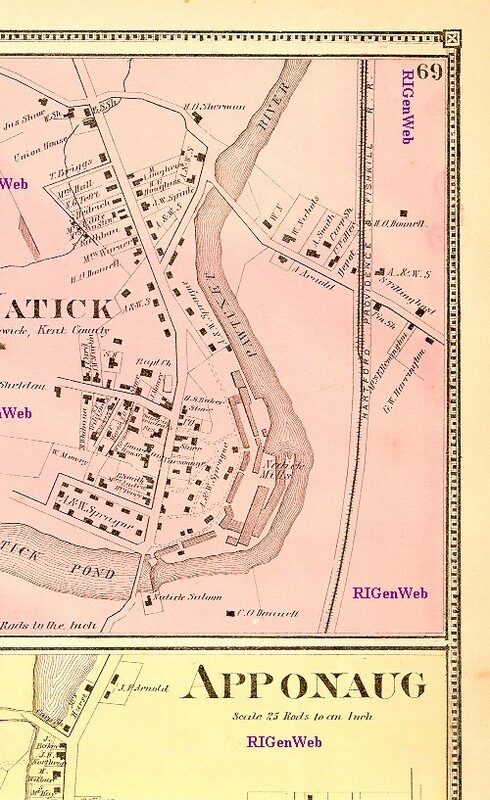 List of names in each section of the Smithfield Map: Section 1; Section 2; Section 3; Section 4; Section 5; Section 6. 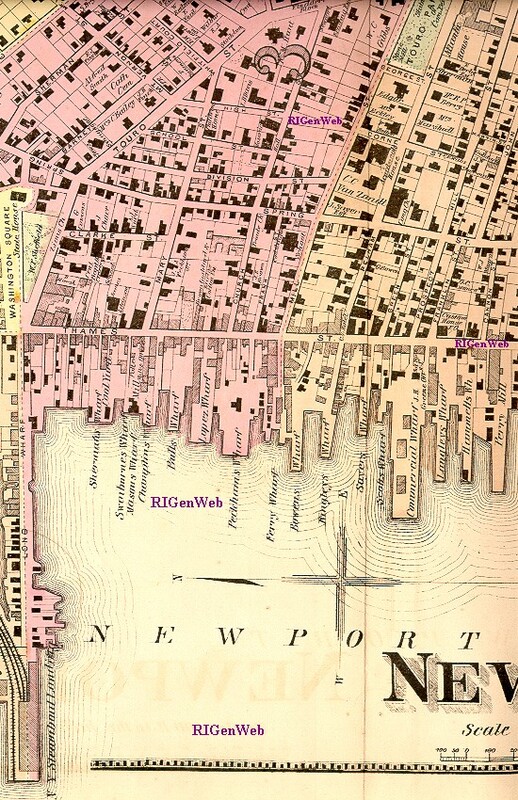 All images, unless otherwise noted, are copyrighted 2000 by Susan Pieroth. 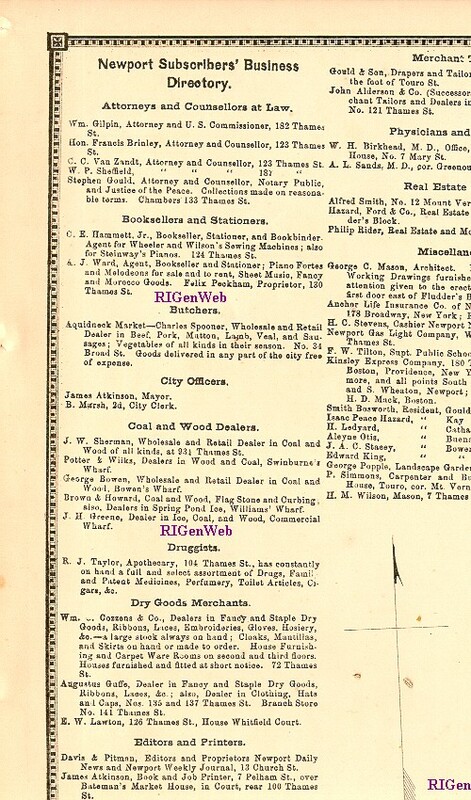 They are for individual research use only. 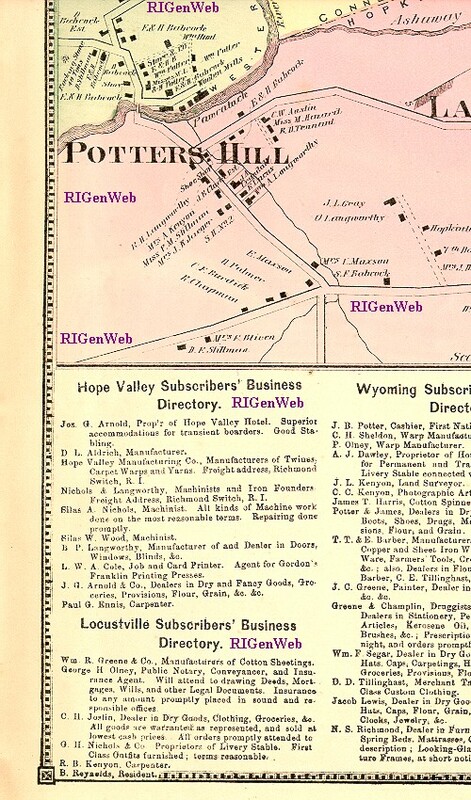 They may not be copied to other web pages or otherwise published. 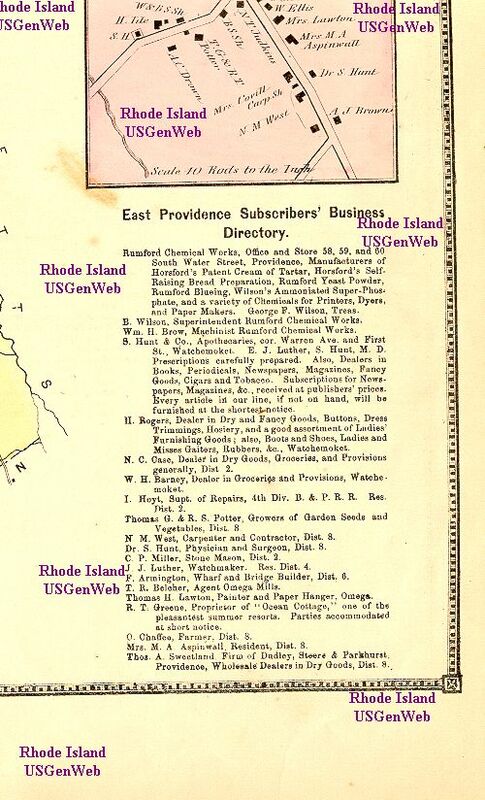 US Census Bureau Statistics for Rhode Island. 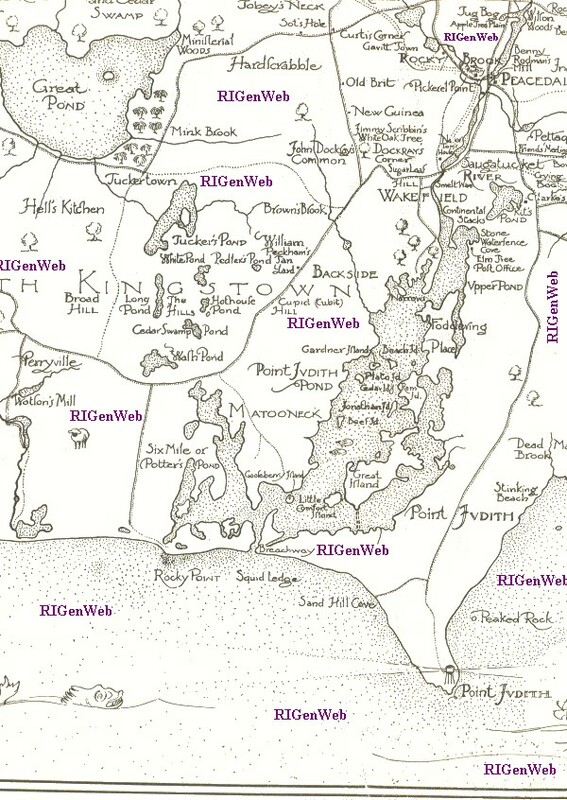 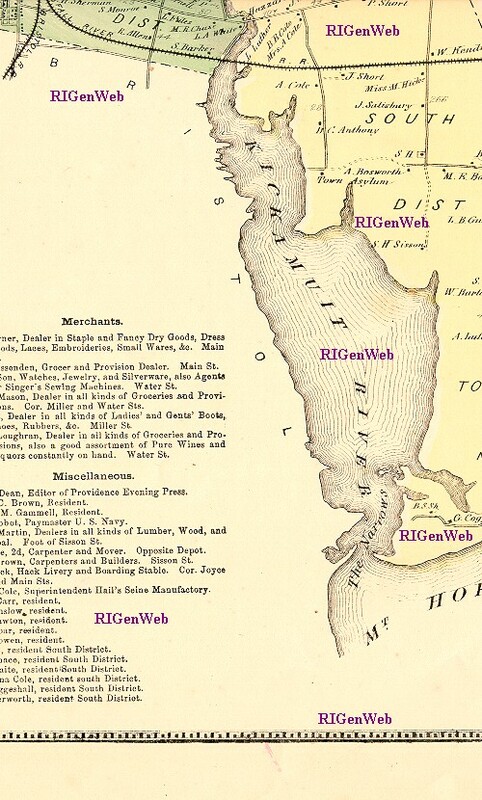 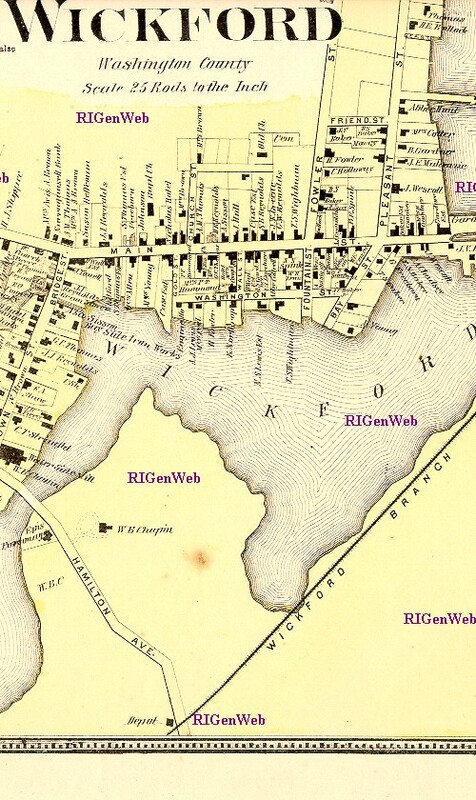 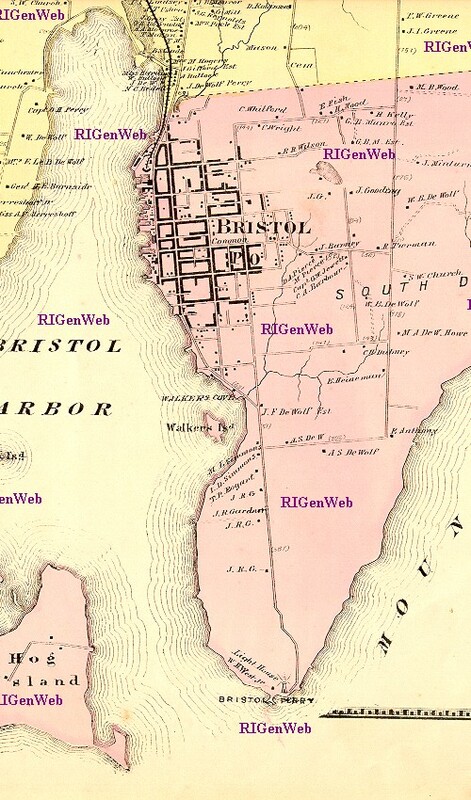 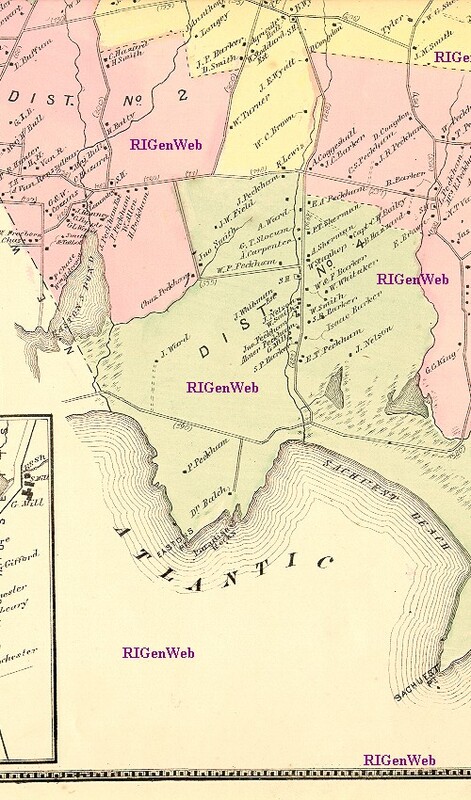 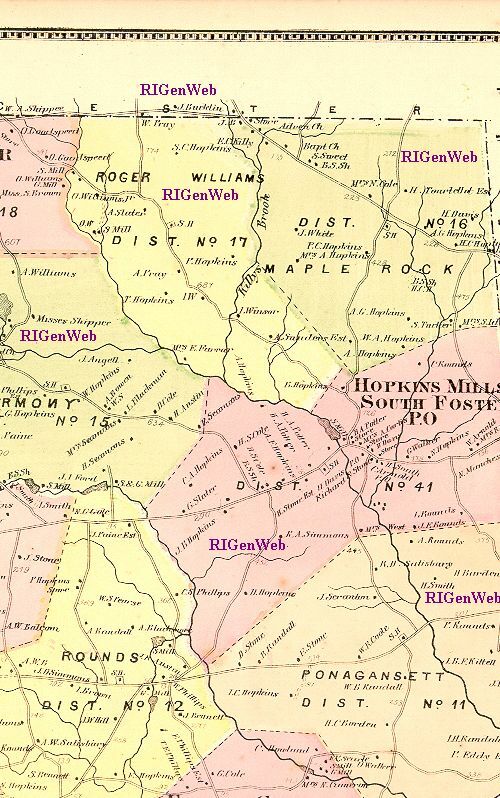 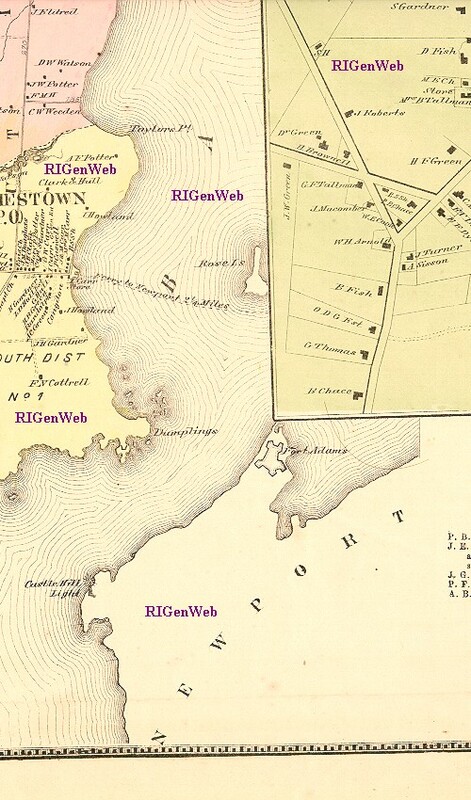 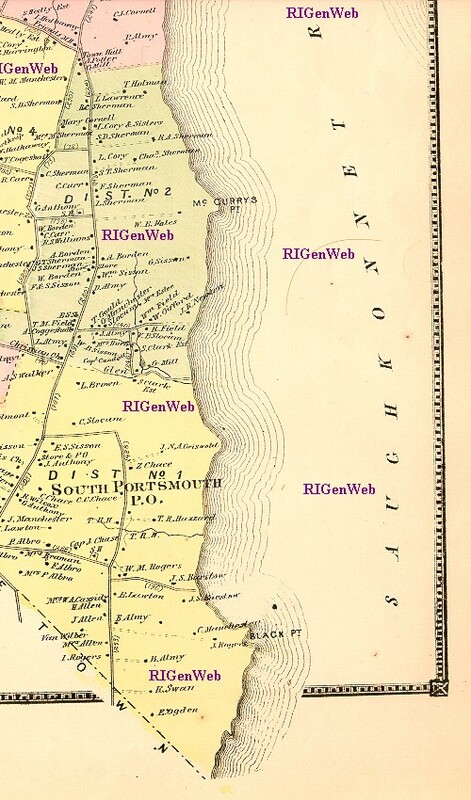 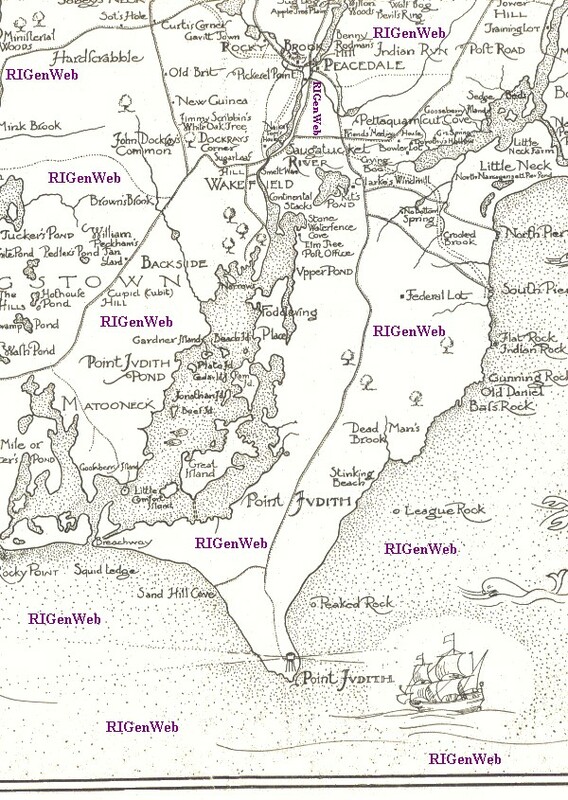 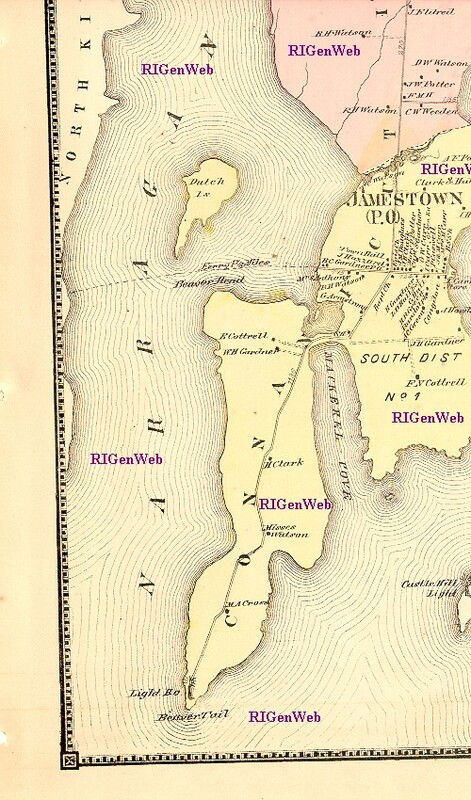 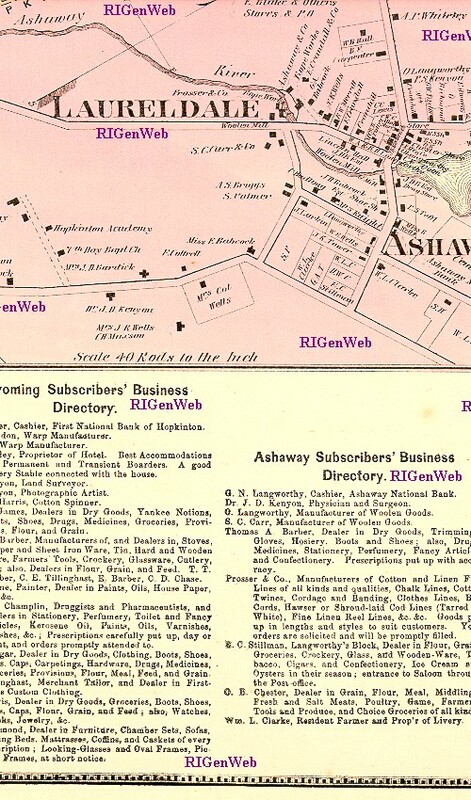 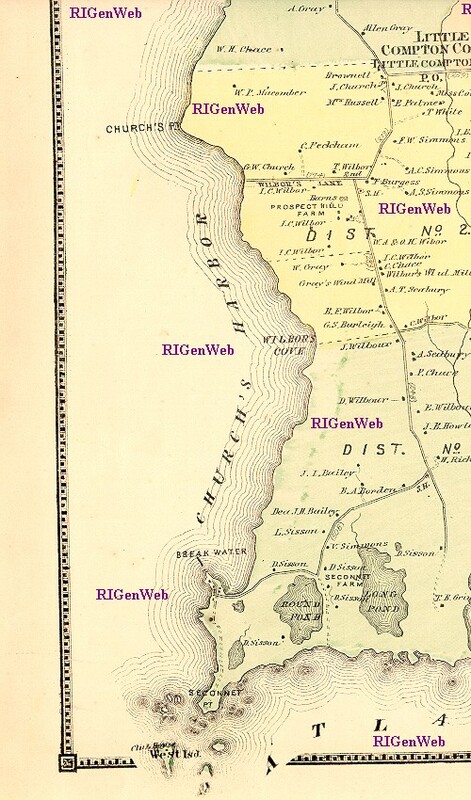 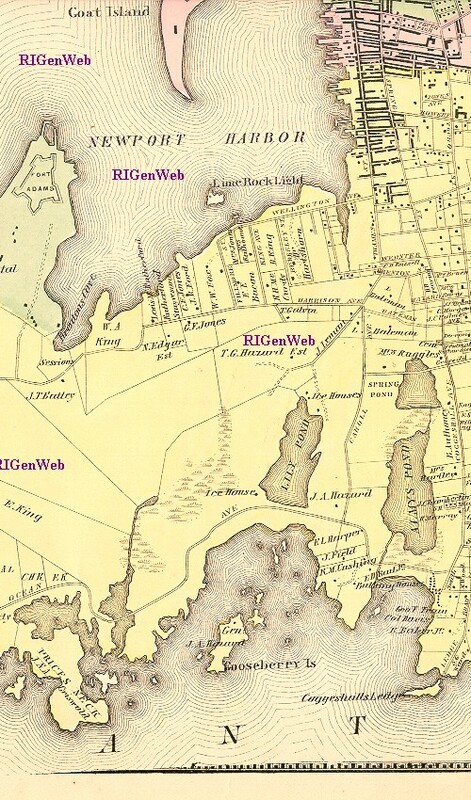 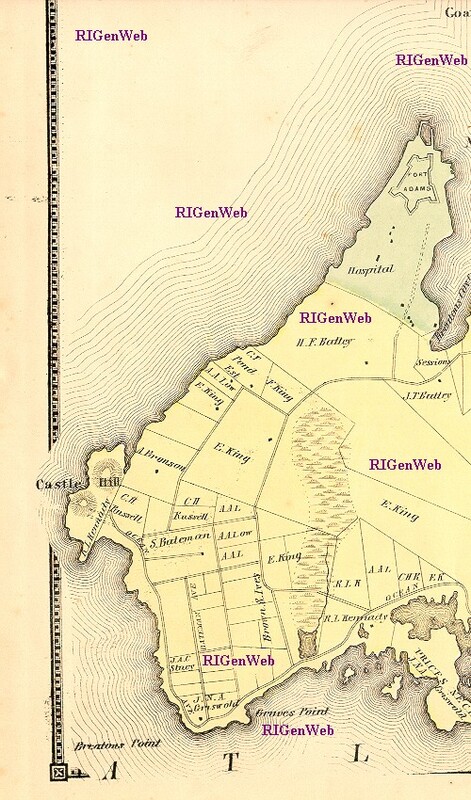 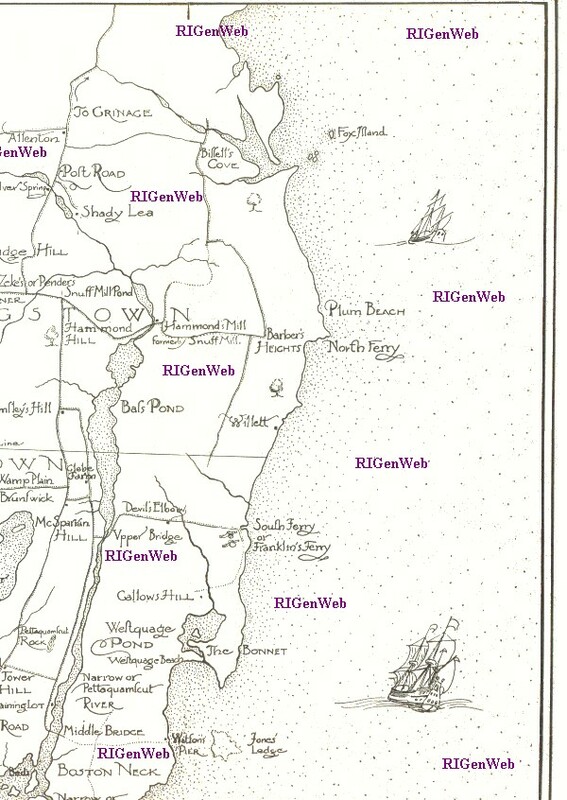 Map links & RI Data Centers. 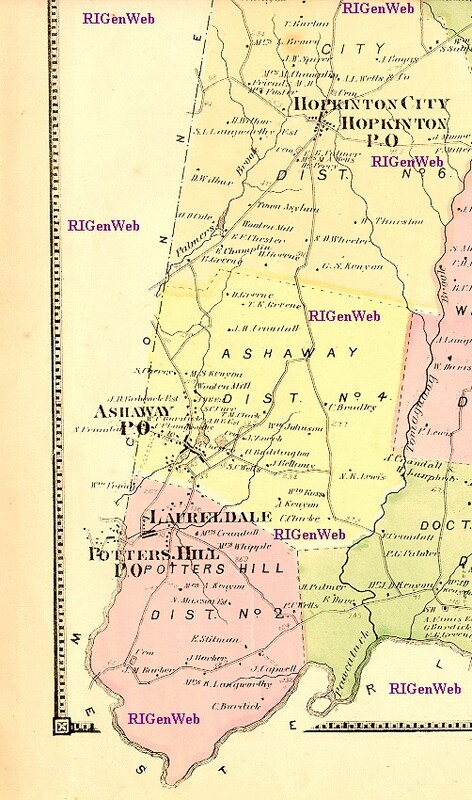 University of New Hampshire Government Documents Department and Data Center.